1 Comment Posted in Gardens of Ireland, Gardens of the World Tagged "County Wicklow" Ireland, "Mount Usher Gardens"
1 Comment Posted in Eire, Garden Flowers, Gardens of Ireland, Gardens of the World Tagged "Altamount Gardens", 'County Carlow"
I had looked forward to visiting Kylemore Abbey and Walled Gardens in Connemara for a very long time. It did not disappoint. I’ll cover this place in more depth later but a few photos will give you some idea. It’s special. Blue Sky !!!! A rarity in Ireland this summer. For once we had a sunny day. The locals were hailing this day as ‘ summer’ so we made the most of it. 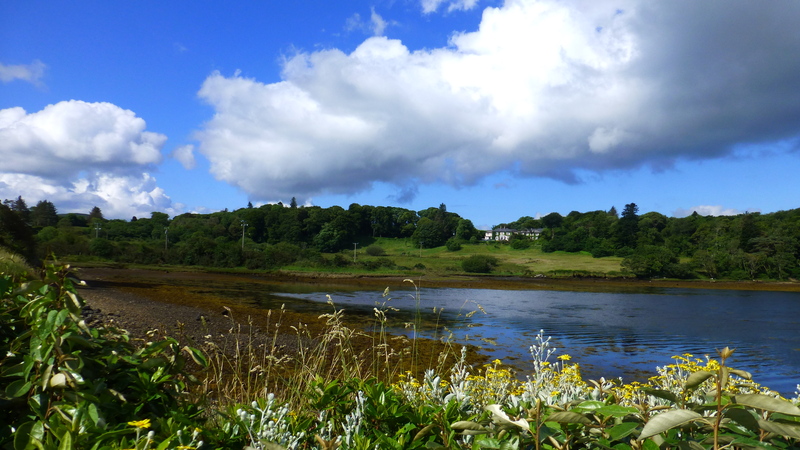 The photo above was taken on the way to the abbey along the shores of one of the many indentations of the sea here – this one near the lovely village of Letterfrack. low tide. 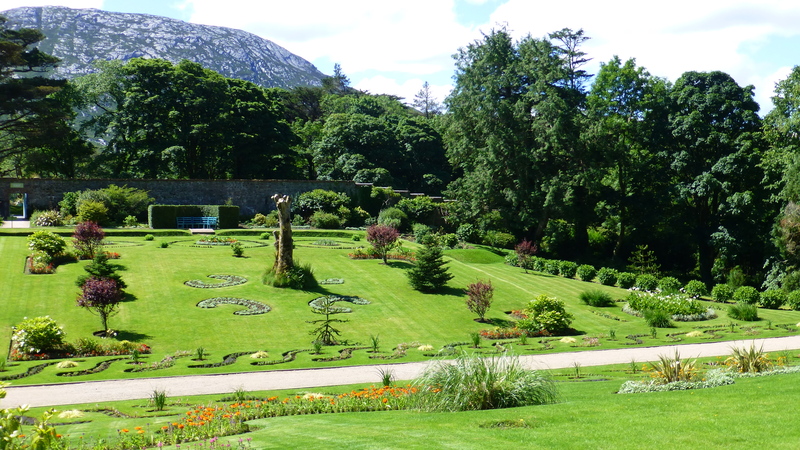 The story of Kylemore – both as a Castle and more recently as an Abbey and school – is a truly remarkable one. Twists of fate have marked its history from its beginning to the present day making for a colourful history. 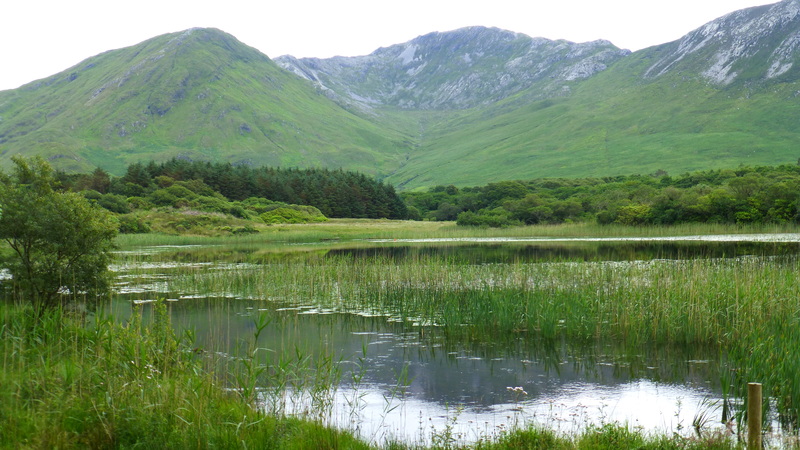 Nestled at the base of Druchruach Mountain (1,736ft) on the northern shore of Lough Pollacappul, in the heart of the Connemara Mountains, The Abbey is regarded as one of Ireland’s most romantic buildings. 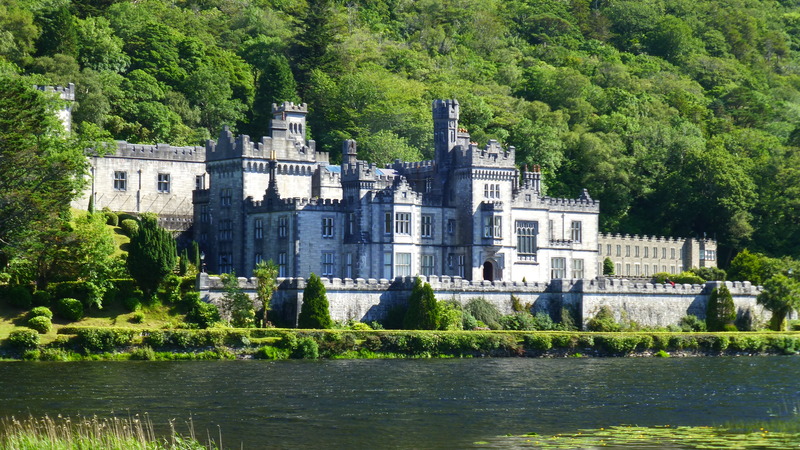 Originally built in 1867 as a romantic gift, Kylemore Abbey and the surrounding mountains and lakes are steeped in history including engineering initiatives, model farms, tragedy, royal visits, gambling debts, a hideaway during Ireland’s troubled history as well as, until very recently when the school closed, excellence in education. 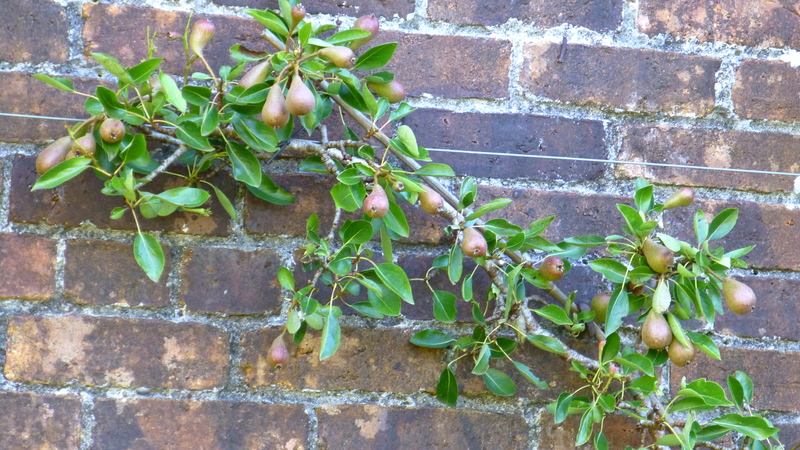 Pears on one of the espaliered fruit trees. One good thing about this garden is that the fruit, berries, herbs and vegetables grown here are used by the chefs in the kitchens of the cafe and restaurant – and the food is really fresh and good. The nuns also use food from the gardens for their one use and they make jams and chutneys for sale. It’s not just a show garden. 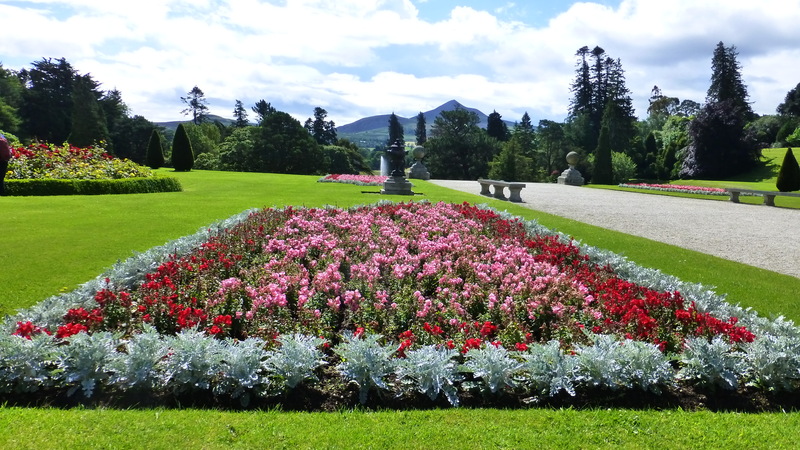 A newly planted section of the formal gardens – all very neatly sculptured. 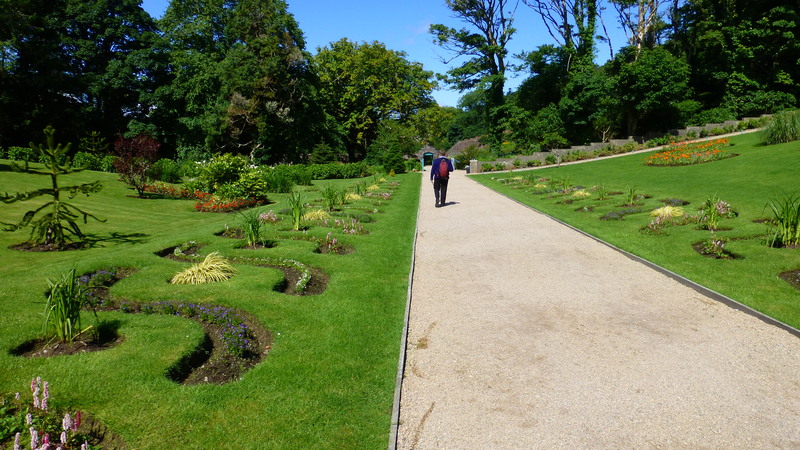 The gardeners were mowing this area – what a job to mow and clip around all of these designs! 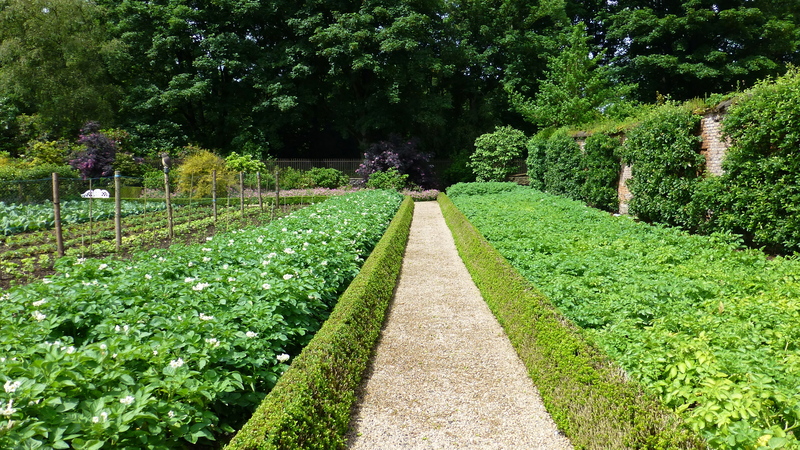 A long avenue of perennials divides the two sections of kitchen garden with backing hedges screening the view of the veggies from the aristocracy of the day! 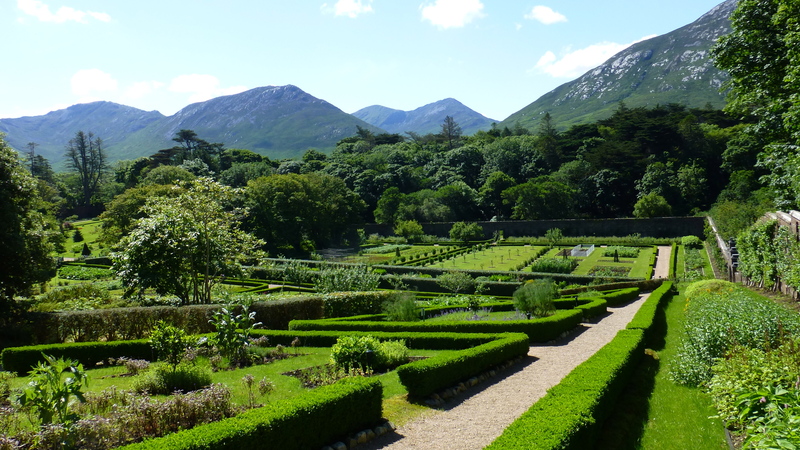 Looking down hill across both sections of the vegetable kitchen garden seen with the Connemara hills behind. 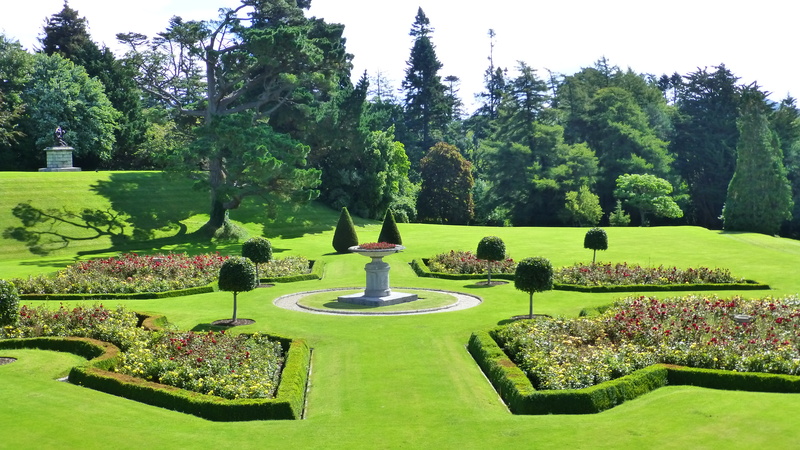 Looking down across the formal gardens. 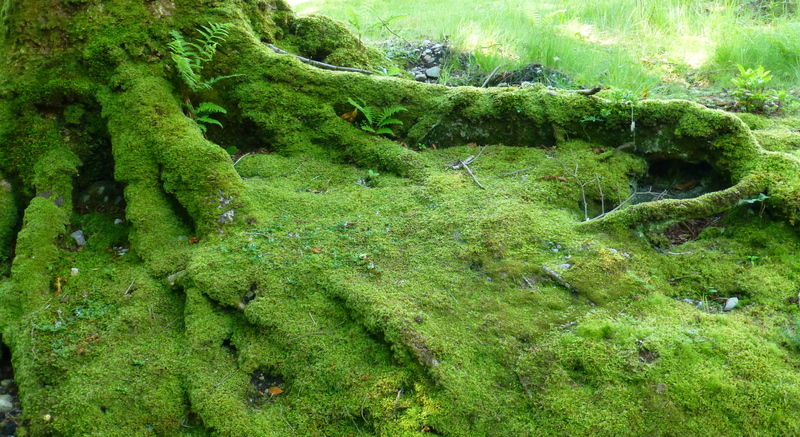 Moss covered roots on very old tree at garden gate. Reflections in a small lough on the 2km walk back from the garden to the abbey. 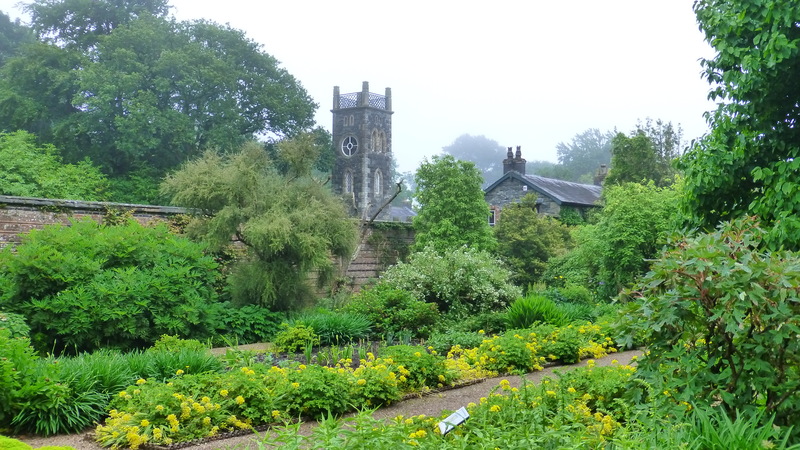 More on this garden, Abbey and it’s story after we get home again. 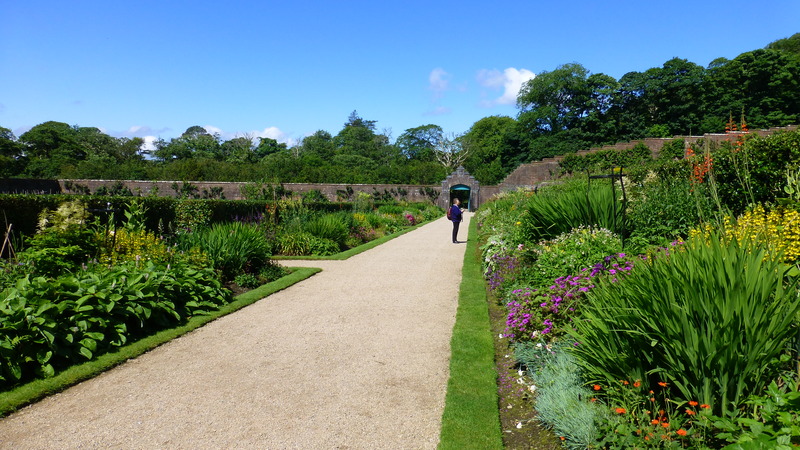 The kitchen garden area of Rowallane Walled Garden. 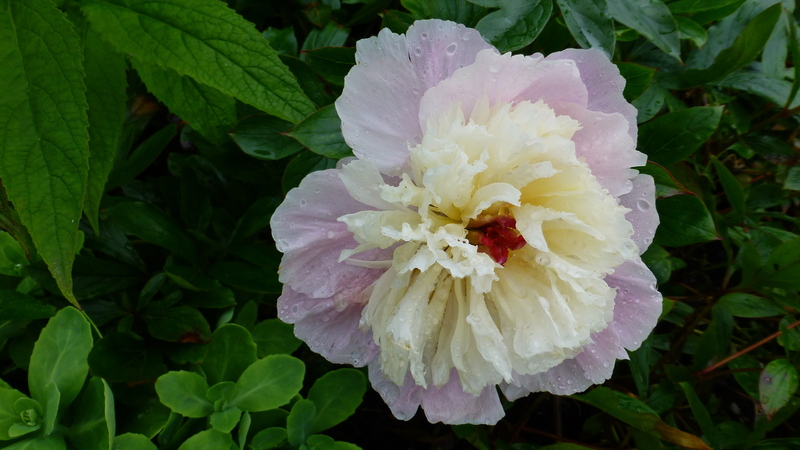 The delicacy of a peony in a shower of rain. 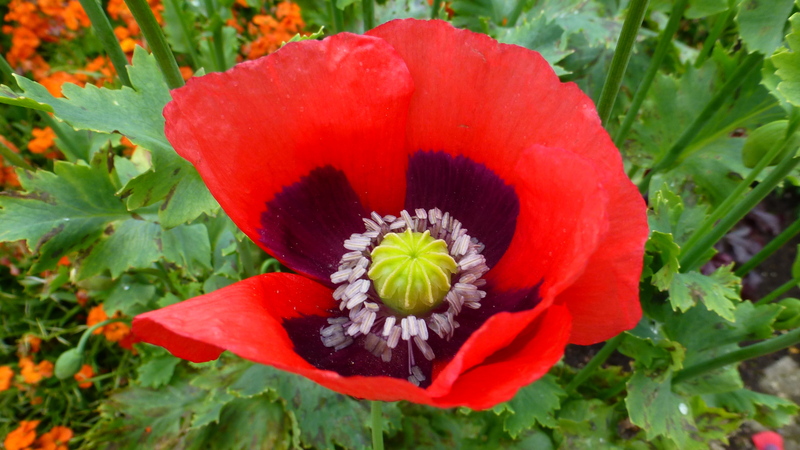 The rain may have bowed this Nepalese Poppy but it could not spoil its beauty. In the damp parklands at Rowallane there were plenty of fungi. 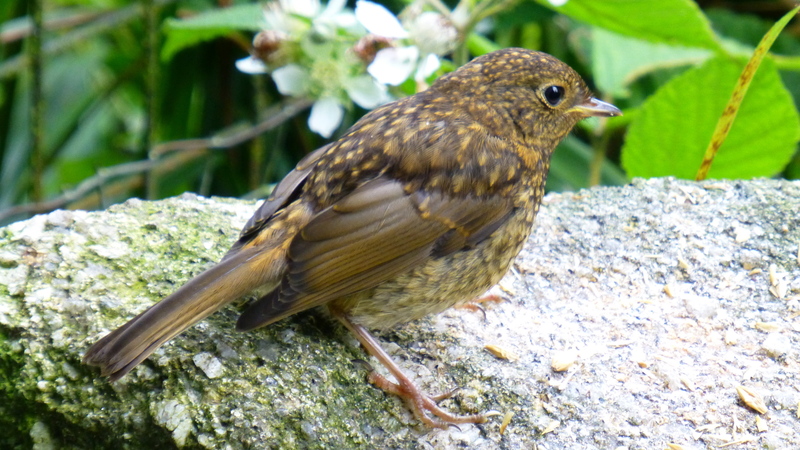 This little robin was totally unafraid of us – a special treat. 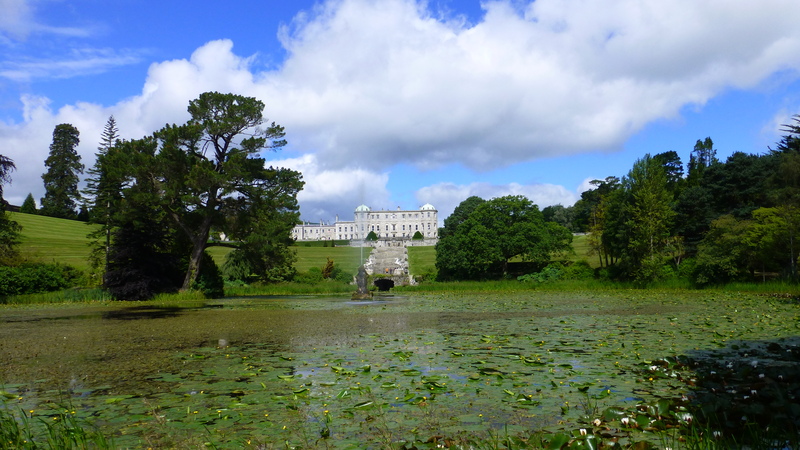 Mount Stewart Gardens – lake and park area with family mausoleum on hill side. 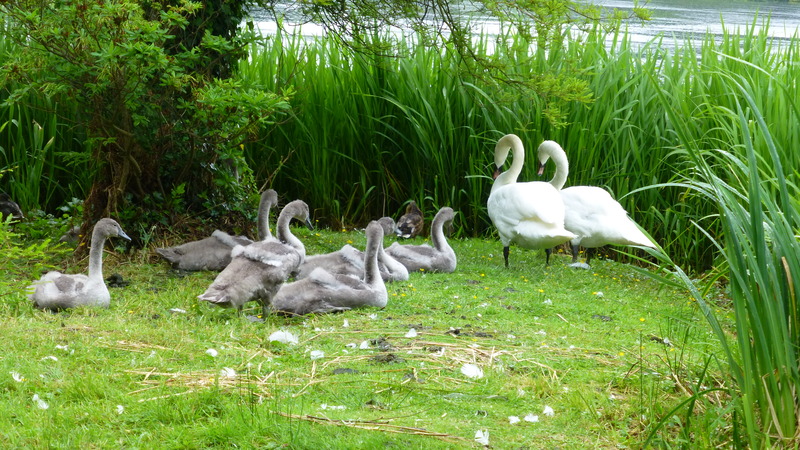 Swans and cygnets by the lake at Mount Stewart. 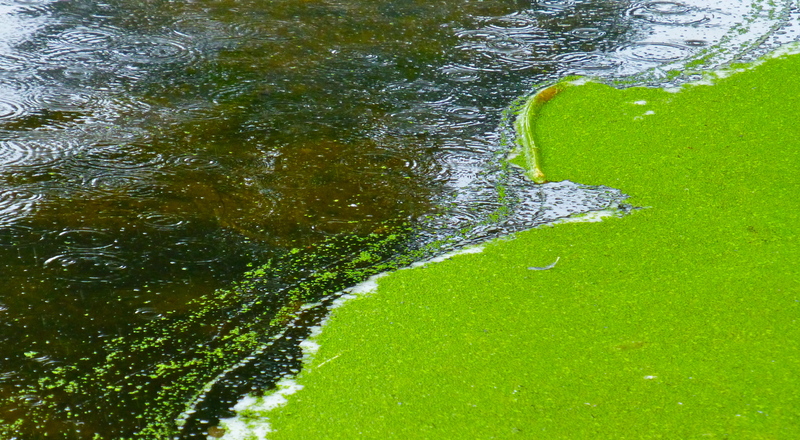 Abstract of raindrops on water and green algae at lakes edge. A lovely iris by the water’s edge. 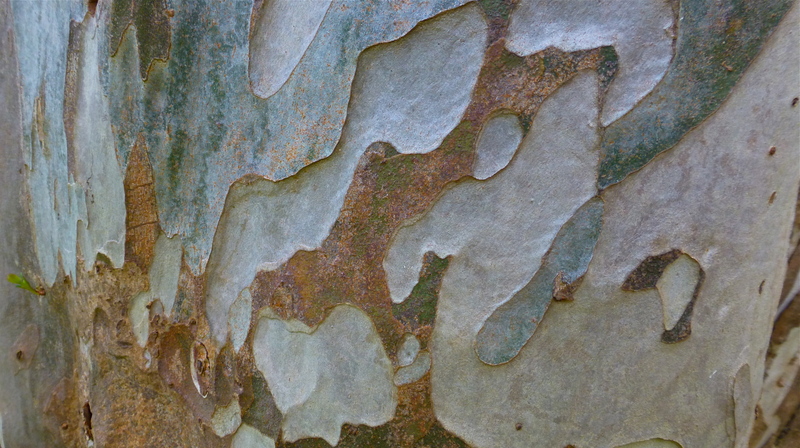 Even in a park of large trees, the delicate hand of nature can still be found. 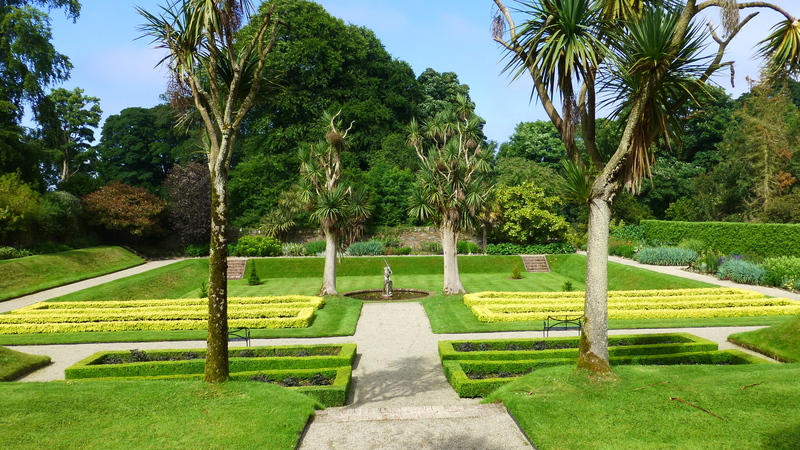 Formal gardens at Mount Stewart House. Views across green farms on our narrow country road explorations. Hedges of fuchsias line many small country roads. 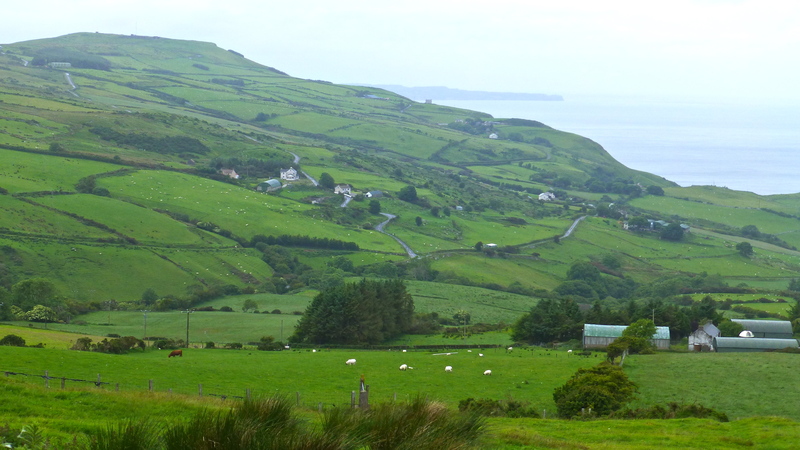 Coastal views of farm country from the very narrow, twisting, winding, steep hilly road to Torr Head. It was an experience! 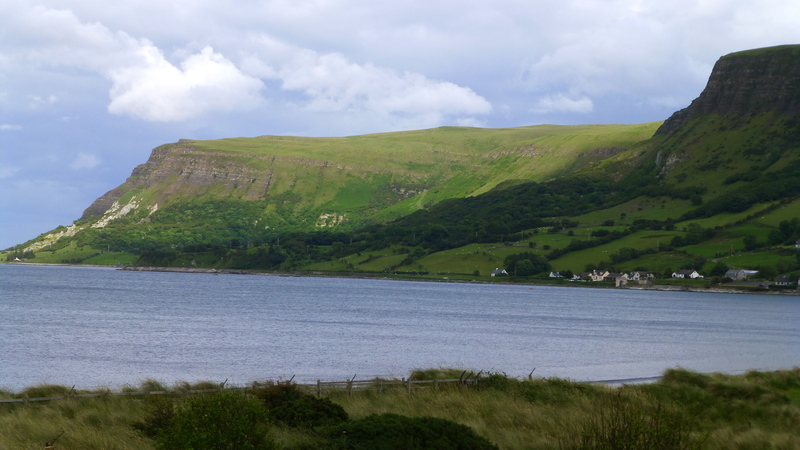 Views from B&Bs like this one by the sea at Glenariff. 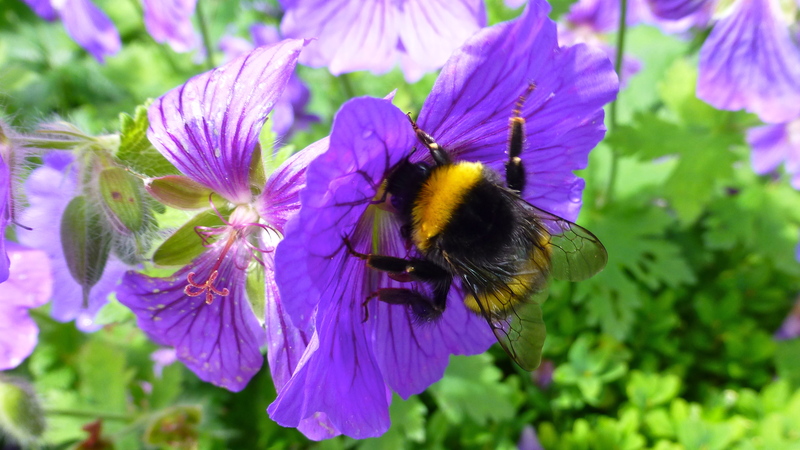 Bumblebees in geraniums – they were everywhere – a delight. 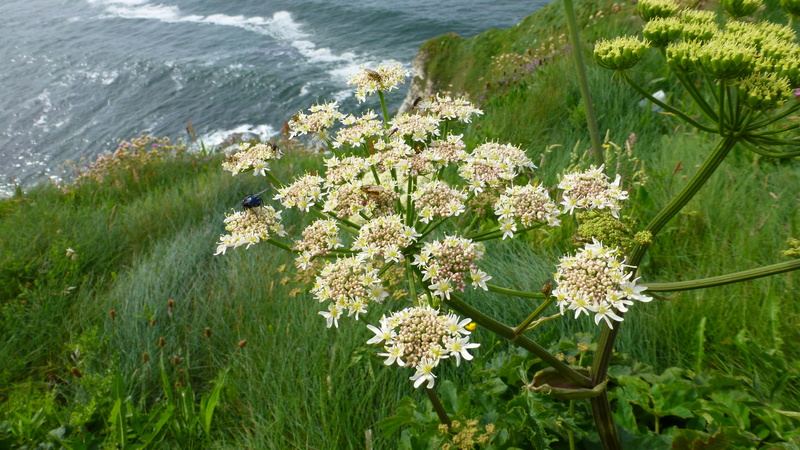 Wildflowers on cliff paths by the ocean. 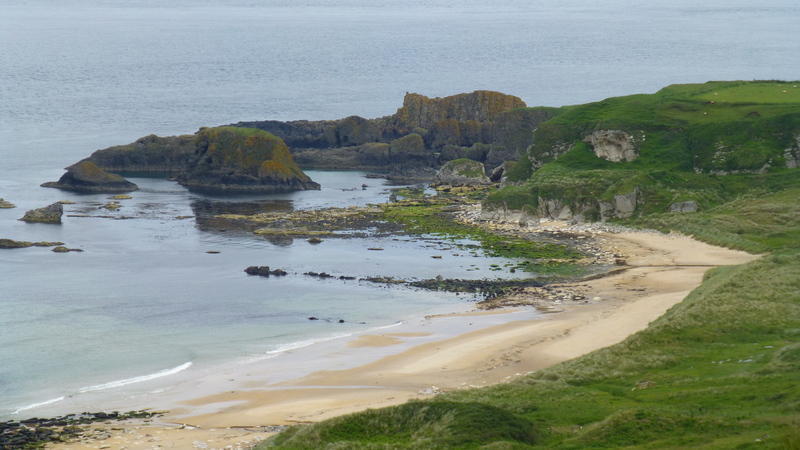 Looking down on rocky cliffs along the north coast. 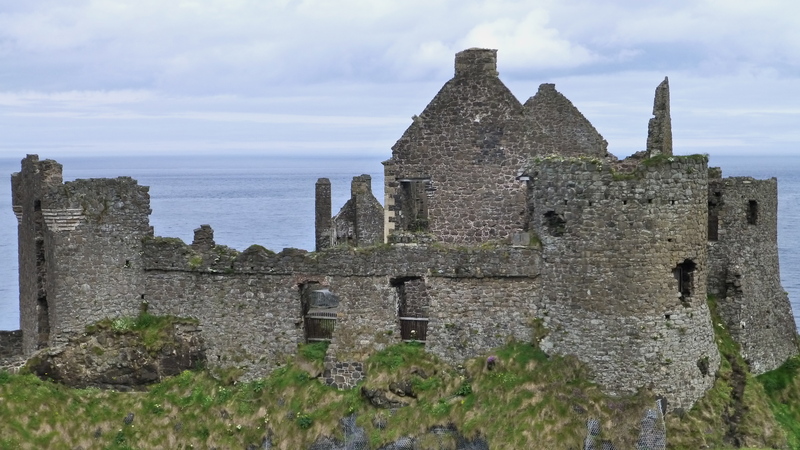 Old ruins of castles like Deluce Castle. 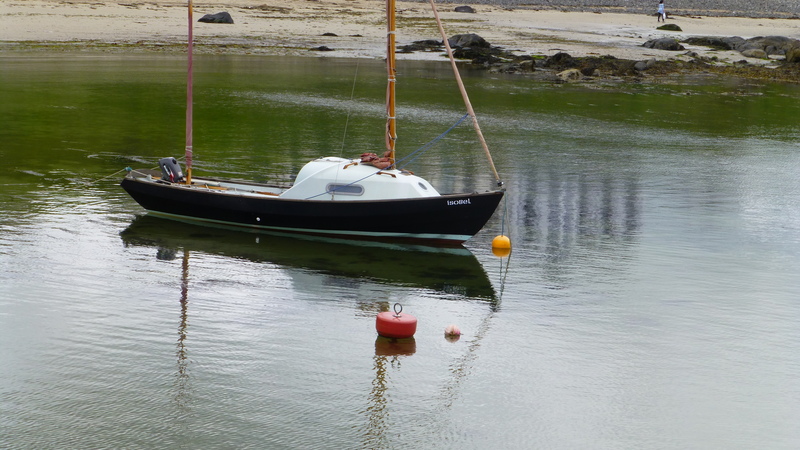 Small sailing craft lay at anchor in quiet bays – this one called Isobel. 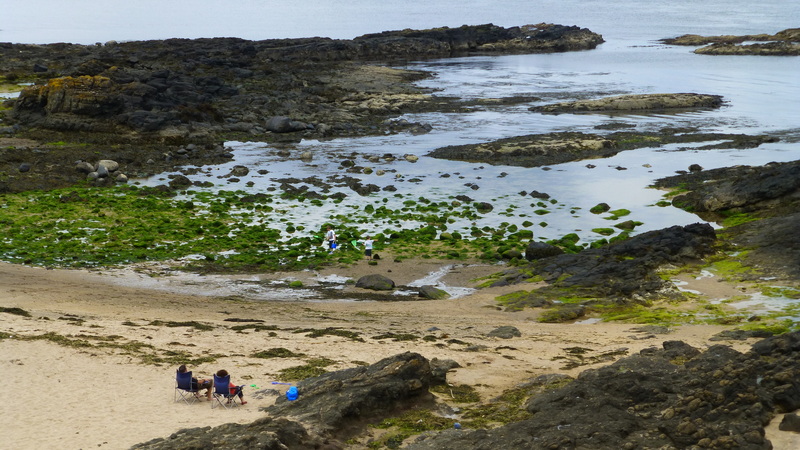 Families enjoyed the quiet places along the coast despite the weather – here at Portballintrae. Beautiful hedge roses grow alongside many small country roads. 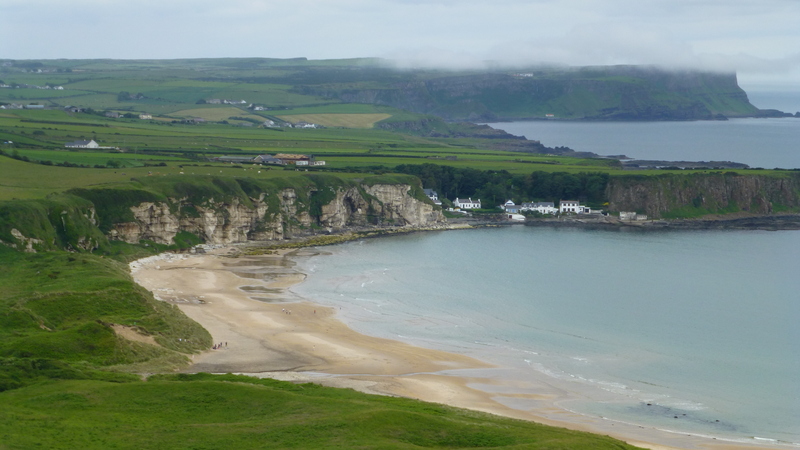 Tiny villages are tucked into safe bays along the north coast. 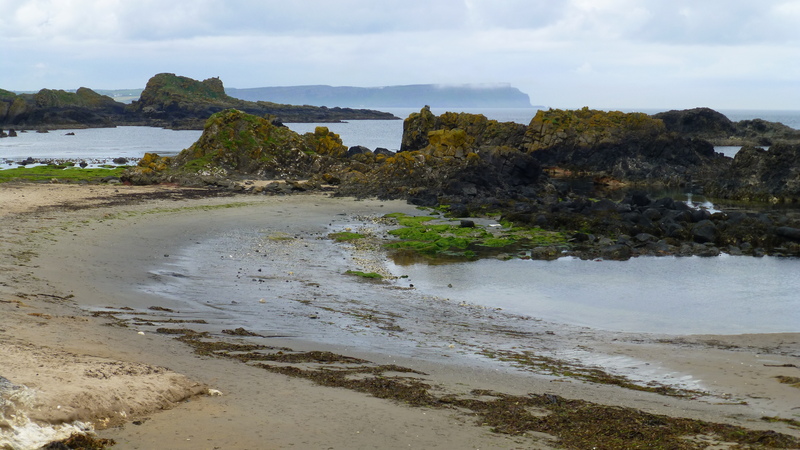 Very occasionally, a sandy beach is protected by a rocky outcrop – this one at Ballintoy. 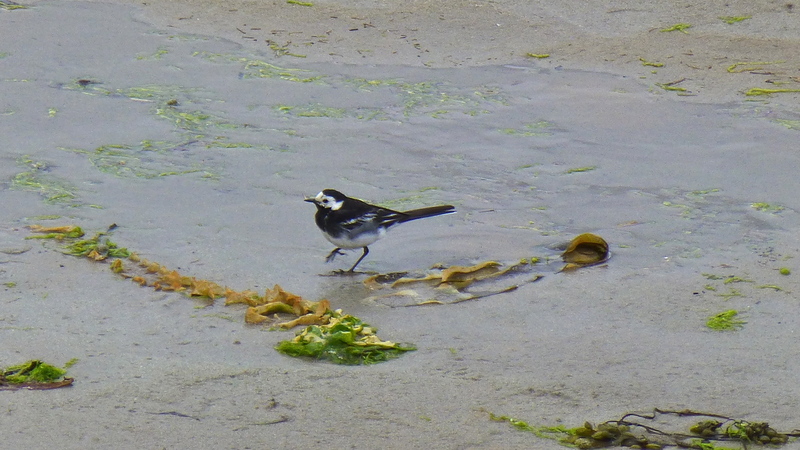 A tiny pied wagtail chases insects at Ballintoy beach. 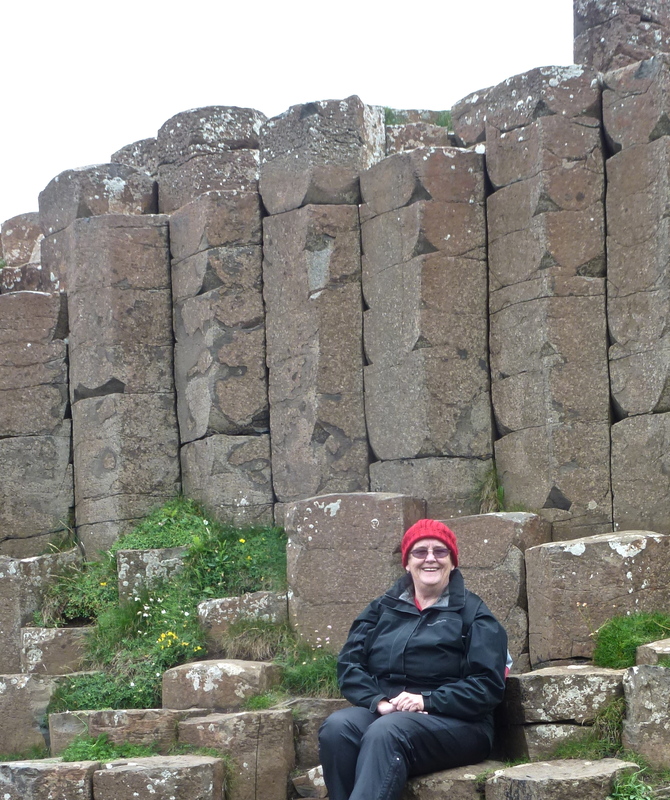 All rugged up against wind, rain and cold (in summer) at Giant’s Causeway. 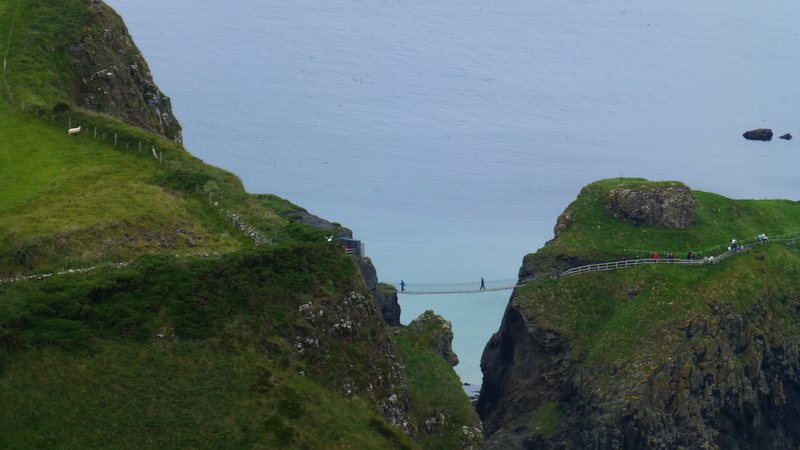 We watched from a safe vantage point as others cross the infamous rope bridge. 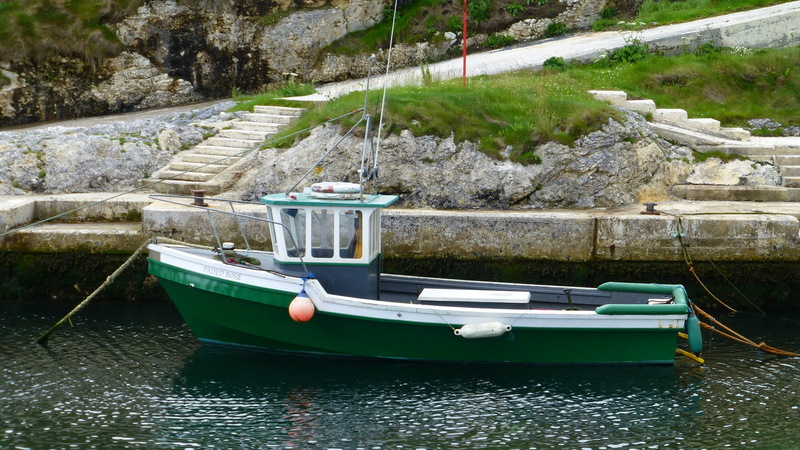 Small fishing boats seem far too fragile to take on the seas out from these northern bays. Interesting skies always hailed the end of each day. 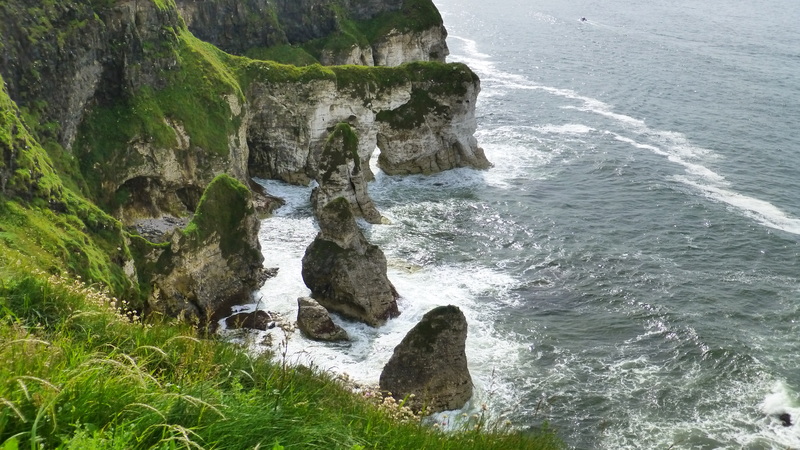 And that ends this small roundup of photos from our wonderful time in Northern Ireland. 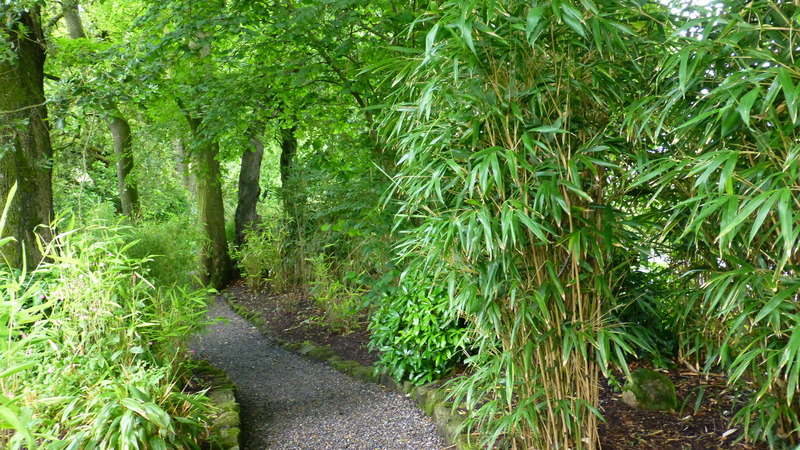 Benvarden Garden has won this year’s Northern Ireland’s top award for a privately owned garden. That doesn’t mean that it’s your average home garden. Far from it. 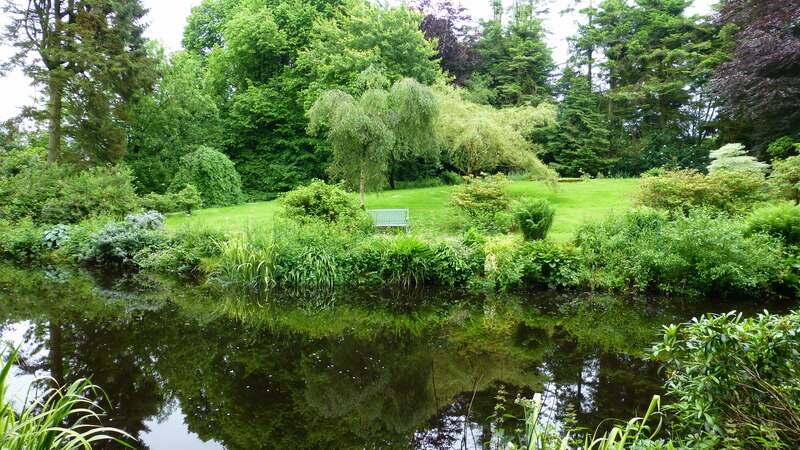 This garden and park belonging to a large property near Coleraine on the north coast. 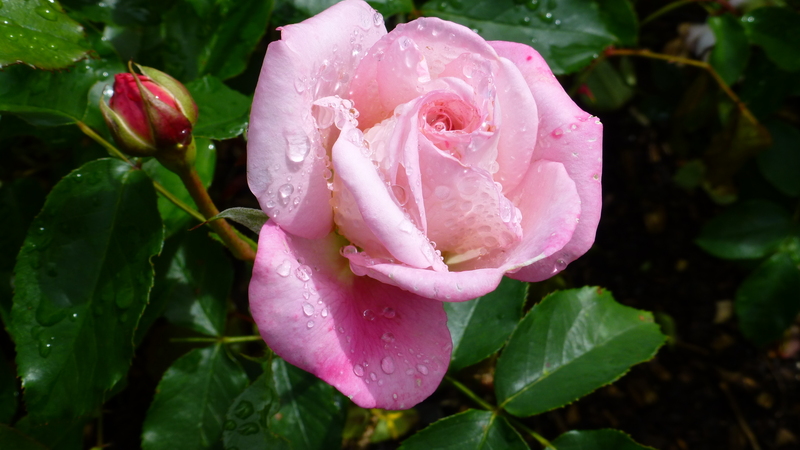 It was a pity that in the past week there has been torrential rain in the area and many of the plants have suffered. 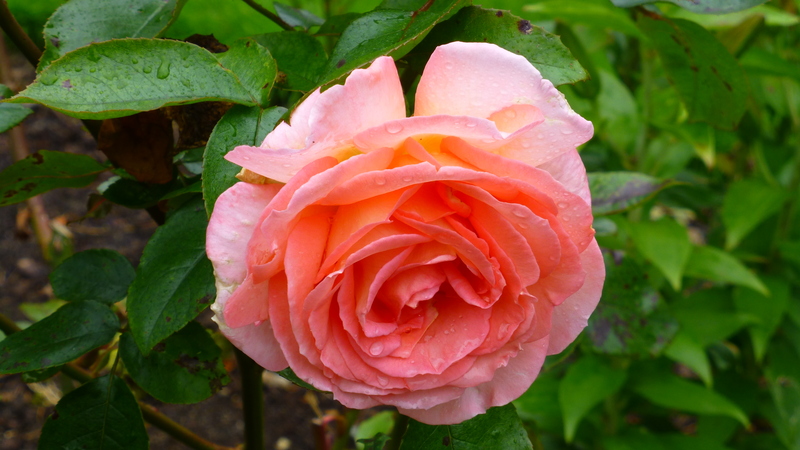 The large rose garden was particularly hard hit and the park area was very boggy. 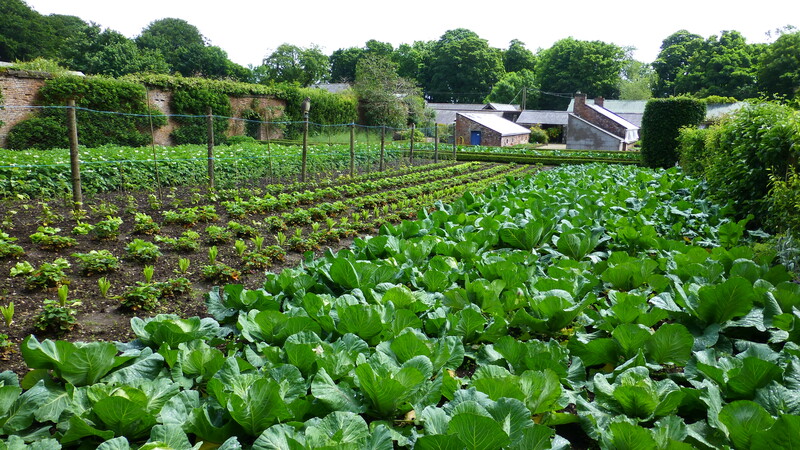 But the vegetable garden was the best we have ever seen. Oh to have been able to enjoy the veggies and fruits from this garden. 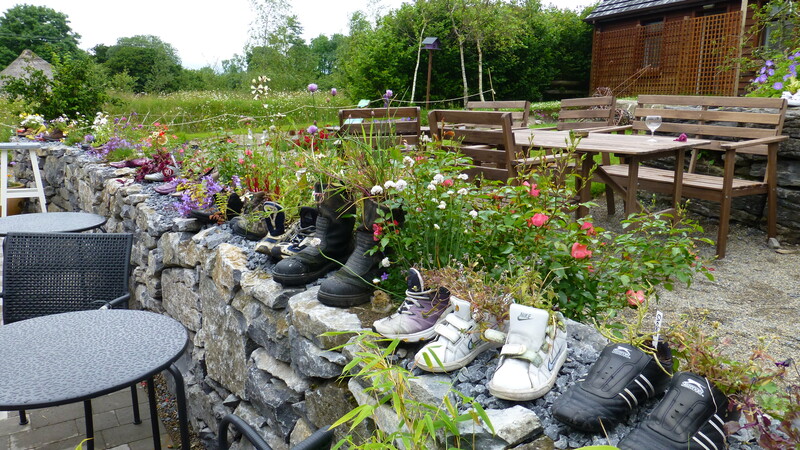 So herewith a few photos to give some idea of this special garden. 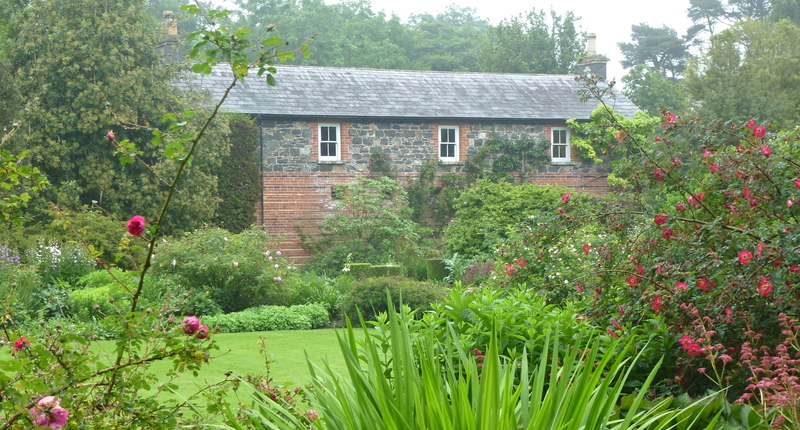 Old building at the entrance to the kitchen garden. In days gone by the kitchen garden ‘boy’ slept in a tiny room at the end of this building. Now it houses the gardener’s tools. 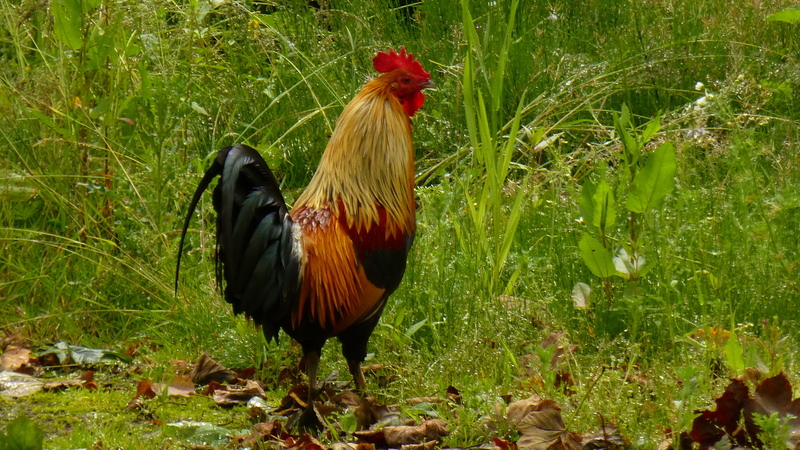 Chooks range freely round the grounds with this fellow as master of the lot. Cabbages with not a white butterfly to be seen – they were perfect. 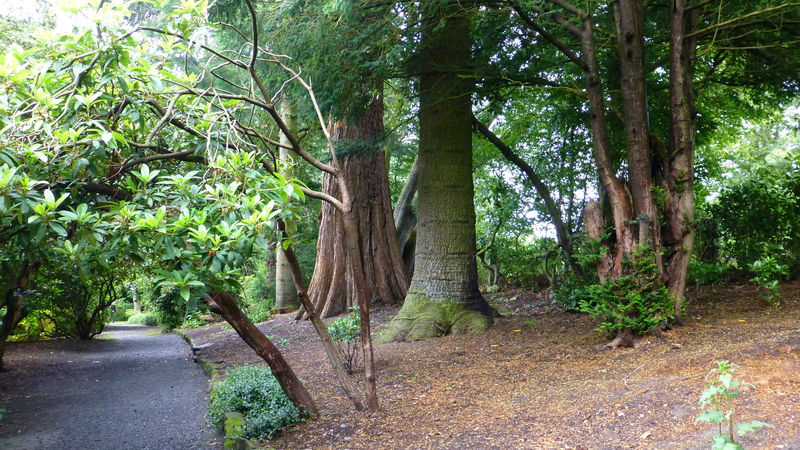 A sheltering bank of trees and shrubs behind the kitchen garden. 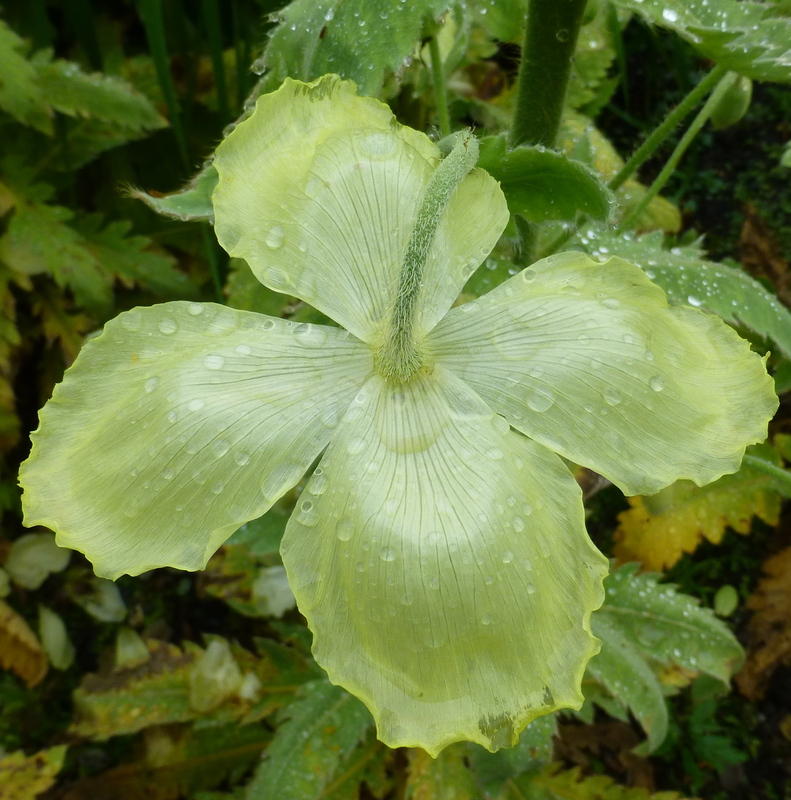 Attention was paid to combining plants with a variety of textures and a variety of greens with a contrasting coloured plant to give some oomph..
Raindrops on Lady’s Mantle – always a delight. 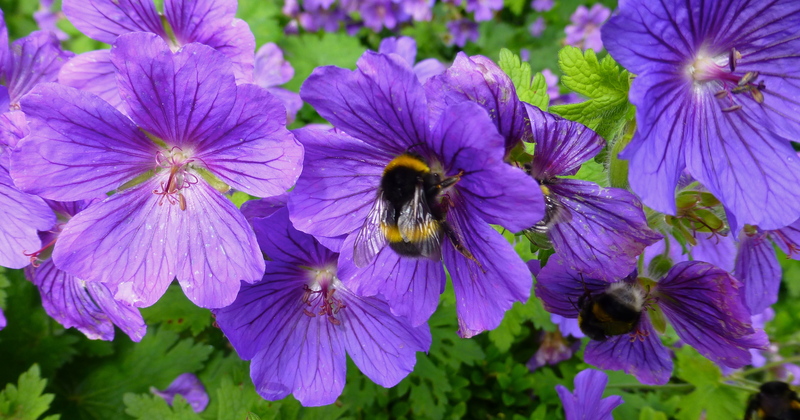 Large bumble bees were everywhere enjoying a summer feed. 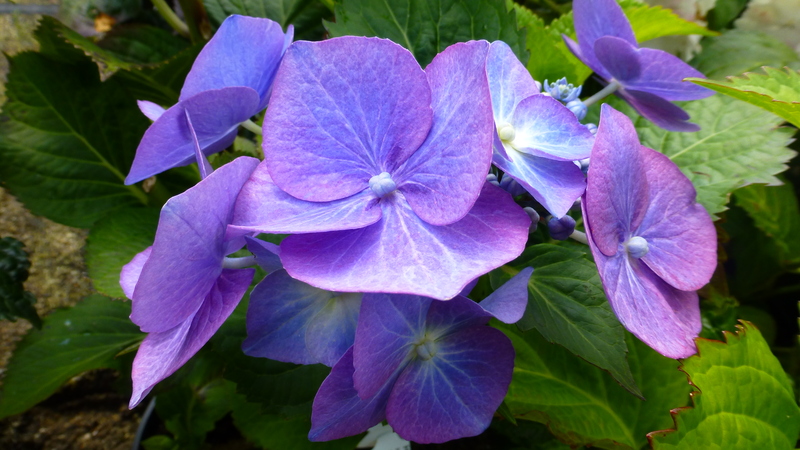 Strong coloured flowers were used judiciously to give relief to what is basically a green garden. But as there are something like 700 greens, a green garden is not at all boring especially when there are so many textures of leaves to use. 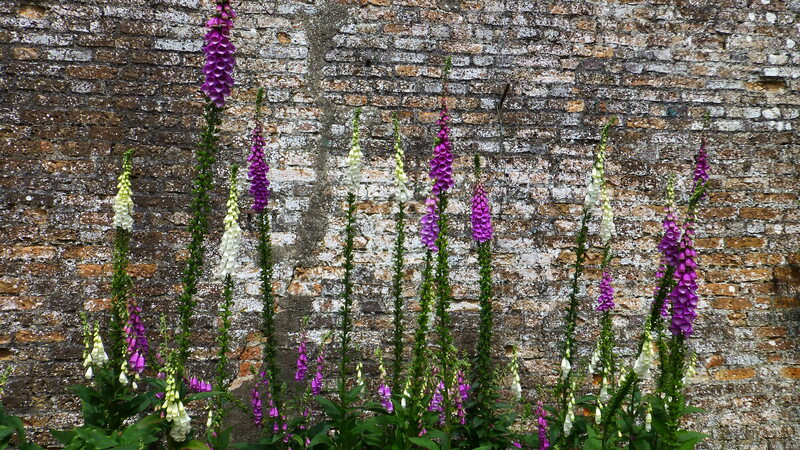 Foxgloves made a statement against the old wall of the garden. 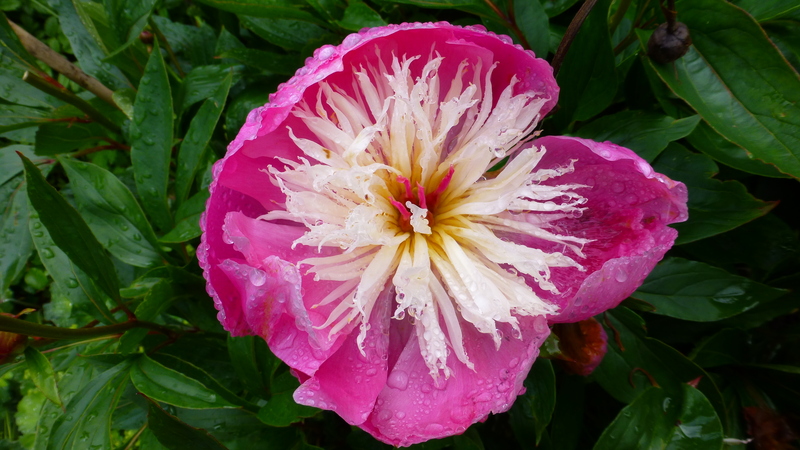 Peonies were hard hit by the rain but this one was in a more sheltered spot. 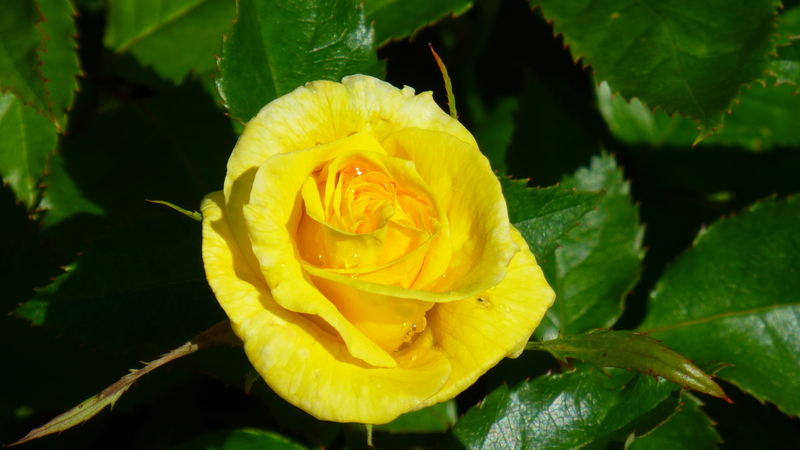 The rose garden was decimated but a few survived in sheltered places. 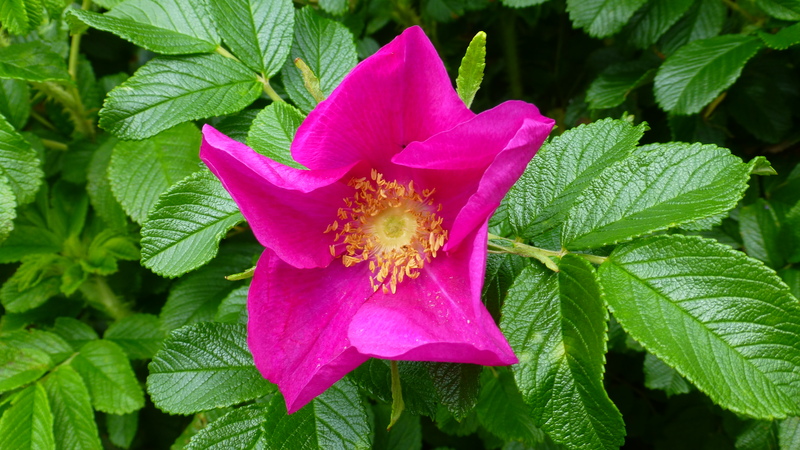 Another rose surviving in a sheltered spot. 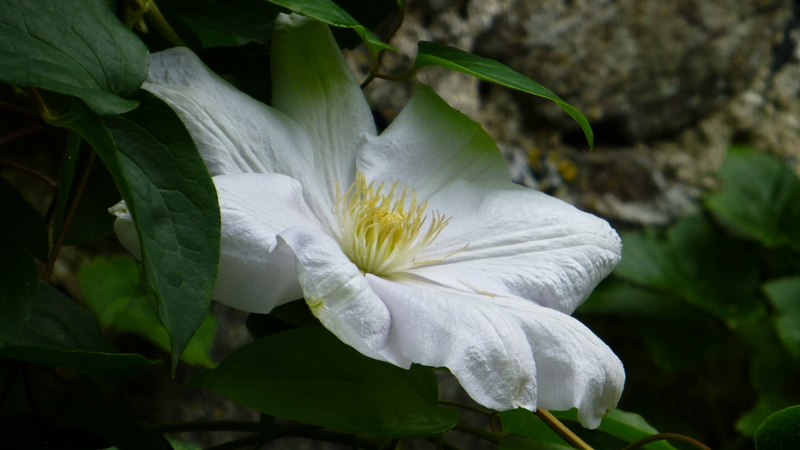 This clematis was hidden behind a tree – it survived without a blemish. 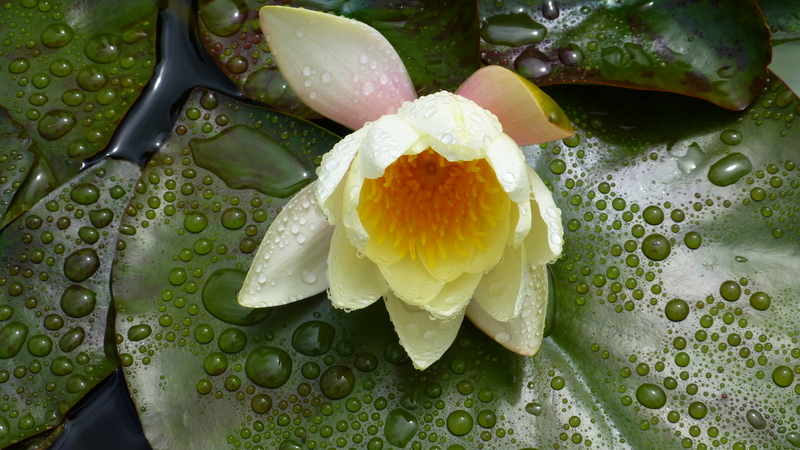 The rain had no effect on the lily pond in the centre of the rose garden! 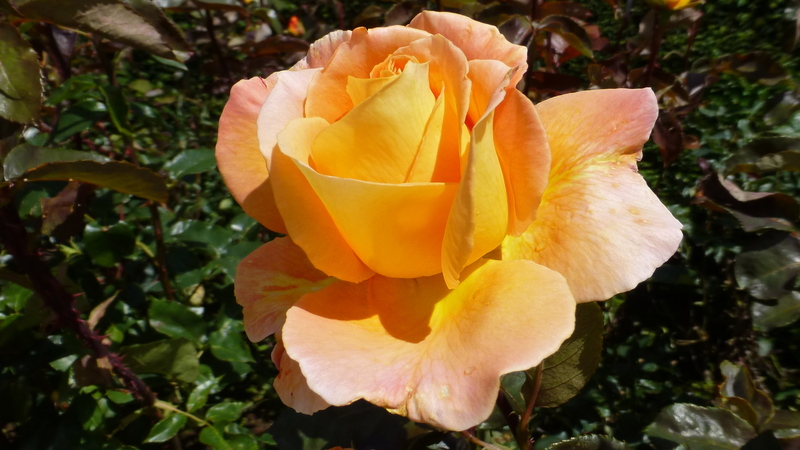 A rose bower on the path to the tennis court. The court itself was neglected. A Pity. 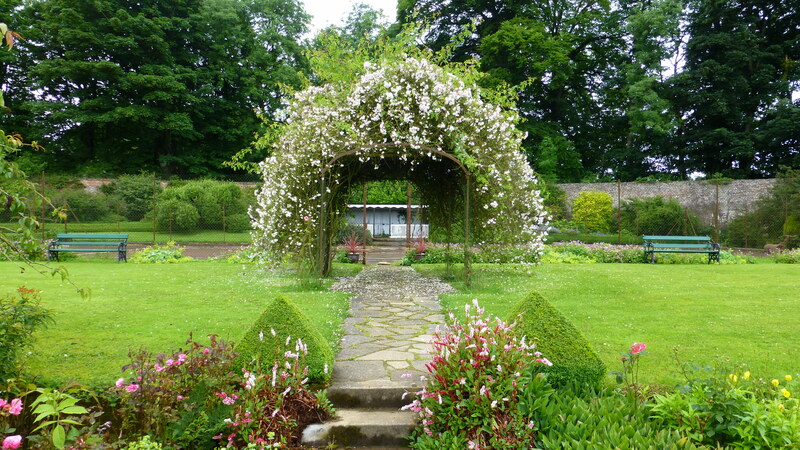 A honeysuckle bower led to the large park area beyond the walled garden. Most of the honeysuckle had survived the rain. 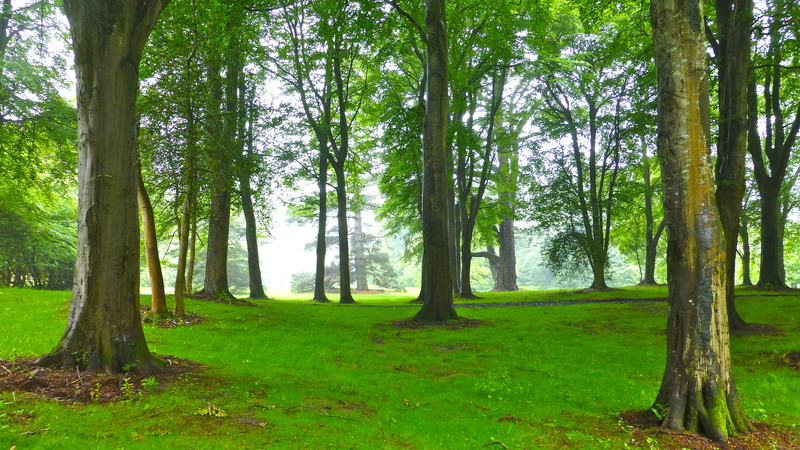 A large section of the park lands was reserved ‘private’ for the manor house. 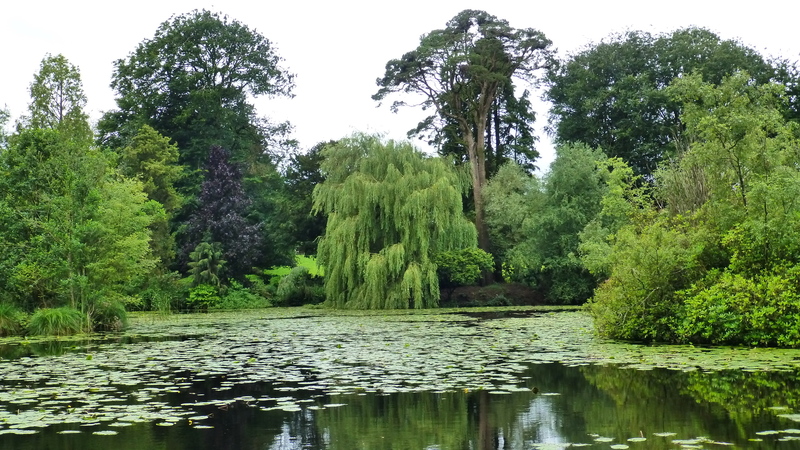 The pond area was available to the visitor – but much of the park was too boggy. to enjoy the reflections in the pond was worth the walk on a very muddy path. 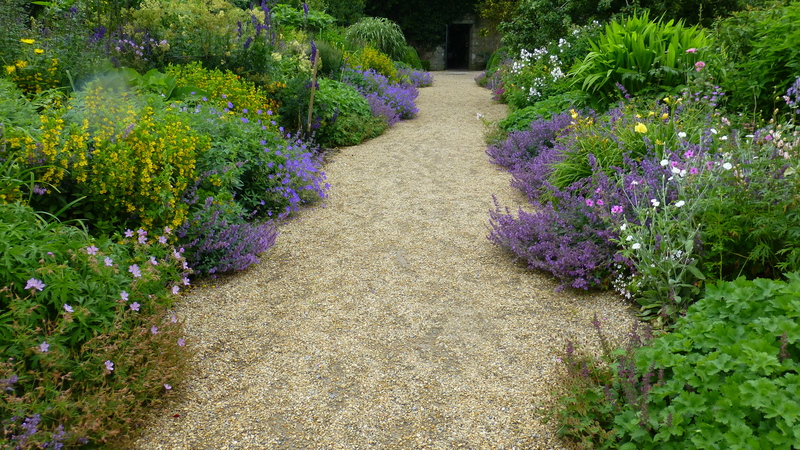 The only dry path lead us back to the farmyard buildings and cobbled courtyard. 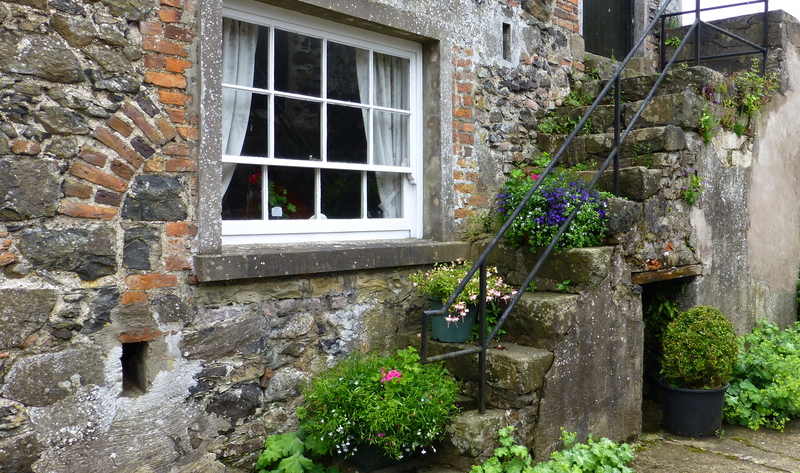 Unsafe stairs on old buildings were used for pot plant displays. 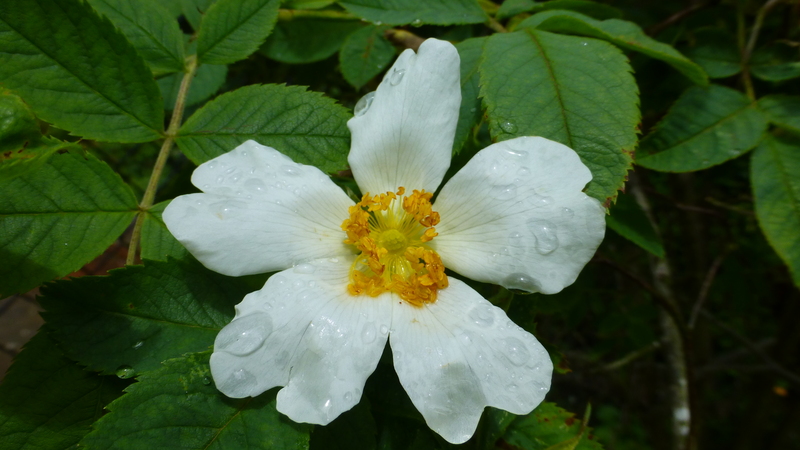 And back in the car park, a rambling rose. 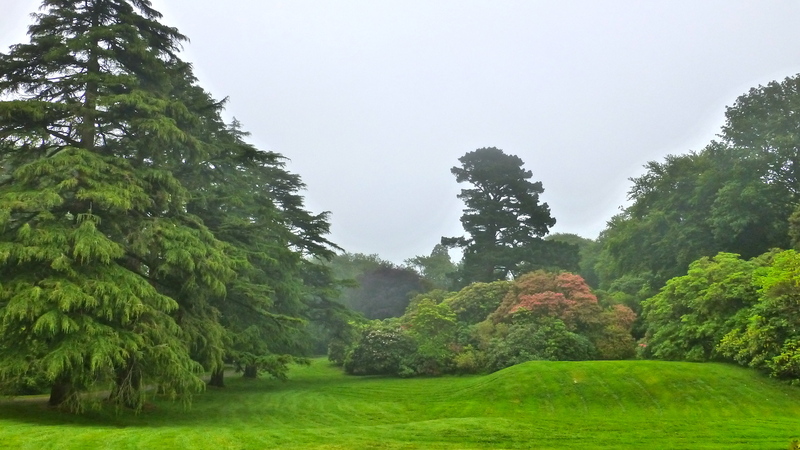 We hope you have enjoyed this visit to Benvarden Garden – even on a showery day after a stormy week, it’s still a delight. 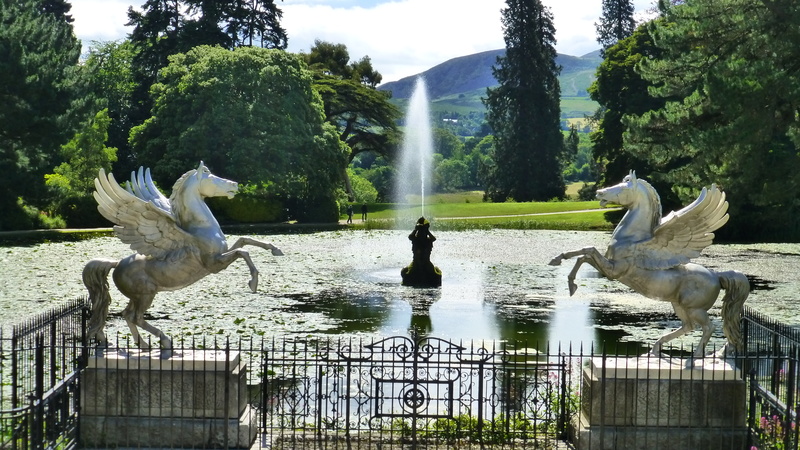 By the time we had finished wandering in and photographing Rowallane’s gardens we were in much need of a hot ‘cuppa’ but… the garden cafe was closed. It was about to be moved from the stables to the newly renovated house. So we headed south to find the nearby Butterfly Sanctuary and its cafe. 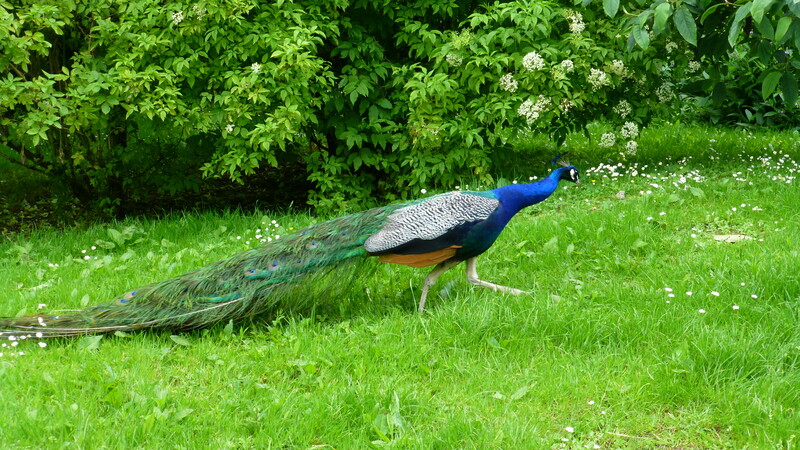 Male Peacock on a mission! 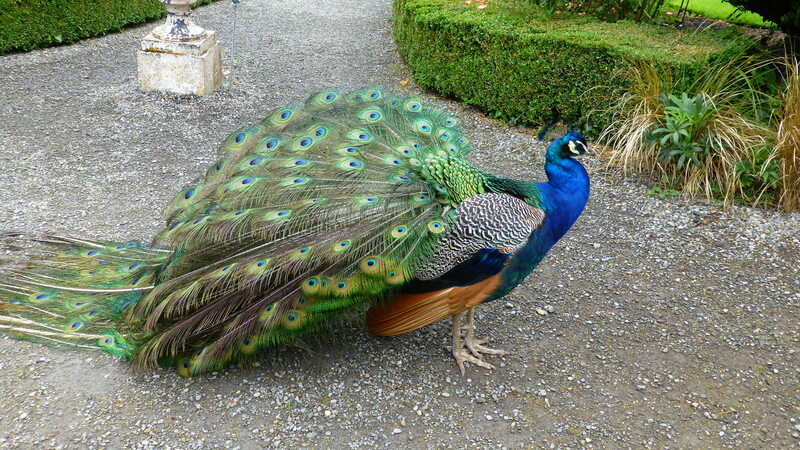 We were greeted by a couple of peacocks. “Get out of my way”, he seemed to say. He was a bird on a mission. 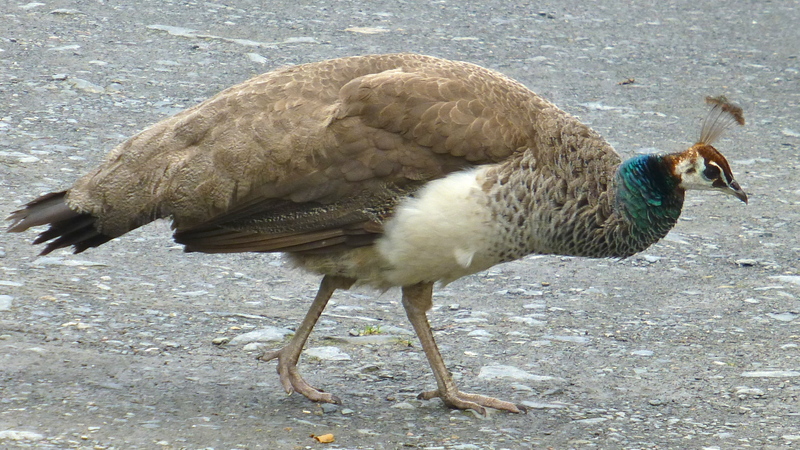 And yes, he was in pursuit of this beautiful lady – a pea hen. 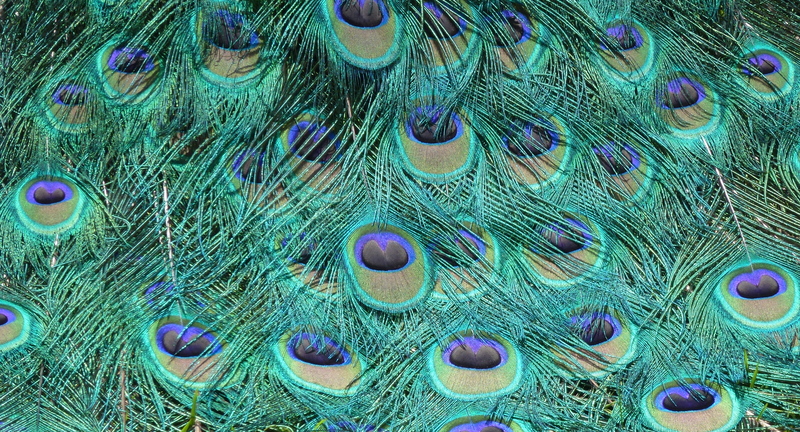 The peacock’s feathers made for a lovely piece of natural abstract art. Who said blue with green should never be seen? My art lecturer when I was at Teachers College, that’s who! Maybe she’d never seen a peacock. Tearing ourselves away from our fascination with the peacocks, we found the small cafe. It was run by a very friendly young lady who enjoys the ‘craic’, the Irish version of enjoying a conversation. We ordered tea and scones… cherry scones were the offering of the day. They were awful! Made with glace cherries. Do not try. I had changed my tea order to a small hot chocolate. Imagine my surprise when this work of art was delivered! 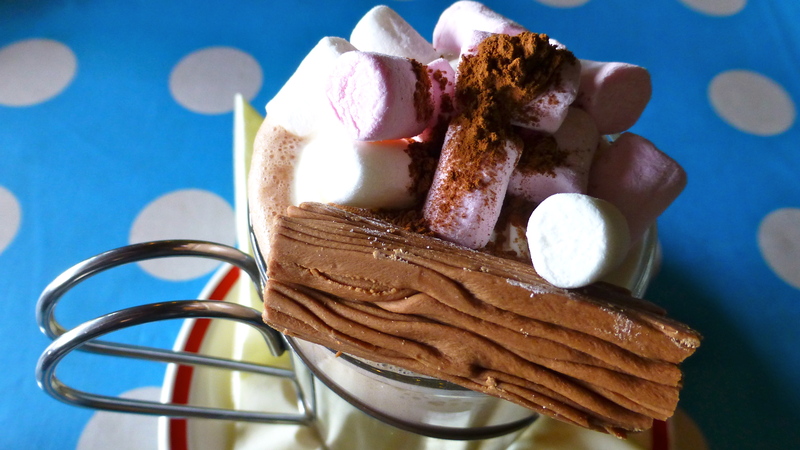 As I sat stunned, staring at this vision of sugar gone crazy, she said, “This is how we like our hot chocolate in Ireland. You can either drink it or climb it.” Lesson learned re hot chocolate! It had begun to rain again by the time we extricated ourselves from the lady and her cafe. The butterflies would have gone into hiding and we didn’t particularly like the thought of wandering in gardens in the rain again. So we drove on through DownPatrick. All roads in County Down lead to DownPatrick, the main centre. We could have stopped to see St Patrick’s grave, or the Cathedral, or a steam railway museum. 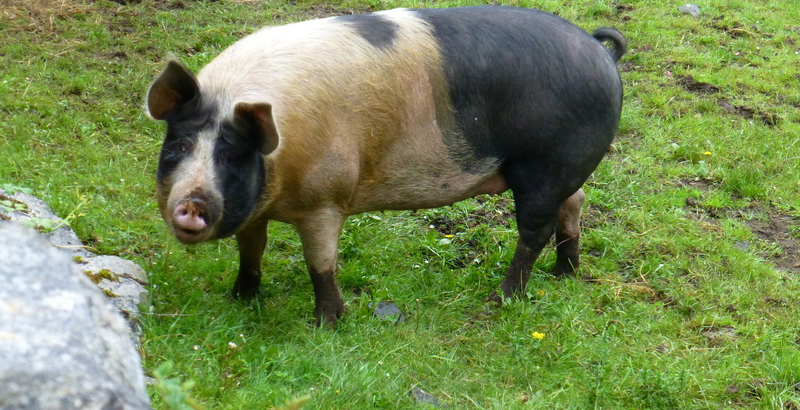 But none of those were on our list of things we most wanted to do after our wonderful morning at Rowallane. So we drove on back towards Strangford Lough. A road sign caught our attention just as the sun emerged from behind a curtain of clouds. It pointed the way to Castle Ward, another National Trust property. 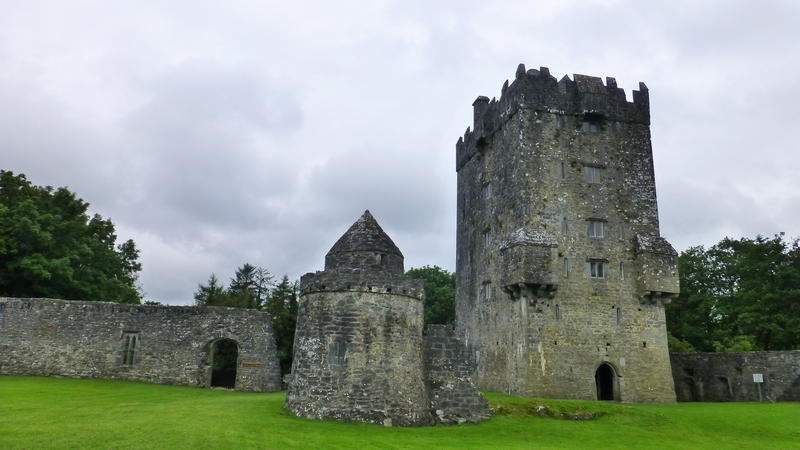 A visit to a castle could be just the thing to do on a wet day. 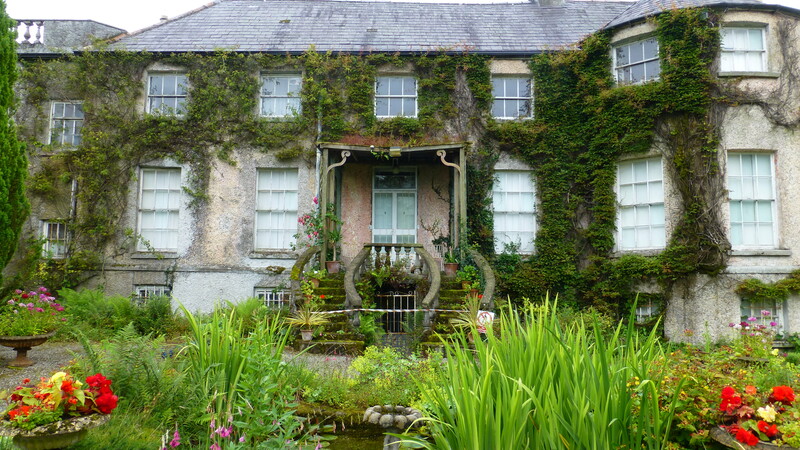 So we turned down a long drive through this 332 hectare (820 acre) property with its promise of walks and views over Strangford Lough, and its eccentric Manor House which is open to the public much of the time, but, as we were to learn, not all of the time. 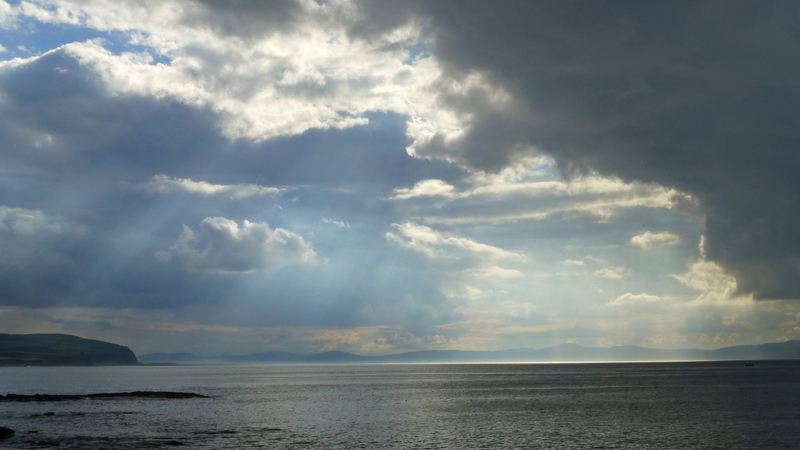 Yes – the sun came out as we began to walk up towards the house. What a lovely view looking down over the waters with blue sky above. 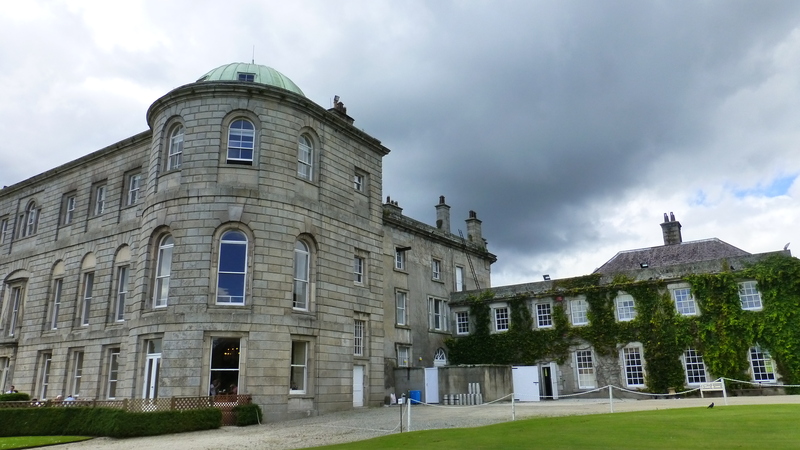 Front view of Castle Ward – the Classic Palladian style side. 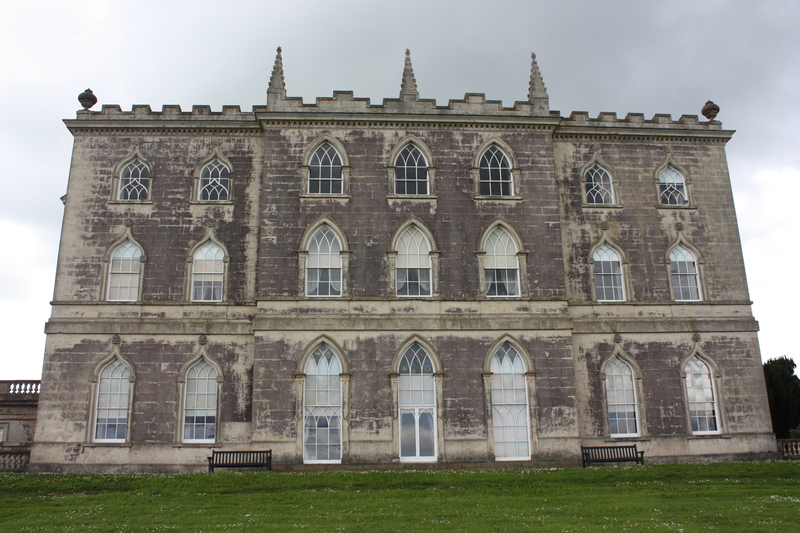 Castle Ward was built in the 1760s by the first Lord Bangor, Bernhard Ward, and his wife Anne. 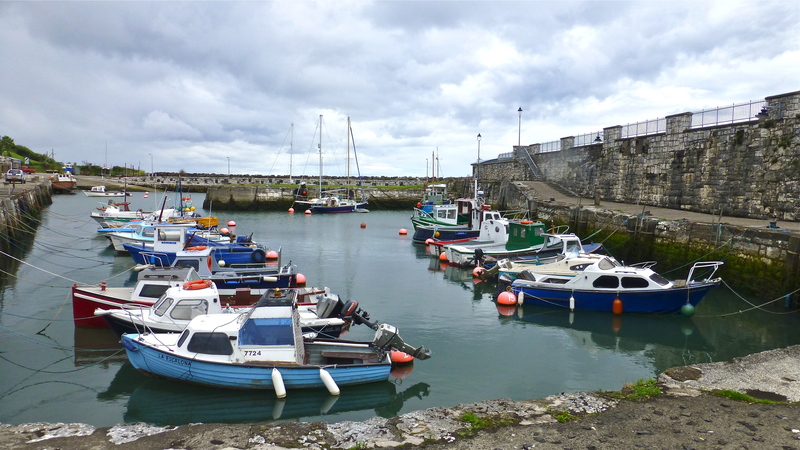 It was built of Bath stone brought to Ireland in one of Lord Bangor’s own ships. The big problem for their architect was that this Lord and Lady couldn’t agree on the style for this building. 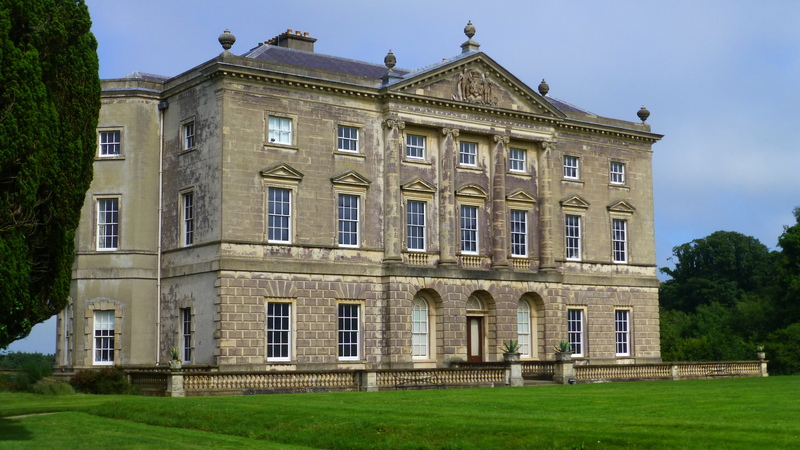 Lord Bangor wanted classical Palladian style. Lady Bangor wanted the newly fashionable style, neo-Gothick. There was no compromise so, with semi-octagonal bays at each end joining the two ‘faces of the house’, this most eccentric house was a built. The side that faces the driveway (above) was built in the classic Palladian style with columns supporting a triangular pediment… his half. 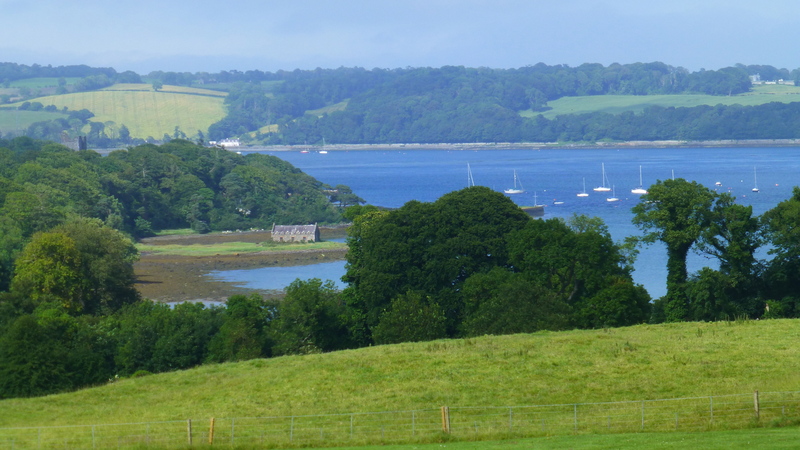 The side that faces Strangford Lough, and that view, was built in Georgian Gothick style with pointed windows, battlements and finials…. her half. The difference in style continues throughout the interior of the house with the divide down the centre. 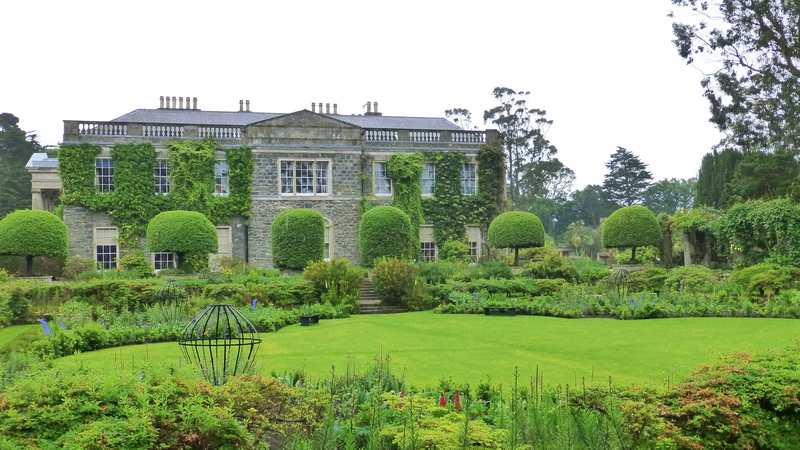 Although the house has stood the test of time, the marriage of Lord and Lady Bangor did not. The couple separated, not surprisingly perhaps! By 1827 all the furnishings had been dispersed. 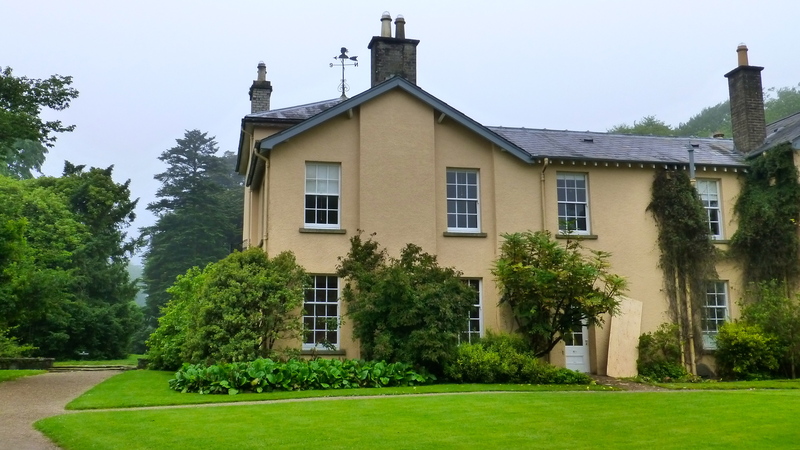 In 1950, the house was presented to the National Trust, in lieu of death duties after the death of the 6th Viscount Bangor. It has been restored and refurnished in both styles. Unfortunately for us, on the day of our visit, the house was closed and so we did not experience the inside of this eccentric mansion. 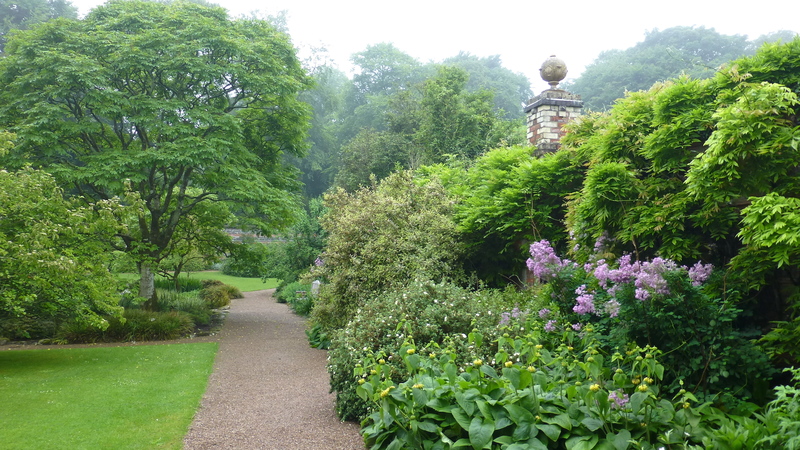 The sun shone, briefly, so although we missed out on seeing inside the house, we were able to walk in the garden, at least until the rain returned. 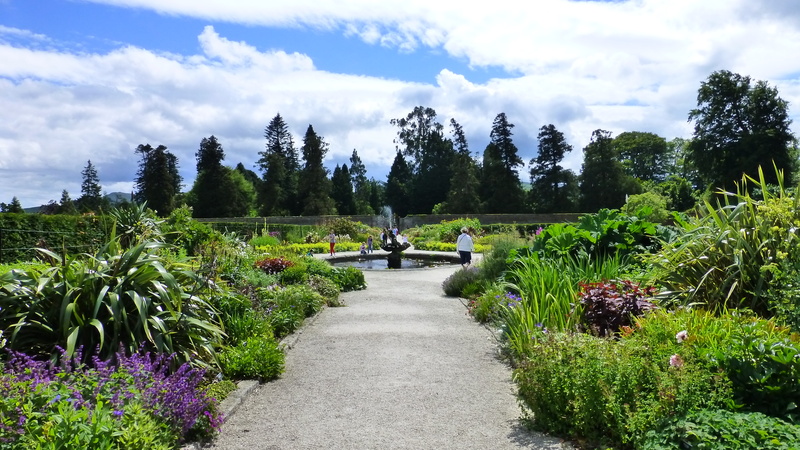 We read that back in 1902, this Sunken Garden had been a formal ‘parterre’, an elaborate design of 61 garden beds filled with flowers – colourful floral artistry. There was little or no grass at all then. 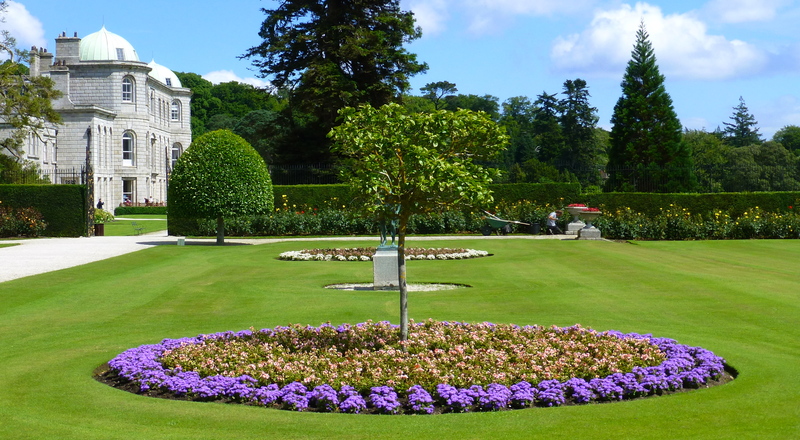 Now it’s a simple design, mainly lawn, in the centre of which is a circular ‘lily pond’ with a statue of Neptune brandishing his trident. Castle Ward has nothing like the walled gardens at Rowallane, but there were a few interesting plants such as this Alstromeria to brighten an otherwise ‘green garden’. 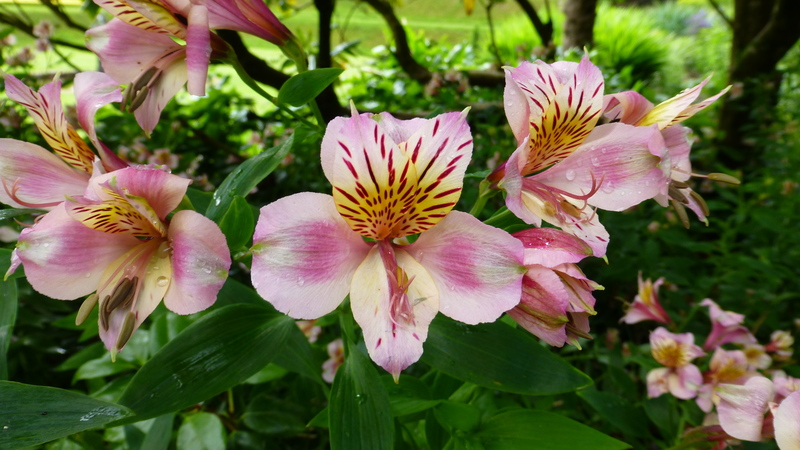 Known as the Princess Lily or the Peruvian Lily, these flowers are delightful with their streaked petals and compact growth. 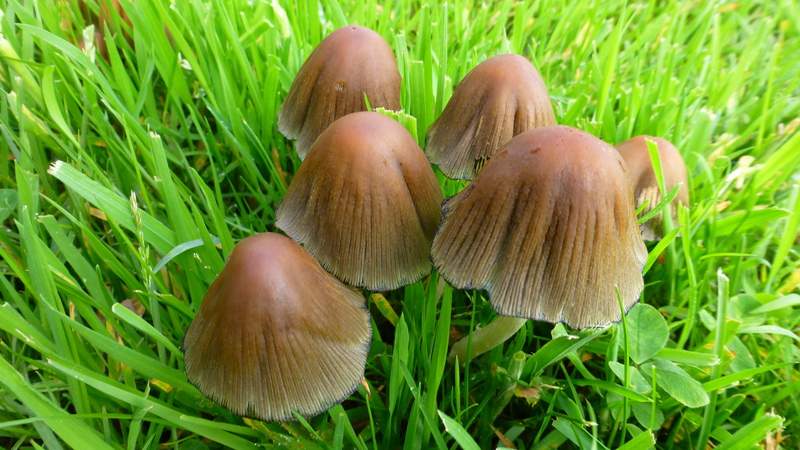 They can grow to 2 feet tall and there are dwarf cultivars as well. 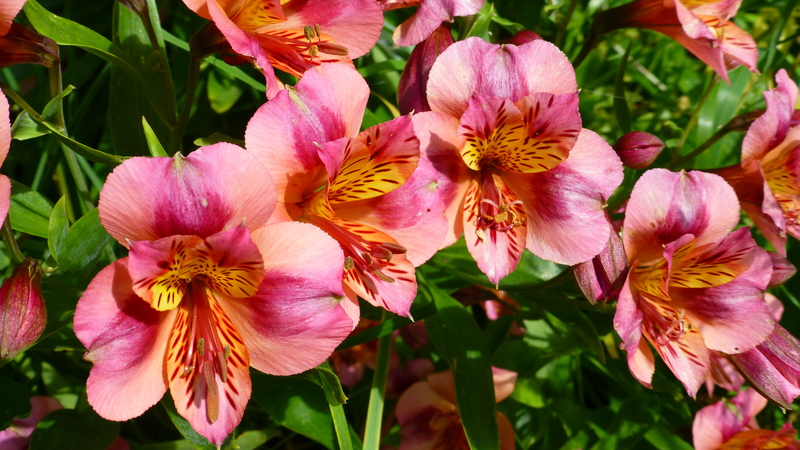 We have a dwarf Alstroemeria in this colour in our garden in Canberra. I made a mental note to add some more varieties this summer… there are so many colours available now. 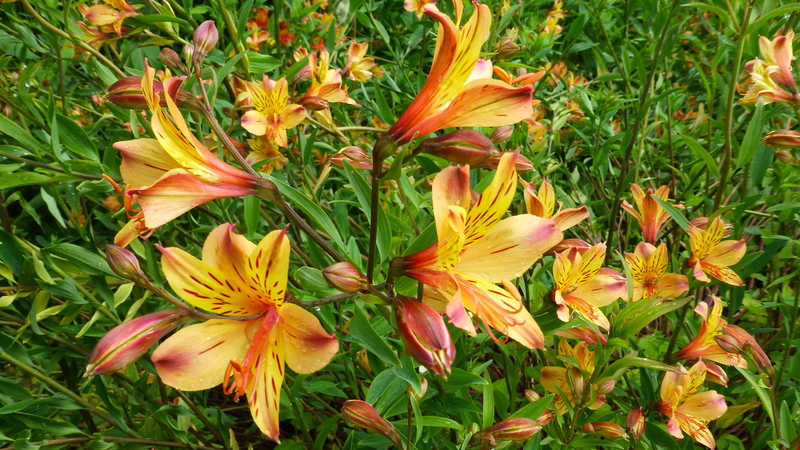 These cheerful yellow Alstroemeria would bring a splash of sunshine to any garden, no matter what the weather. I do know that these larger forms can ‘get away’ in the garden and become rather weed like. But we’ve had no problem with the dwarf variety and they grow well in pots. And if the yellow Alstroemeria brought the feeling of sunshine, theses lovely blue flowers brought the blue of a clear summer’s sky. 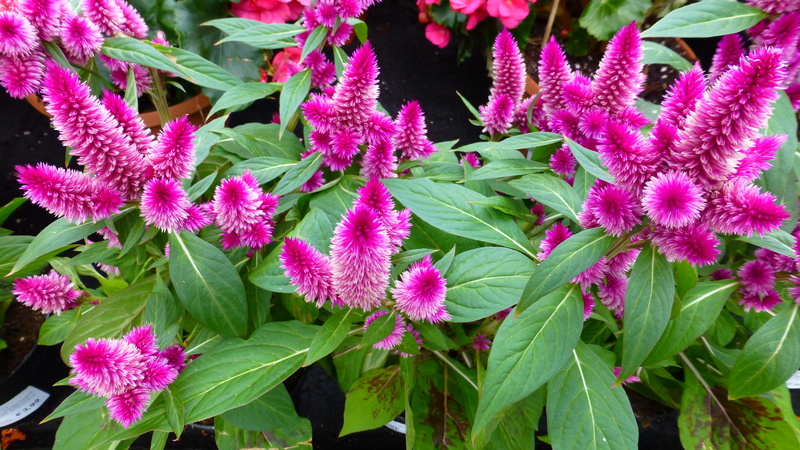 I don’t know the name of this flower. Any suggestions? 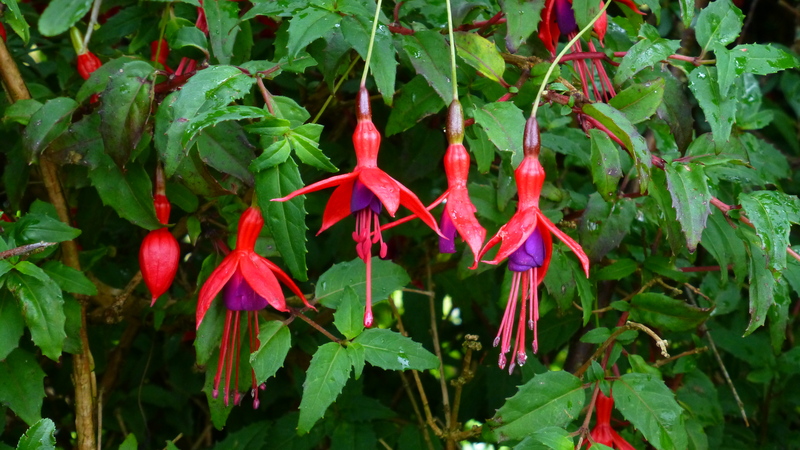 Fuchsias are a familiar sight in Irish gardens and along country roadsides. 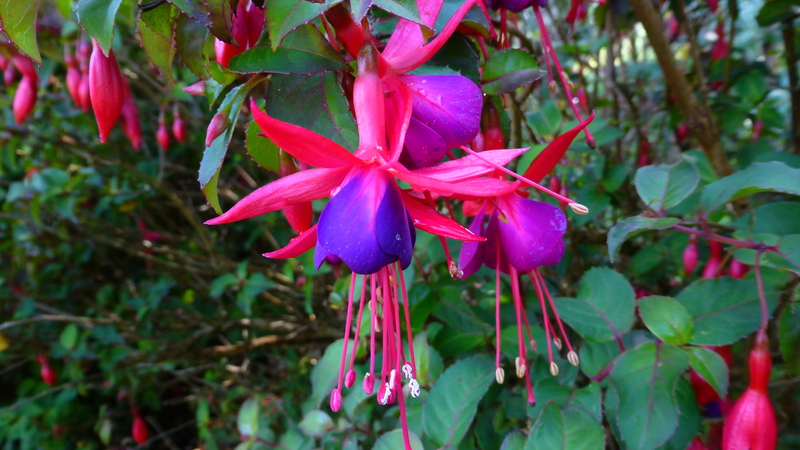 In this garden, fuchsia is grown as a hedge along the path from the house down to some out-buildings. They hide the buildings and provide colour at the same time. They are such beautiful ‘ballerinas’. 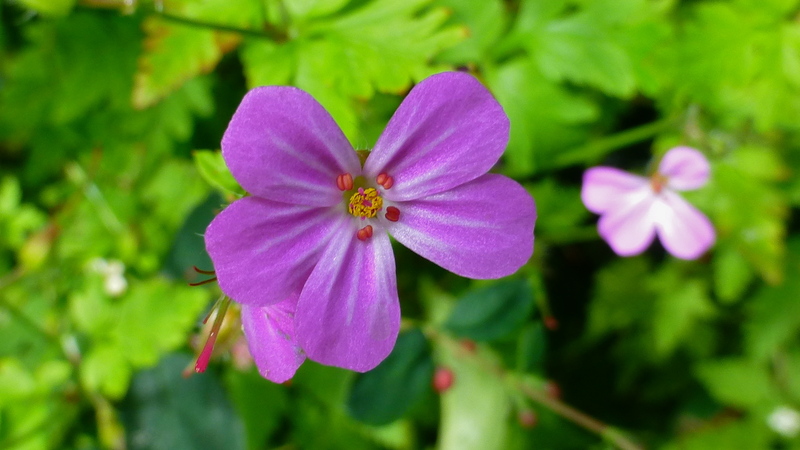 The tiny flowers of the common, weedy wildflower, Herb Robert, can be found almost anywhere there is a stone wall in Ireland. It always fascinates me to take a close-up look into flowers and these flowers, not much bigger than my little fingernail, deserved a closer look – exquisite in their simplicity of form! Mushrooms and fungi usually reward a closer look, also. I had to splash through very soggy grass to photograph these beauties. 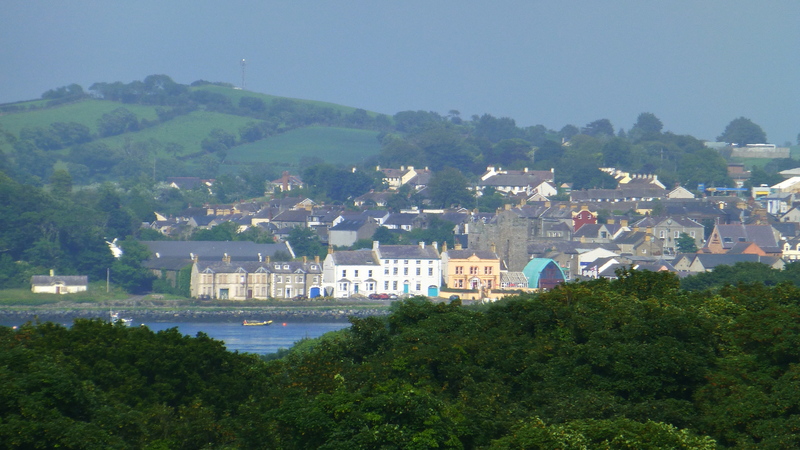 Portaferry is the village on the other side of Strangford Lough. 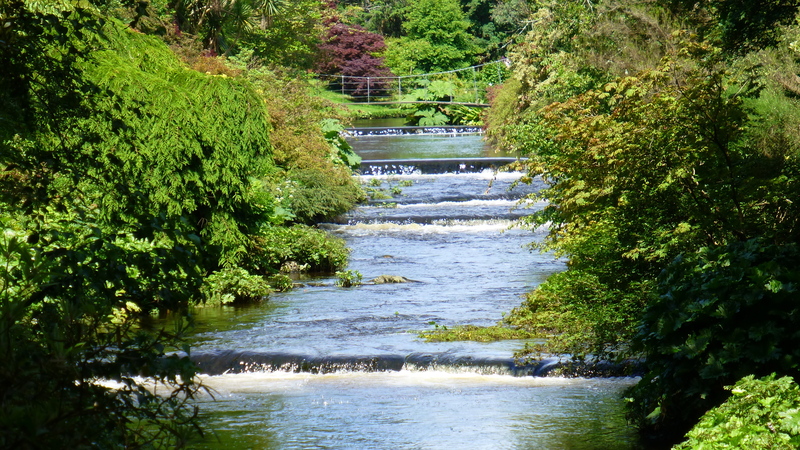 We would get a closer look at that on our way to our next garden, Mount Stewart. 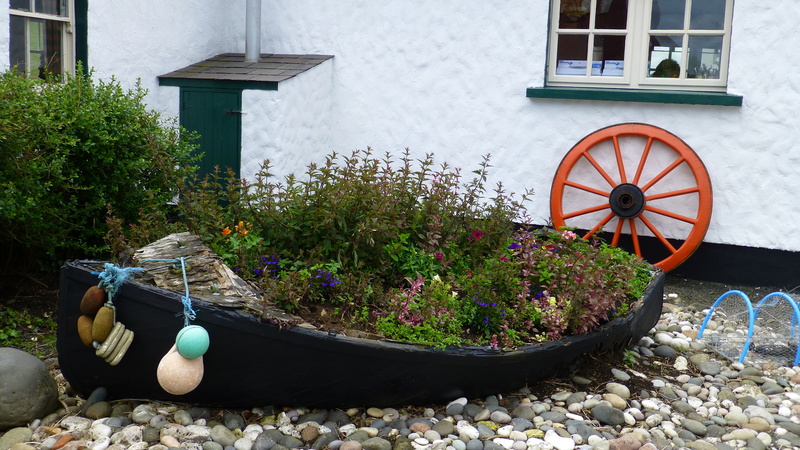 But before that , with rain falling once more, we made our way back to the village of Strangford. There, at The Cuan Inn (our home away from home) we had a much needed hot shower and a rest before enjoying a wonderful birthday lobster dinner in the company of new found friends. 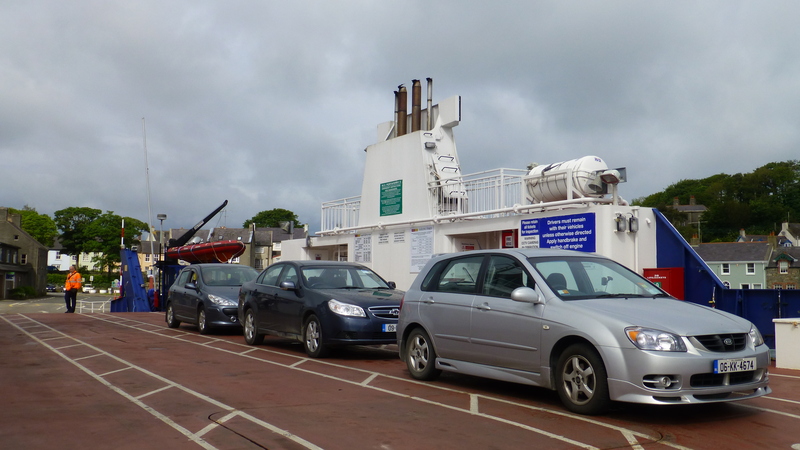 Next morning, again in drizzle, we took the ferry across Strangford Lough from Strangford to Portaferry… our hire car the middle one. You really have to be out on the water to see homes like this one. 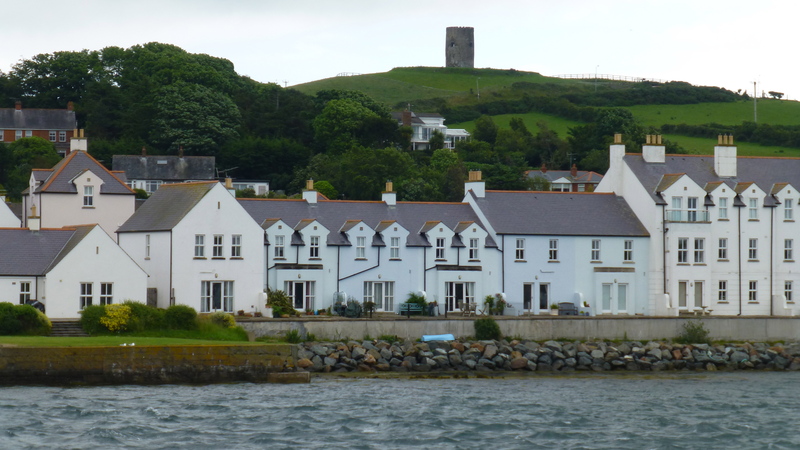 It was pleasant looking back at Strangford from the water – a very different view of this lovely village. 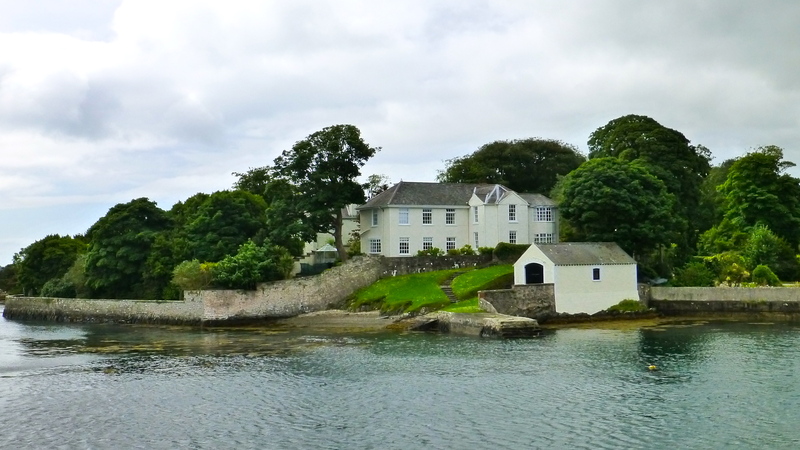 Portaferry – from the ferry. 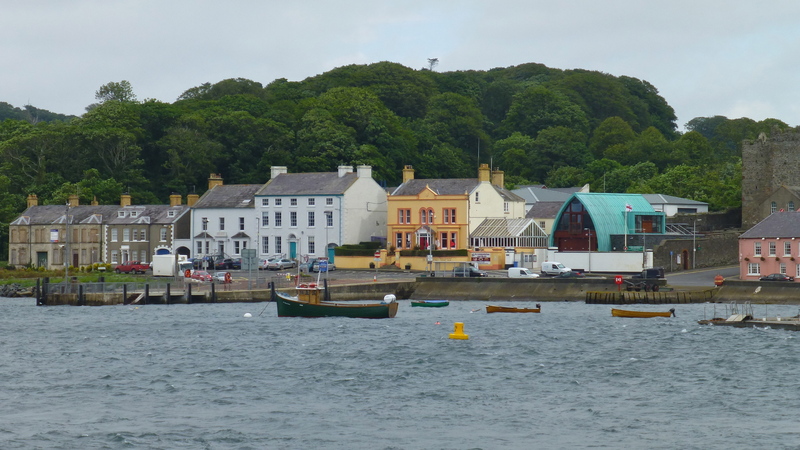 Portaferry has a mixture of architecture. It would be a good place to explore more. Perhaps next time I’m in Northern Ireland! 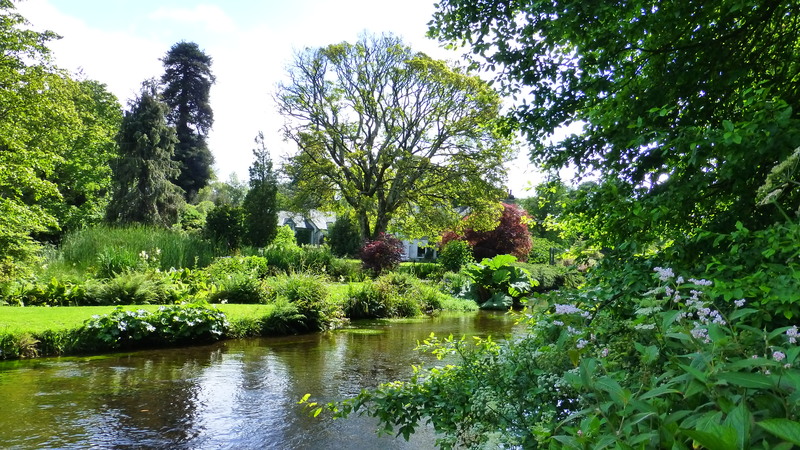 ‘Rowallane is one of the foremost gardens in the British Isles… it’s a unique garden, a place to lose yourself” in the woods and meadows of a 52 acre estate, or, as the Irish call it, a’demesne’. 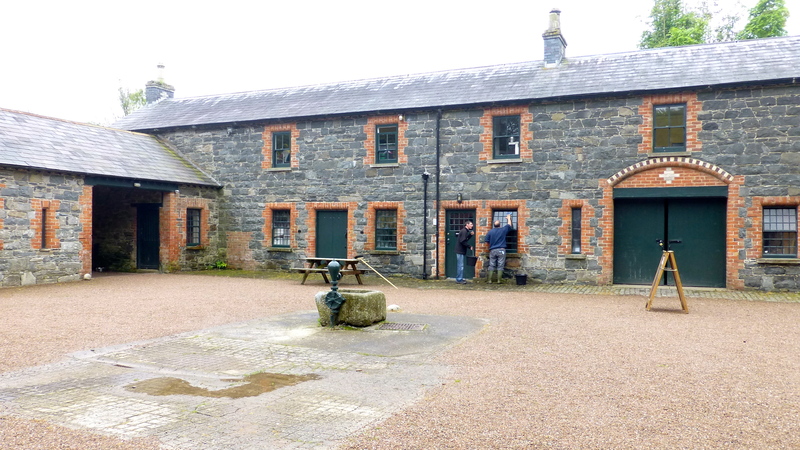 So said the brochure for this National Trust property just south of Belfast, near the town of Saintfield. With that sort of invitation, Rowallane was a definite on our ‘must visit’ list. 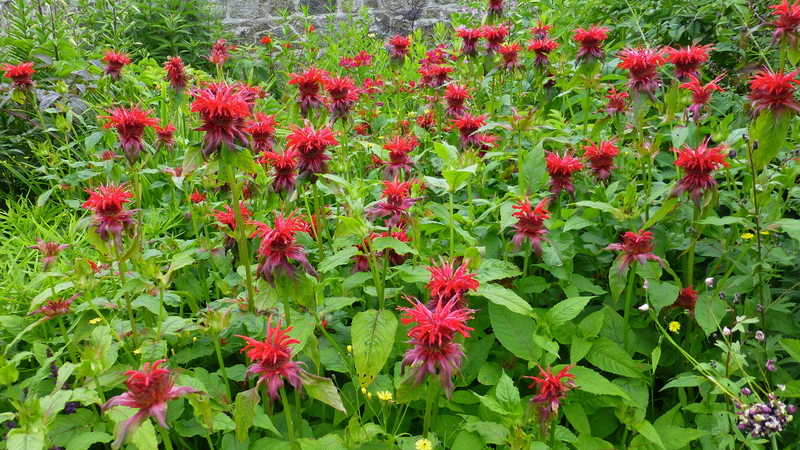 And what we found was indeed worthy of being called a great garden. 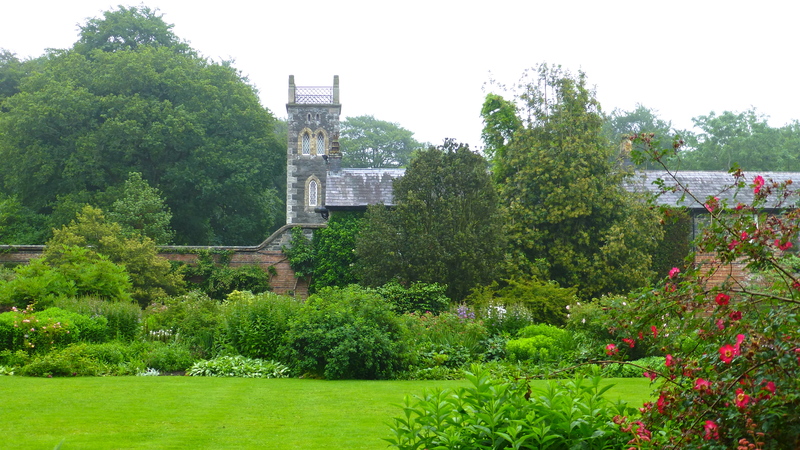 The garden’s history began when the Reverend John Moore began planting here in the 1860s. 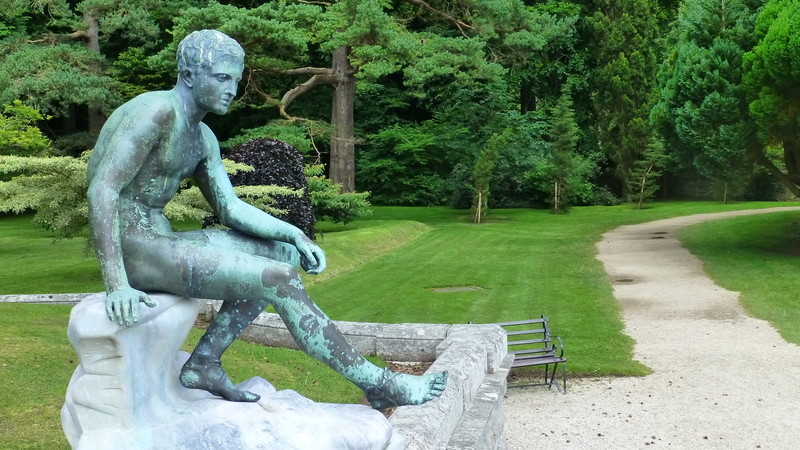 He continued to develop the garden until 1903 when his nephew, Hugh Armytage Moore, inherited the property. 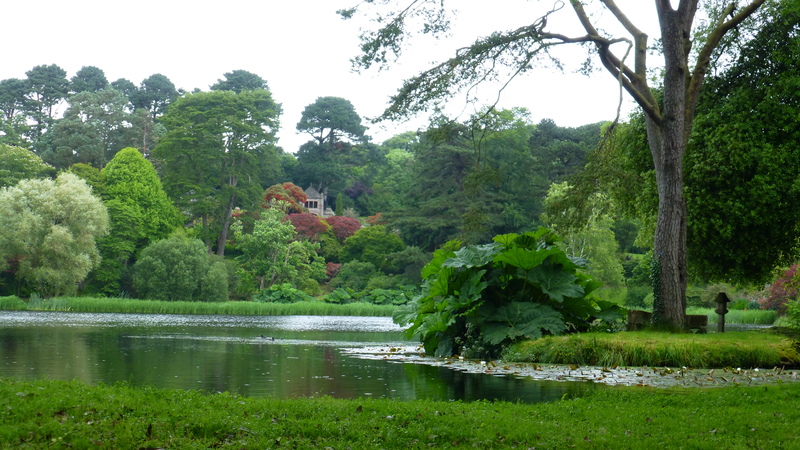 The National Trust took over in 1955 and they have been restoring, maintaining and developing the garden ever since. 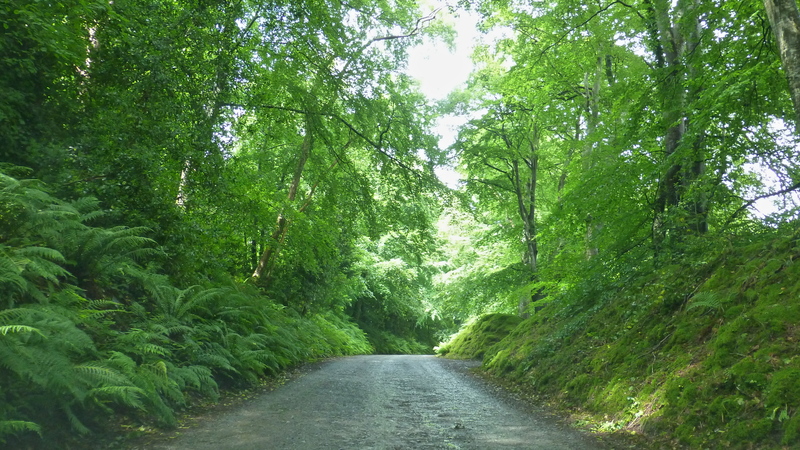 As we entered through the gates, we quickly left behind the busy road to drive along an enchanting avenue of trees that gave promise of the woodland walks to come – as detailed in the brochure.. However, that was not to be for us. Why? 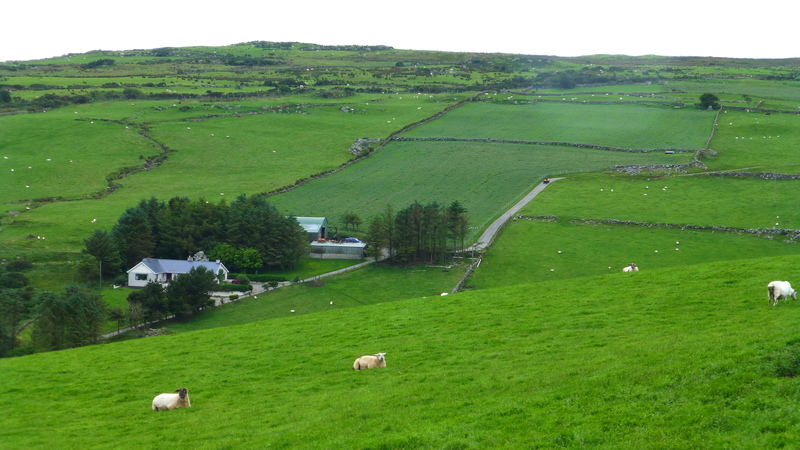 The whole property was totally waterlogged by all of the rain that had tumbled down over Ireland in June. 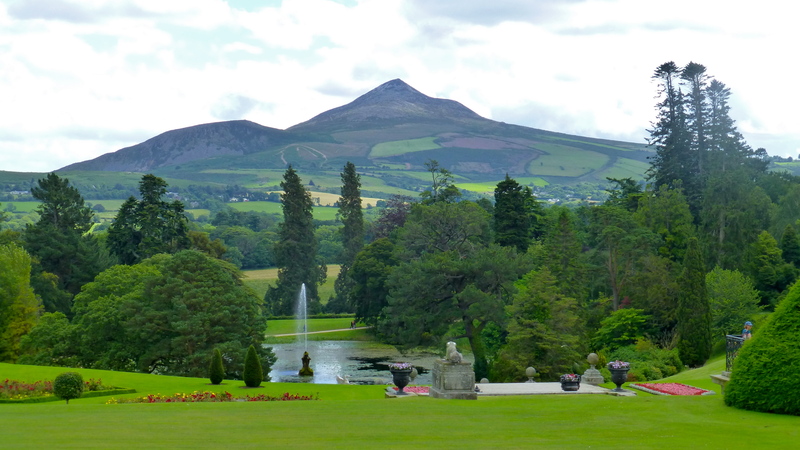 As one young Irishman said to me,”Ireland is a beautiful country – but what it needs is a roof!” That’s very true, but you can’t have amazing green countryside and lush parks and gardens without rain. What we needed was what every self-respecting Irish person has available in the boot of their car at all times – Wellington boots! But gumboots, as we call them, we did not have. 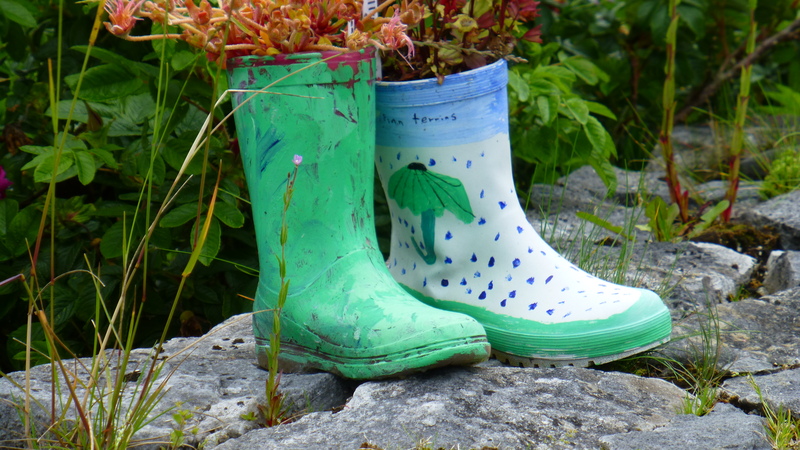 We had all the rest of the wet weather gear required – but we did not have those essential gumboots! 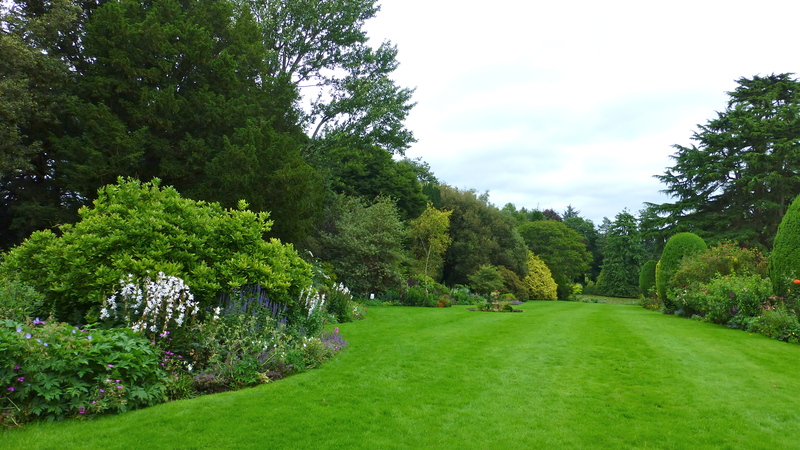 The first sight of the garden after coming through that avenue is of a green and lush treed park. What we couldn’t see was the layer of water lying under the grass. It looked so inviting, but walking here for a closer look at all the conifers, rhododendrons, azaleas, and many other shrubs and trees was just out of the question. This lingering bloom spoke of the spring that had just been and the promise of the next spring to come. 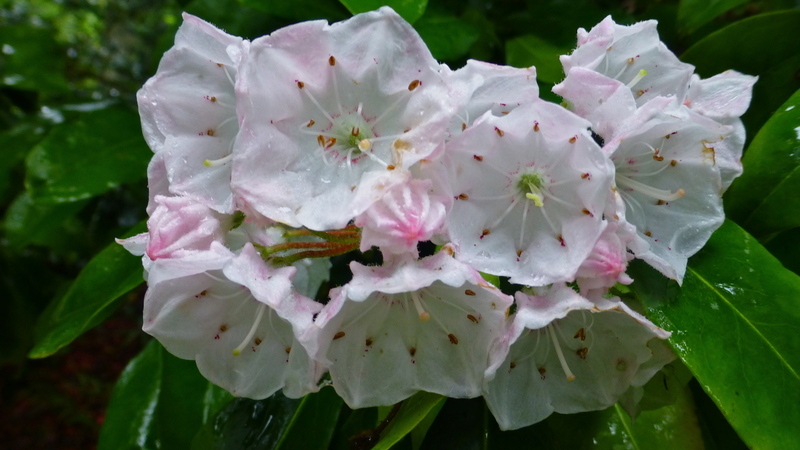 Rowallane is renowned for its spring rhododendron and azalea display with the red flowers of the many lofty tree Rhododendrons and massed banks of lower growing varieties in a wide spectrum of colours. These are probably at their best in May. And with so many deciduous trees amongst the plantings, this must be a spectacular park when in full autumn foliage. 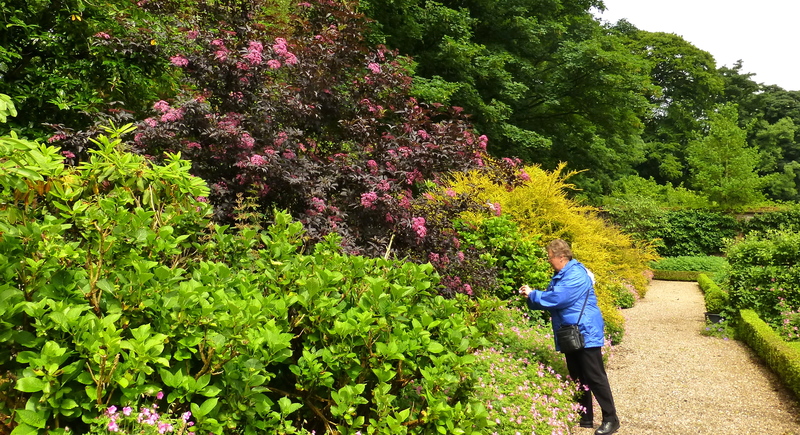 This famous rhododendron collection has been skilfully grouped with other shrubs and trees in the undulating site creating a scene that’s a delight to the eye. 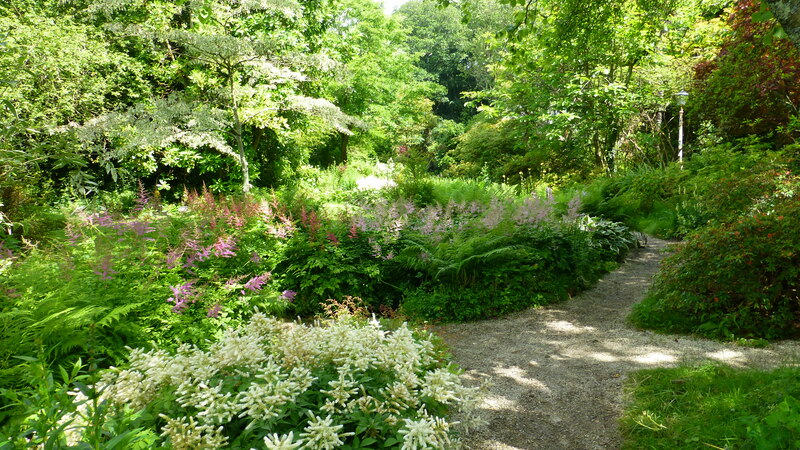 This garden is not only for plantsmen but also for the artist within us all. 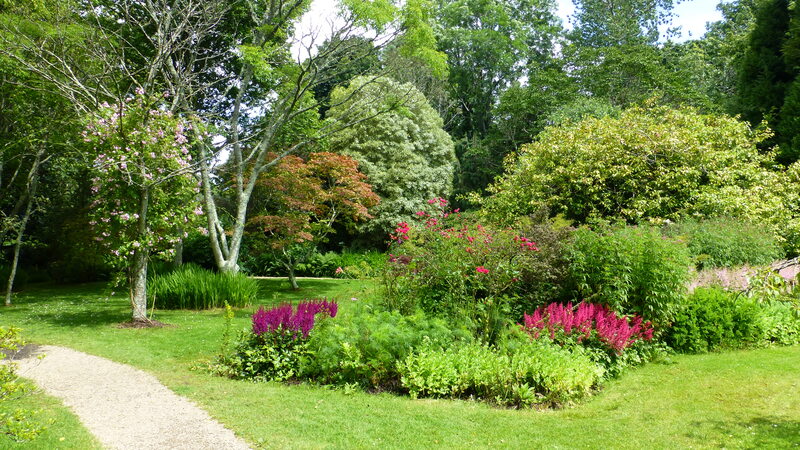 After the Reverend Moore had transformed the barren hillsides into a wooded parkland and created the walled gardens and ‘pleasure grounds’, his nephew added the skills of a true planstman to develop the garden we see today. 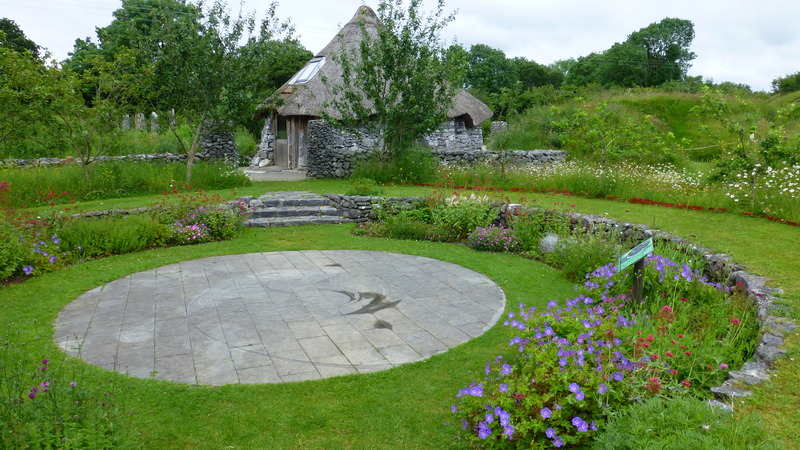 His vision was to create an informal garden, one which would be a wildlife-friendly environment, and one which would include plants from all corners of the globe, many of them rare. 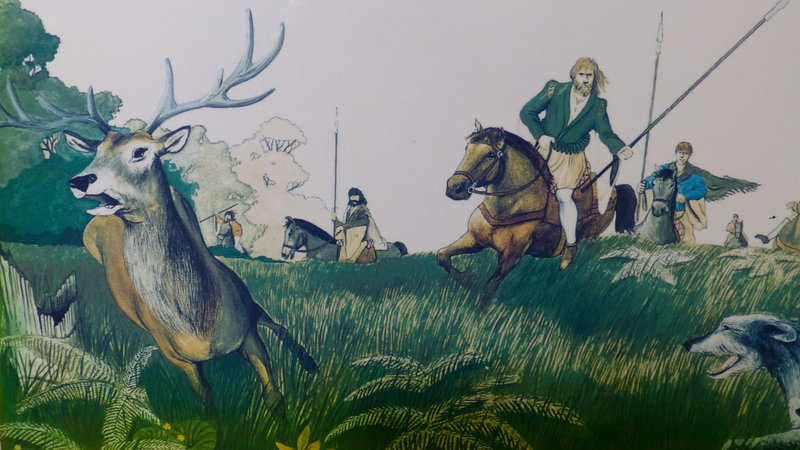 He used the landscape of the drumlins to add form to his design. 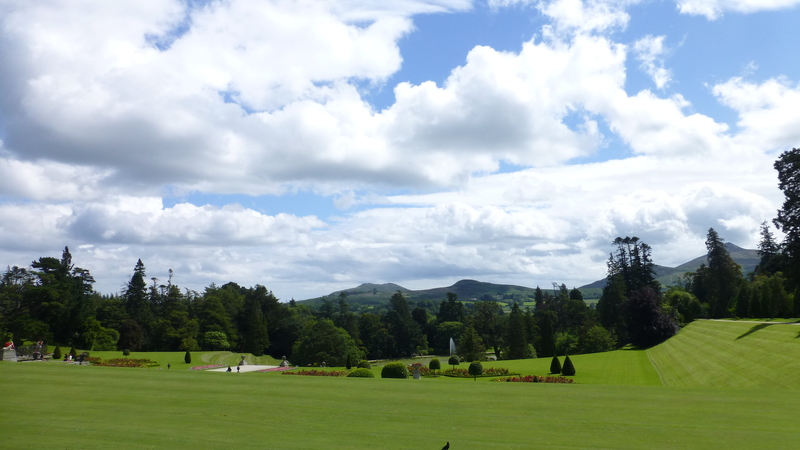 The drumlins (from the Irish word droimnin meaning ‘little ridge’) are in the shape of an inverted spoon or a half buried egg. They were formed long ago by glacial ice compacting the underlying moraine. So although the climate is wet, the plants have naturally good drainage from these rounded ridges. 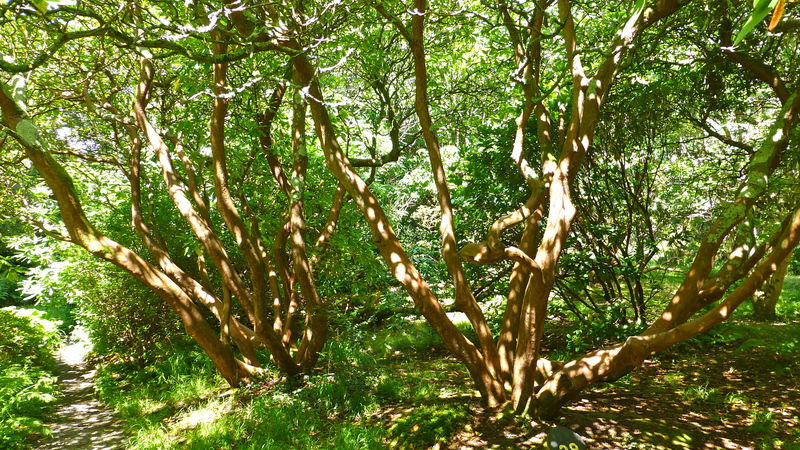 They add interest and shape to Moore’s plantings throughout the park. 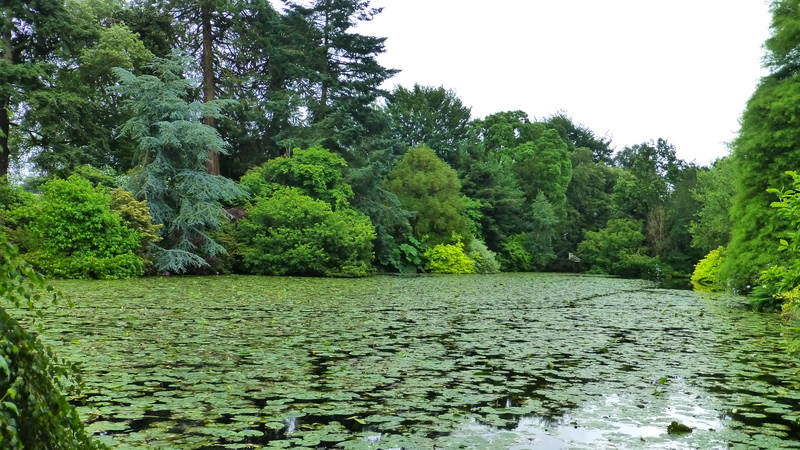 At the time of our visit, it was raining intermittently and the grounds of Rowallane’s large park were just too boggy for walking. 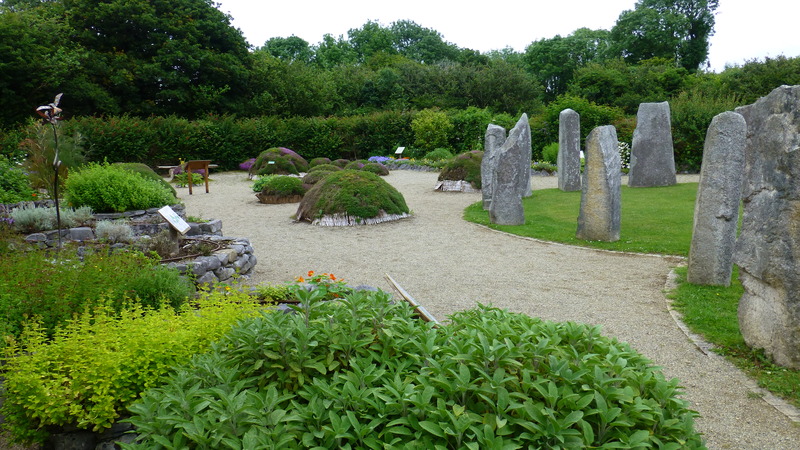 So we missed out on seeing the natural Rock Garden with its plantings of a wide range of alpines, heathers and dwarf rhododendrons and where meconopsis and primula were in full bloom. We also missed out on the meadows where wildflowers and masses of orchids grow. And we couldn’t walk through the farmlands that include higher drumlins that afford fabulous panoramic views over the Down countryside towards the Mountains of Mourne. Nor could we stretch our legs walking along the paths through the woods of mature trees. 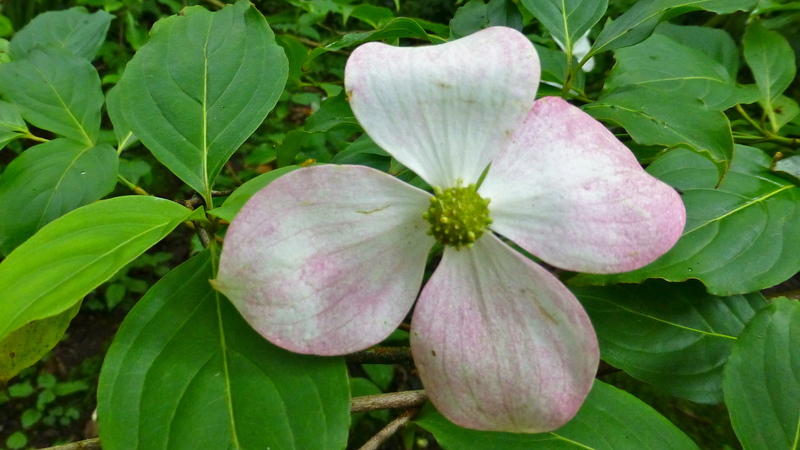 Many of those trees were planted in the latter half of the 1800s and early 1900s and include many rare trees and shrubs. Next time perhaps! ” a passionate plantswoman, capable of identifying everything from a blade of grass to a rainforest liana… Never claiming to be anything but an amateur, Lady O’Neill developed, and retained throughout her life, a photographic memory both for botanical detail and for the overall “look” of a plant; her recall for the latter would enable her to make a swift, positive identification where a professional botanist could only do so on completing a long technical process. 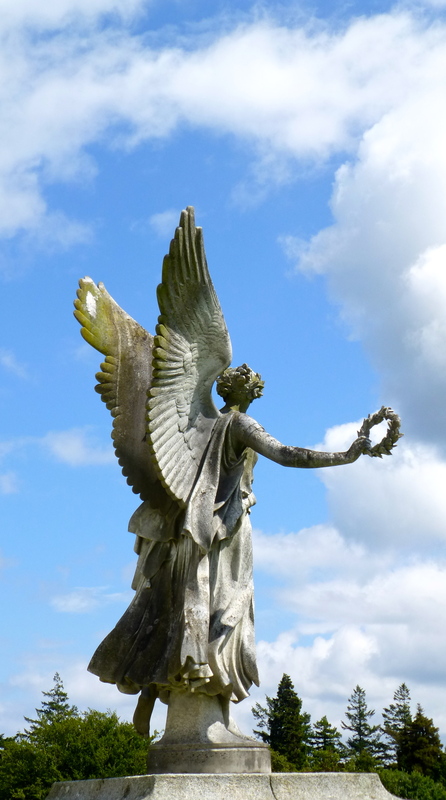 What better person than this to lead the restoration of Rowallane in keeping with Hugh Armytage Moore’s vision. It’s good to know that in the capable hands of the National Trust’s gardeners, the maintenance of this great garden will continue for many years to come for the pleasure of all. And for this alone, it is worth being a National Trust member, as we are. 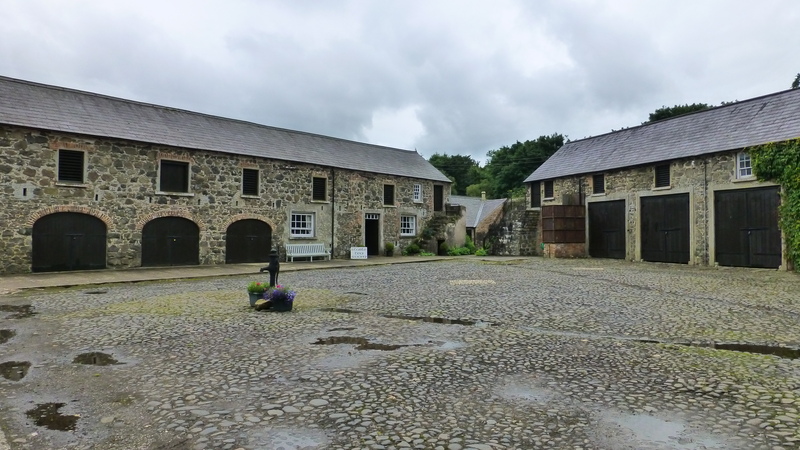 On our day at Rowallane, one of the few dry areas was the old stone and brick stables, built by Reverend Moore. 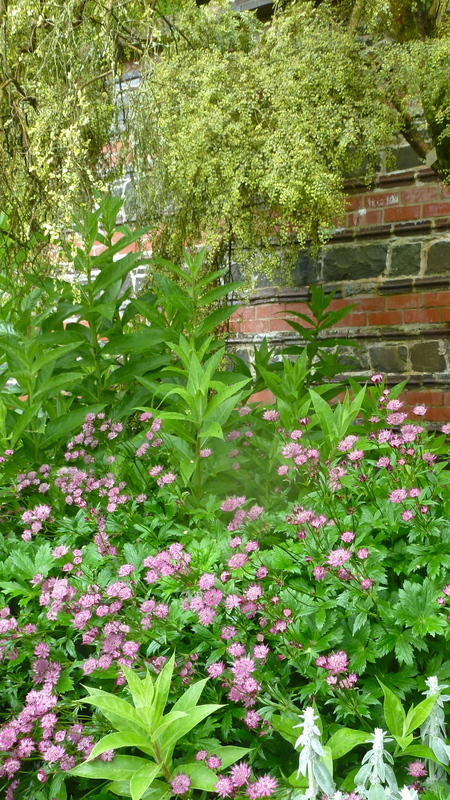 The soft earthy colours of the stable wall makes a good background for the plants in the larger walled garden. 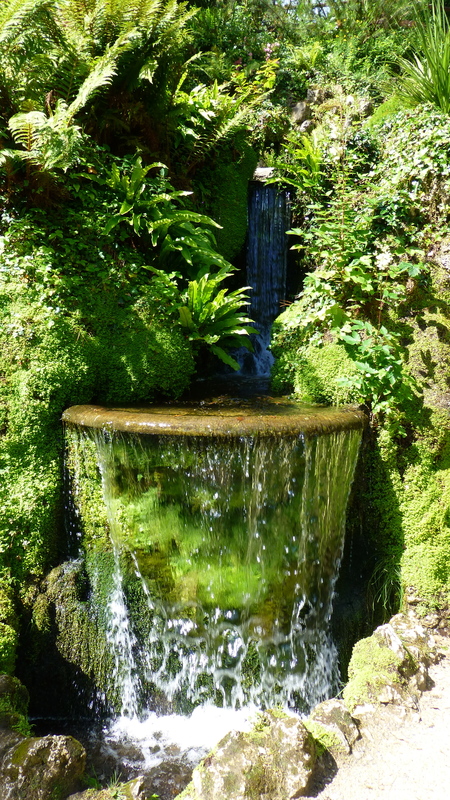 Even the stones themselves provided horticultural interest with ferns, mosses and lichens finding a niche to grow. 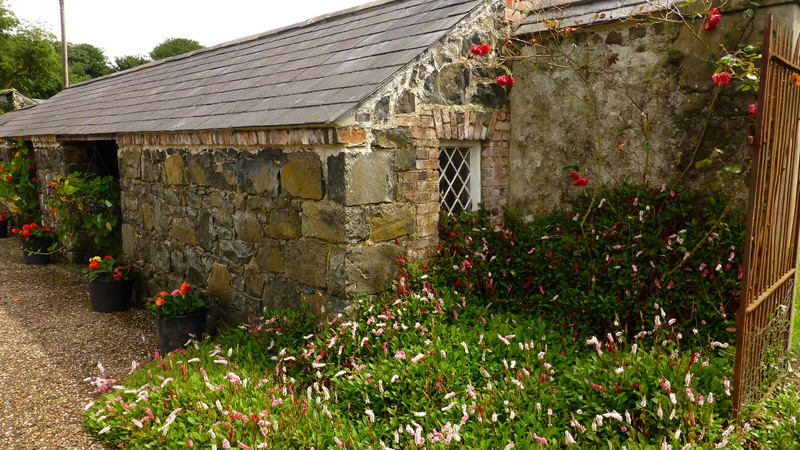 A different patterning of the stones and bricks was used to build the outer surrounds of the outer walled gardens. Another of the Reverend Mooore’s projects was to improve the house. 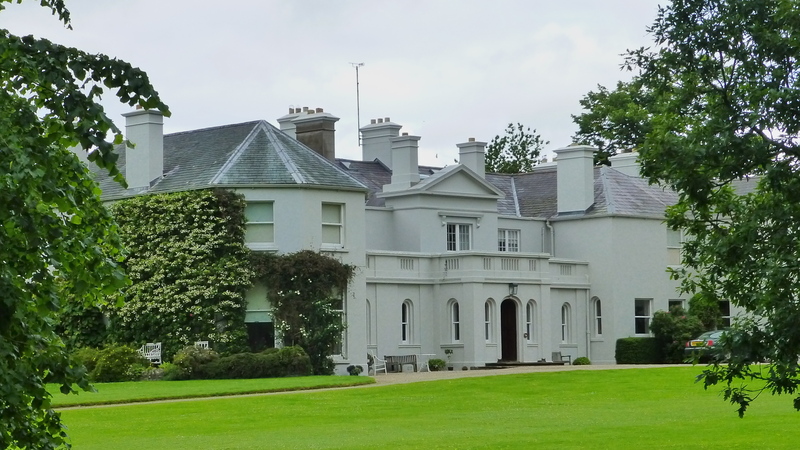 During 2012, it has again been under renovation, to provide better offices for the National Trust’s regional headquarters and better facilities for visitors and conferences. 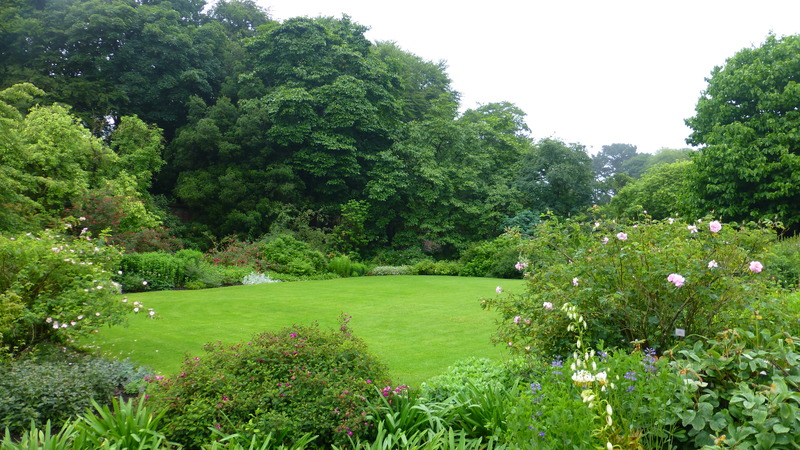 In 1903, when the ‘demesne’ of Rowallane was inherited by Reverend Moore’s nephew, Hugh Armytage Moore, the garden itself inherited a very knowledgable and keen plantsman. 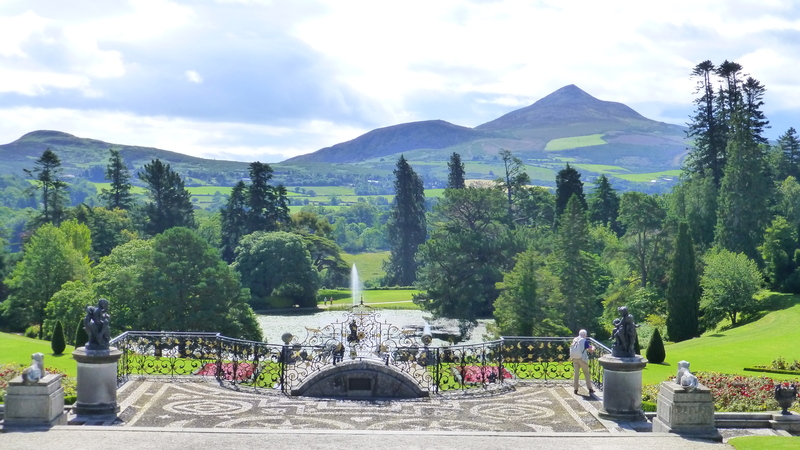 Not only is his name well respected in Irish horticulture but also, in 1942, the Royal Horticultural Society of Great Britain awarded him the ‘Victoria Medal of Honour’. 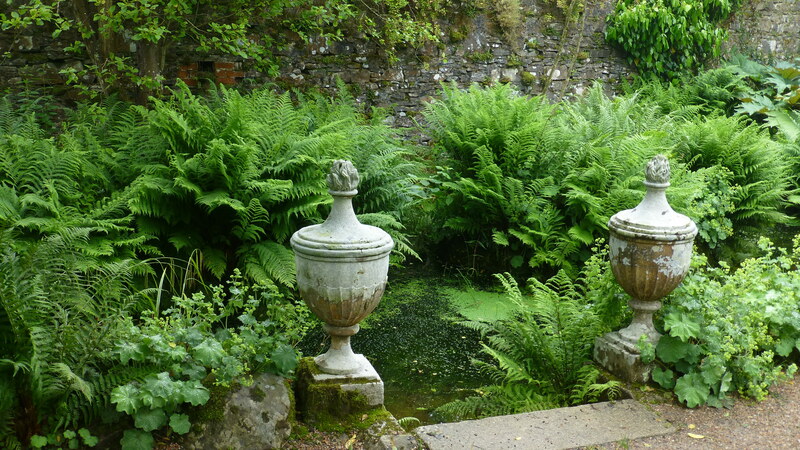 He raised many of the plants in this garden from seeds collected from various parts of the world, particularly in China and the Himalayan regions, by such well known plant hunters as Ernest Wilson, George Forrest and Frank Kingdom Ward. 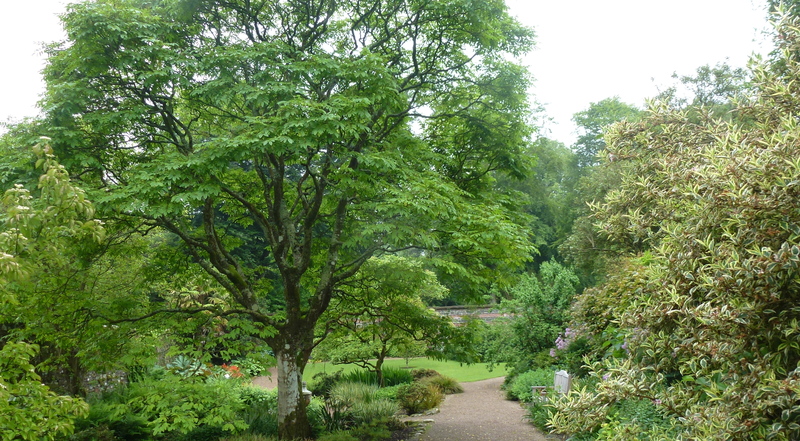 He established important connections with Botanic Gardens throughout the world particularly in Edinburgh,Scotland and Kew, London. 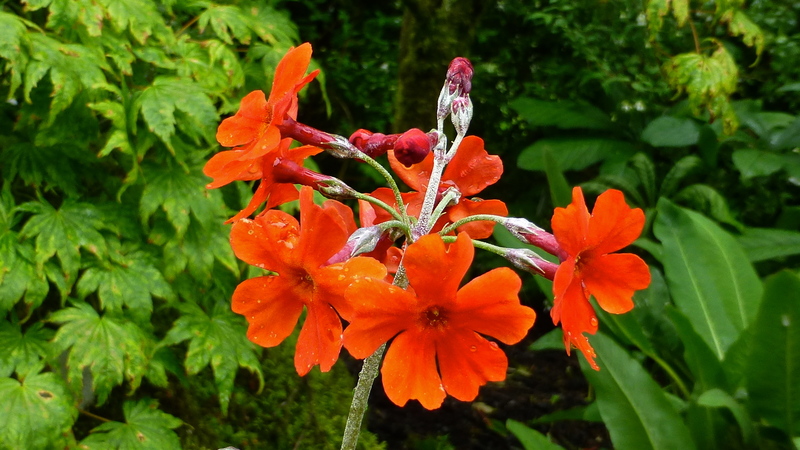 And throughout his years cultivating plants, he gave many new cultivars and hybrids the name ‘Rowallane’ such as the Candelabra Primula ‘Rowallane Rose’. 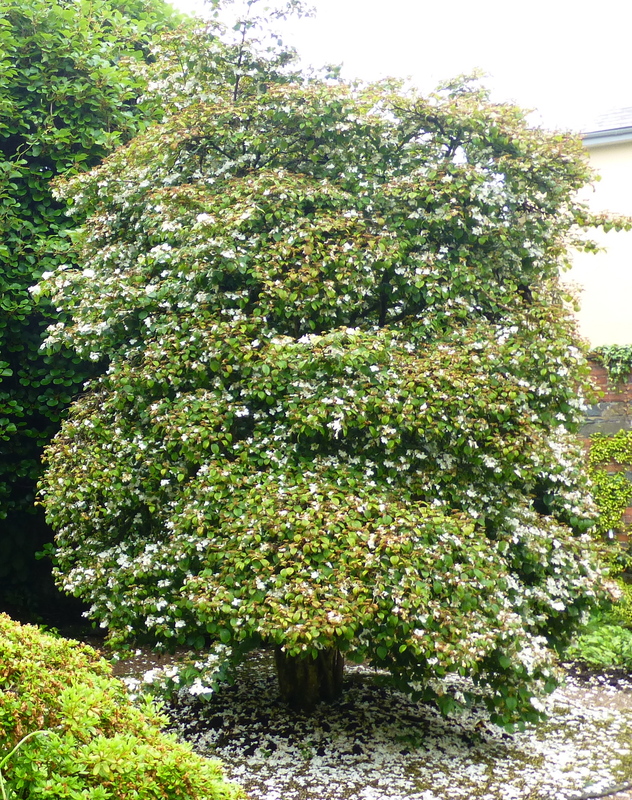 This is the original Viburnum plicatum var. 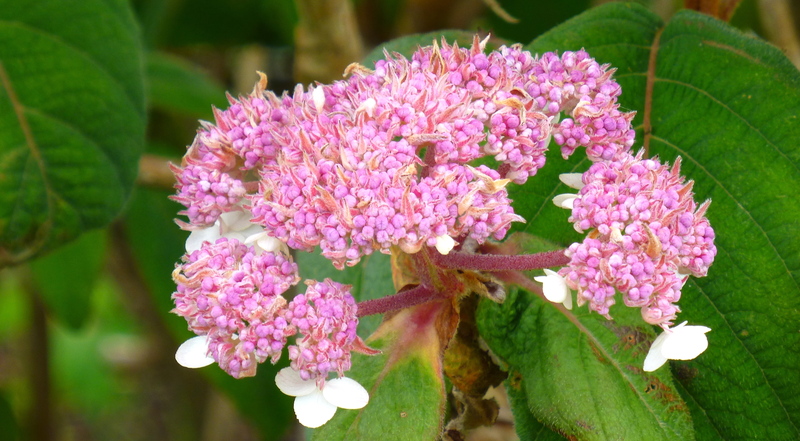 tomentosum ‘Rowallane’, grown by Hugh Armytage Moore from seed collected in the wild by Ernest Wilson in Eastern Asia where viburnum originates. 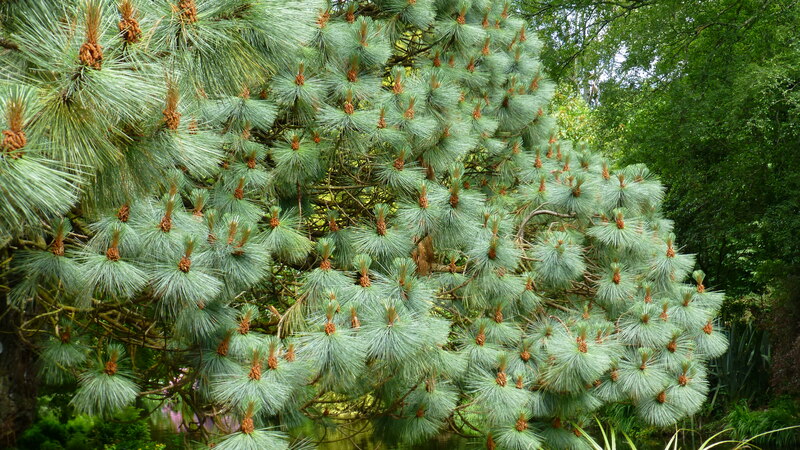 This tree is just one of many in the gardens that bear witness to the horticultural skill and expertise of this great plantsman. 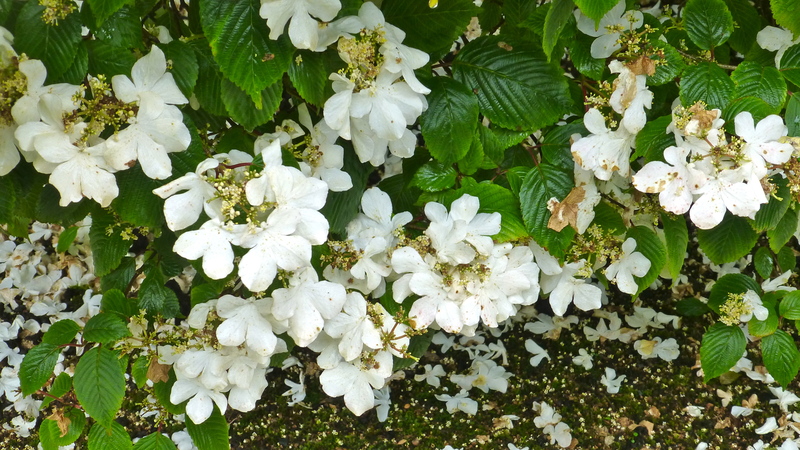 Unfortunately, we saw this special Viburnum just at the end of flowering – the petals, somewhat damaged by rain. But we could see how these flat-topped pure white flower clusters are made up of an outer ring of large, sterile florets surrounding a central mass of small, fertile flowers. 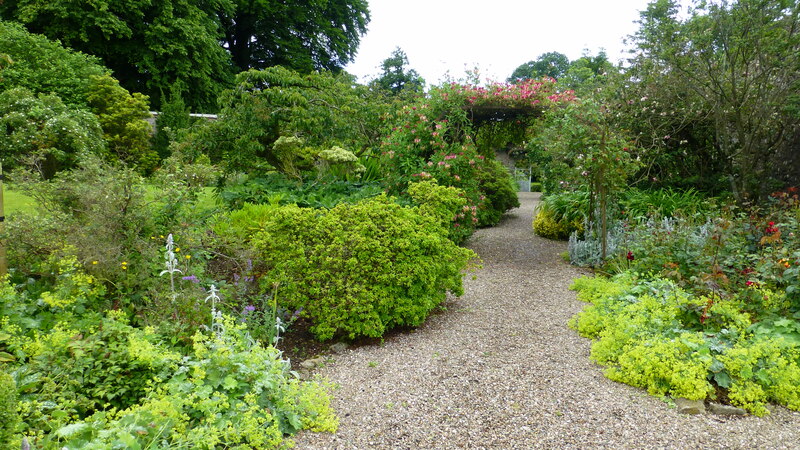 Although the boggy conditions meant that we did not experience all that this great garden has to offer, we were able to spend a lot of time in the two excellent walled gardens. Our trigger fingers were kept busy photographing some fascinating plants and flowers – some of them with that real ‘wow’ factor. In my next journal, we’ll look at some of the plants that attracted our special attention that day. 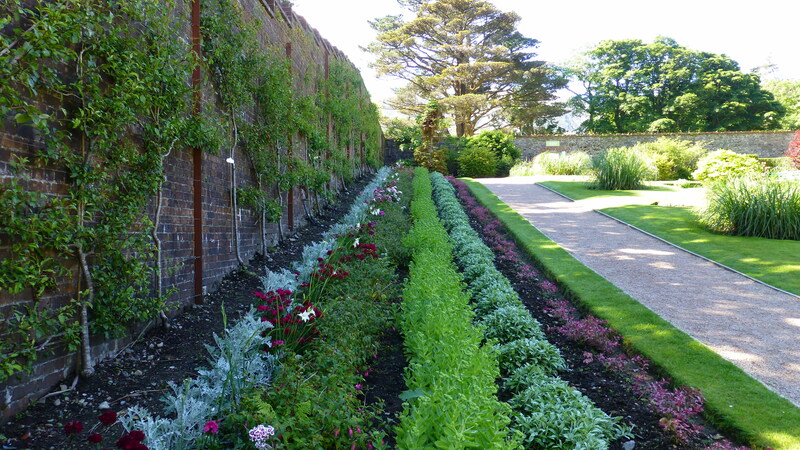 It was so pleasing to see that these walled gardens are kept in excellent condition by the National Trust gardeners. 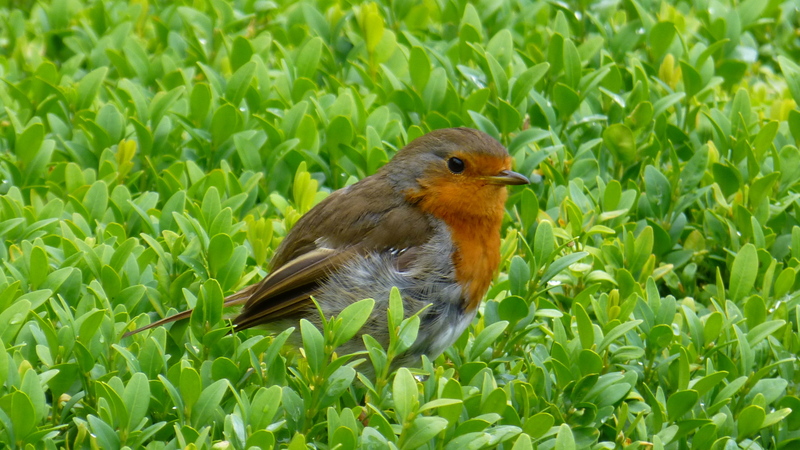 We know that many gardens are not being well maintained in these times of economic downturn, but Rowallane has kept up its very high standards. We recommend it highly. 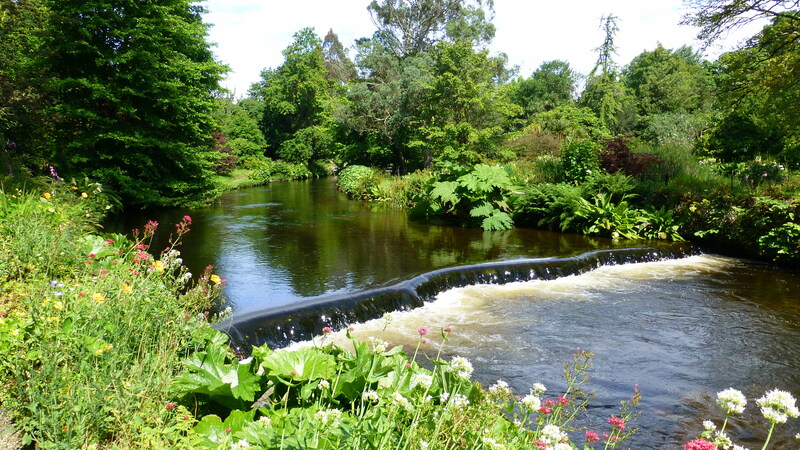 Leave a comment Posted in Gardens of Ireland, Gardens of the World Tagged "Hugh Armytage Moore", "Lady Jean O'Neill", "National Trust', "Reverend John Moore", 'viburnum plicatum", azalea, Candelabra Primula 'Rowallane Rose'", drumlins', Northern Ireland, primula, rhododendron, Rowallane, Viburnum plicatum var. 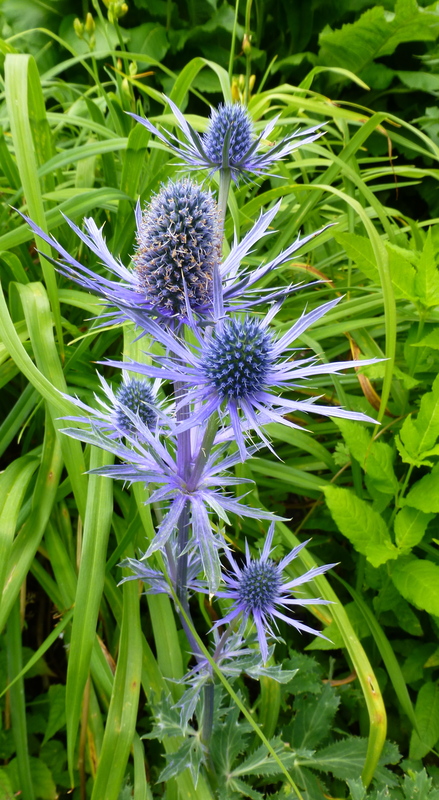 tomentosum 'Rowallane'"
One of the things I really love about exploring gardens is the wonderful variety of plants that gardeners use to express their vision of their garden – for no two gardens are alike. They invariably express something about their creator. And of the plants themselves? Some are old friends that I have enjoyed seeing many, many times: some are variations of those old friends. And some are completely new to me. And I am impelled to learn more about them – to learn their story. I am not a plant expert with botanical names at the tip of my tongue like my horticulturist friends. 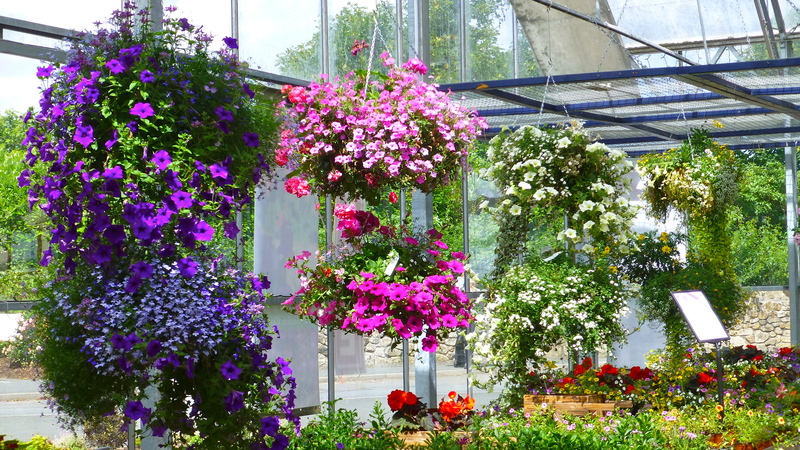 Neither do I know in what conditions and with what care many plants should be grown. What I love about plants is their colour, their texture, their shape, their form. I love to look deep inside a flower, to see how it’s made. 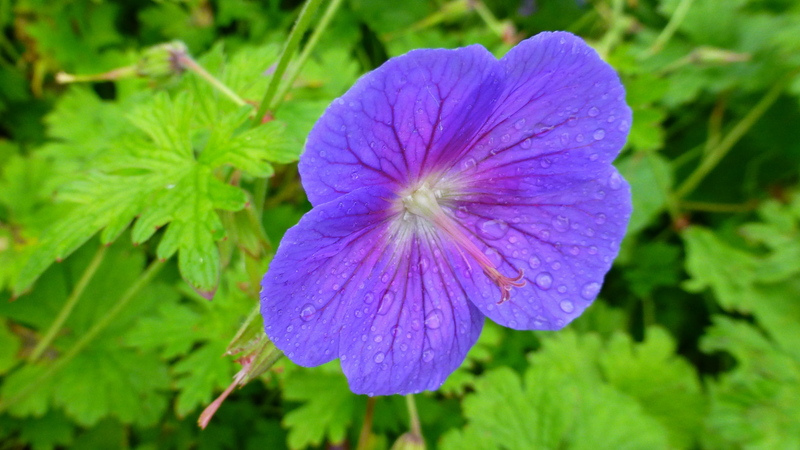 And I love the tiny ones just as much as the big, blowsy ‘look-at-me’ types. 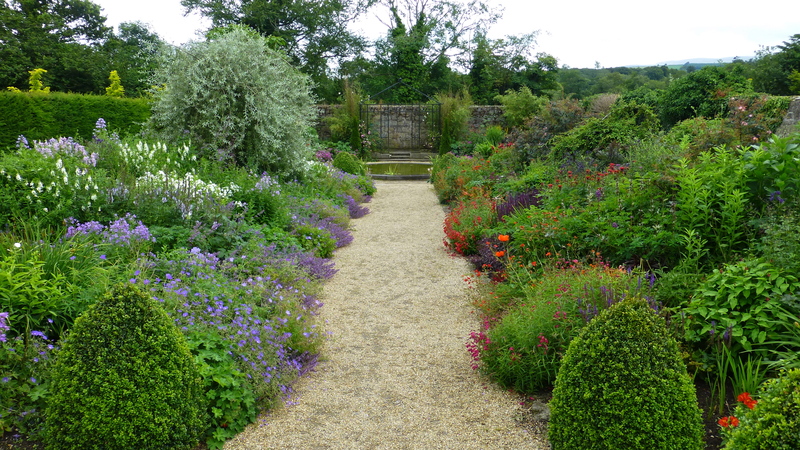 I enjoy looking to see how each gardener puts all those traits together – for that is the art of garden design. 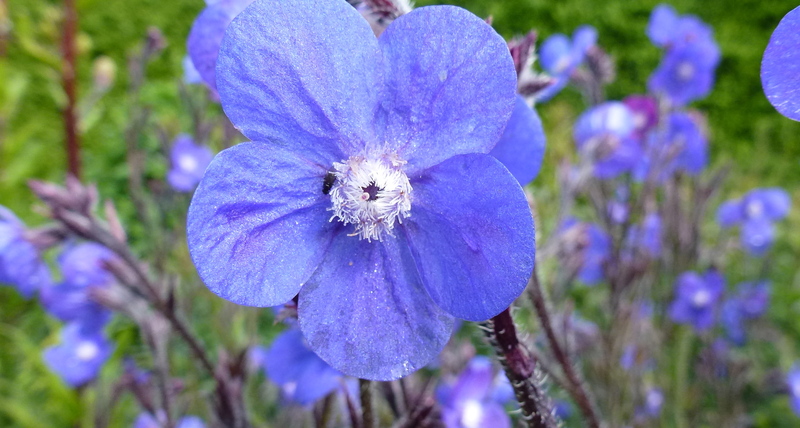 And my photography aims to express the ‘essence ‘of each garden and explore the character of flowers. 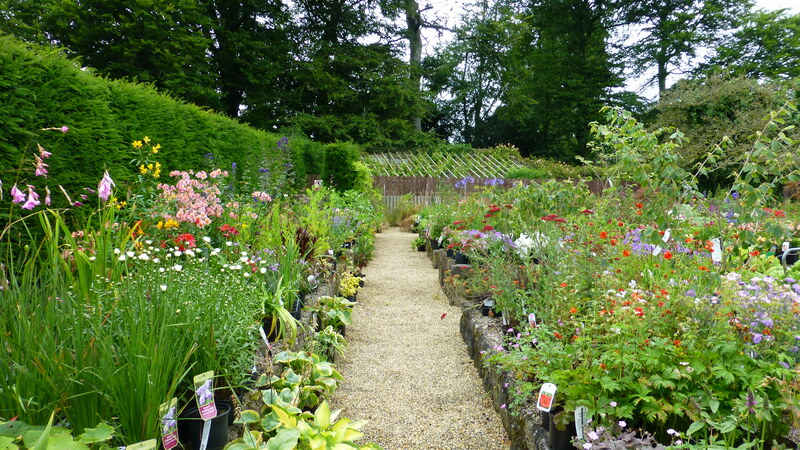 Rowallane’s walled gardens are those of a dedicated plantsman, Hugh Armytage Moore, a collector of a rich variety of plants and seeds originating from all corners of the globe. 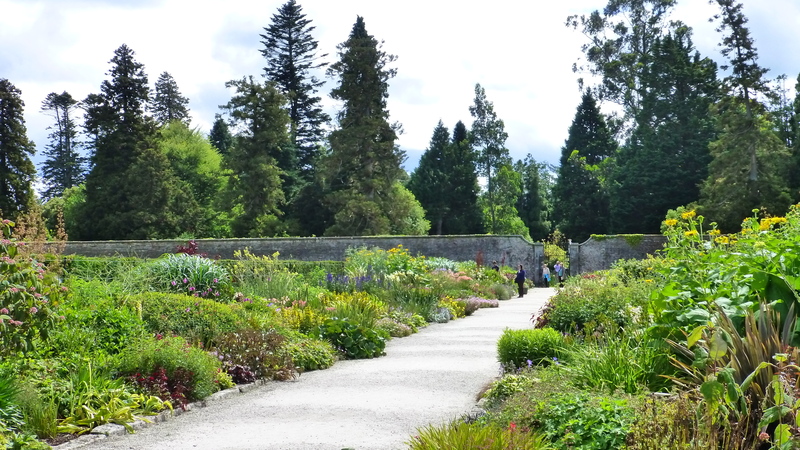 So I expected that a walk in these two walled gardens would be something of a ‘world tour’ of plants and I was not disappointed in that. We found plants growing happily side by side that came originally from places as far apart as Africa, Chile, Asia, the Himalaya and across Europe. 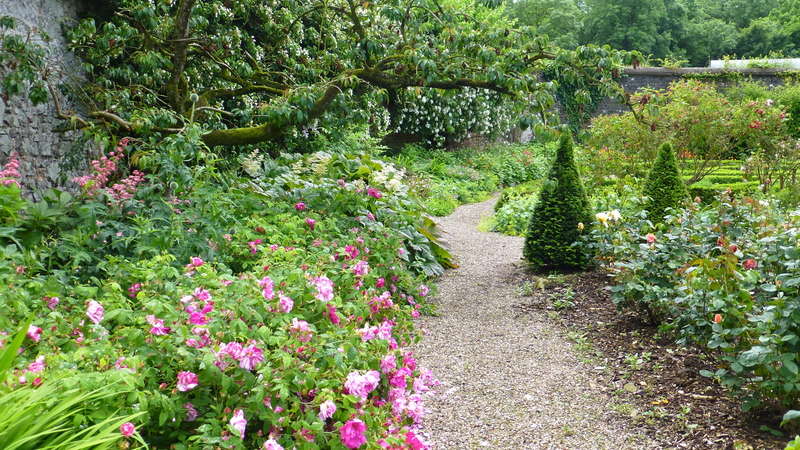 We began our wander in the smaller, lower garden. 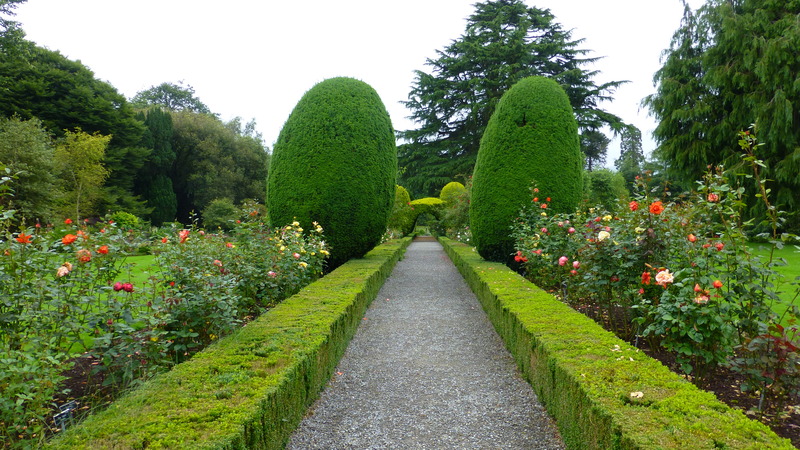 It wraps around the larger rectangular walled garden in an L shape. 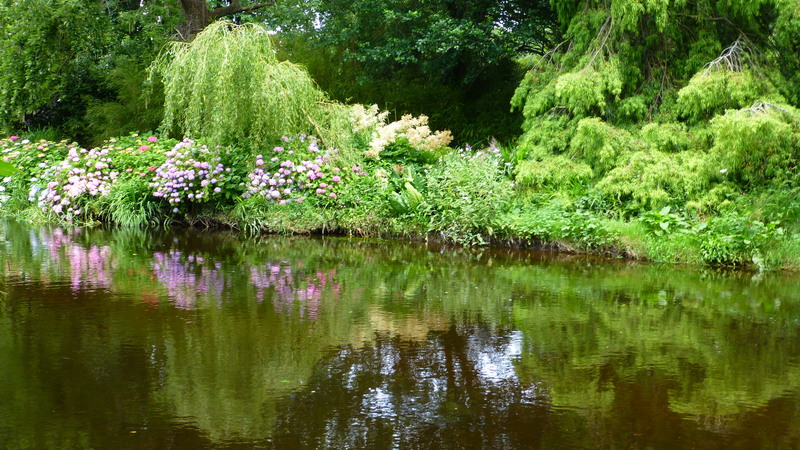 The shorter side is flat and shaded with a pond as the focal point. 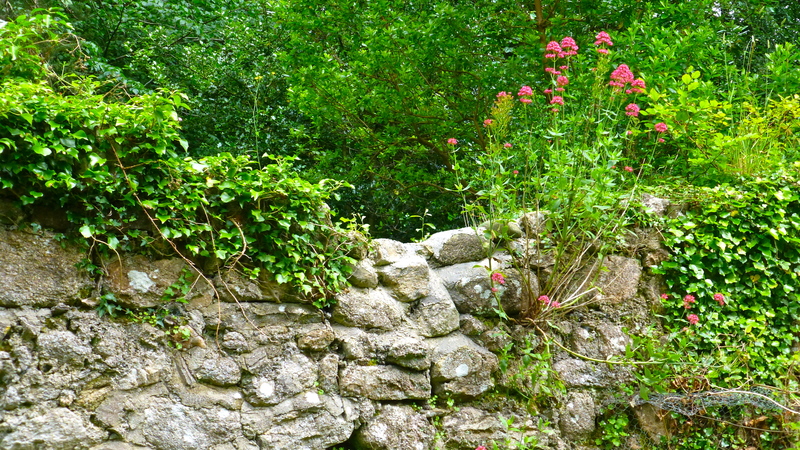 The longer side rises up a slope allowing for plants that need a warm, sunny but sheltered place against a wall. And here there are glimpses of the woods beyond. The path from the stable area leads across the ‘foot’ of the L shape. This was once the nursery area and one can really imagine Hugh Armytage Moore and his gardeners working in here on their plant cultivation and propagation. 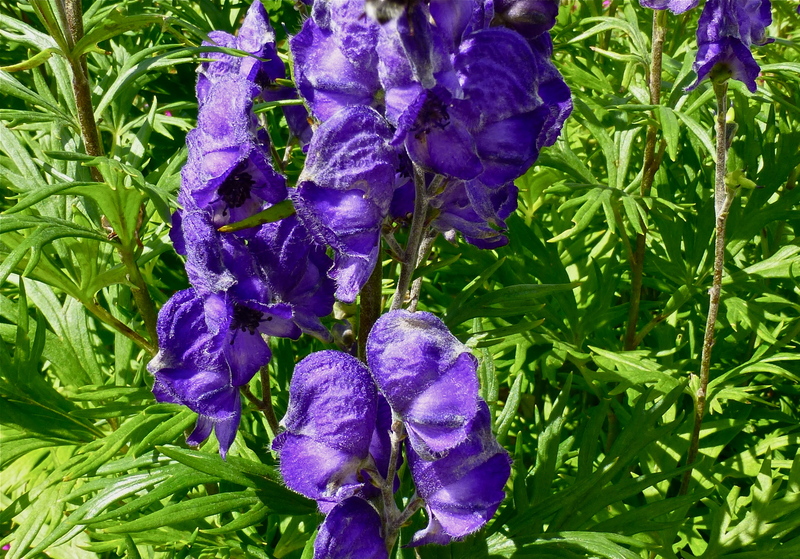 Many of the plants seen in the gardens today are the result of their untiring efforts. 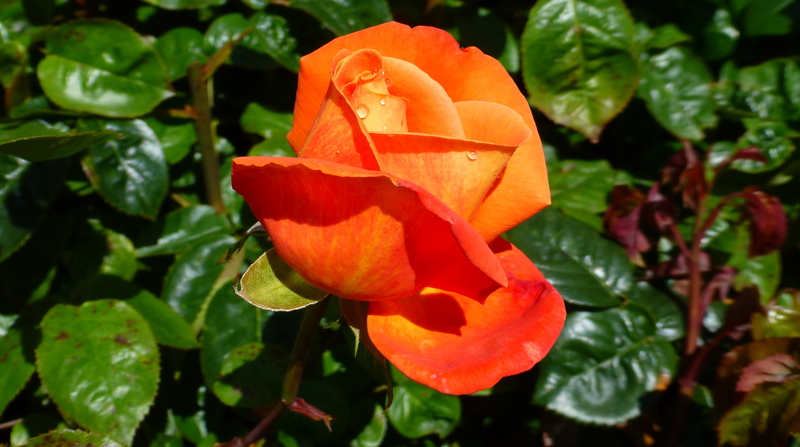 (For his story, read the previous journal entry which relates to the history and development of the garden.) 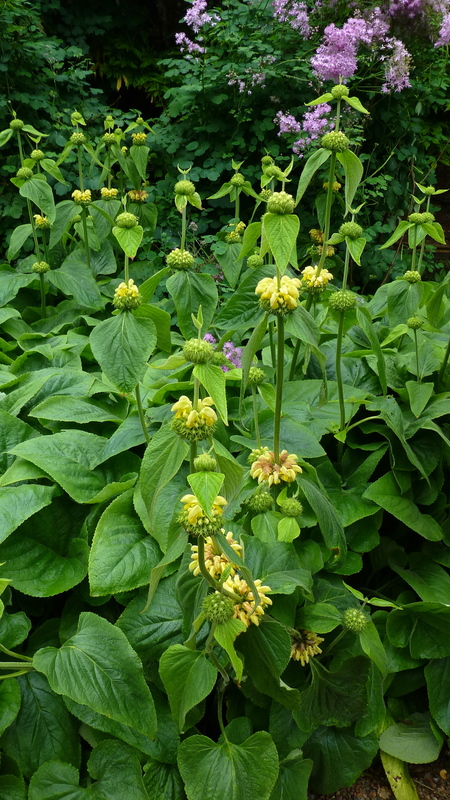 The first plant that caught our eye was the yellow flowered Phlomis in the very foreground of this photo. Neither of us had seen it before. 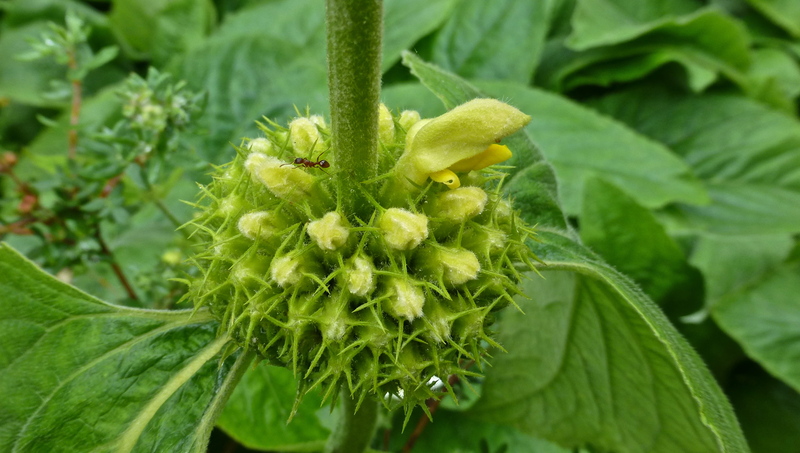 This close up of the Phlomis flower buds emerging shows the prickly ‘encasement’ whirl, the ones at the top unfurling first. 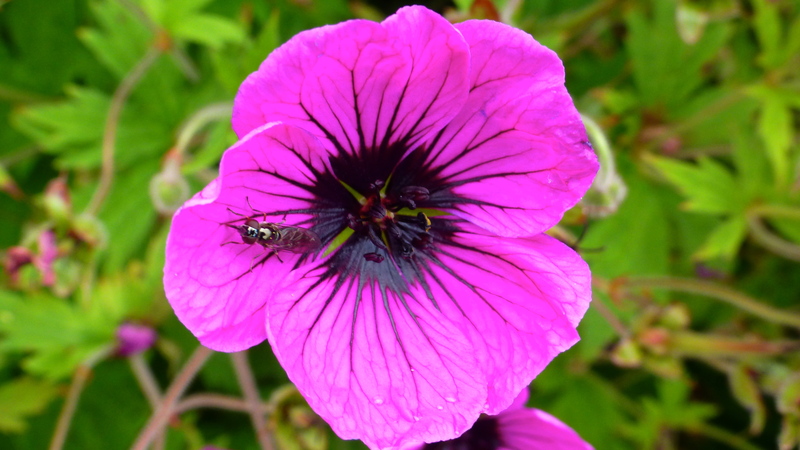 With their sweet nectar, these flowers attract birds, bees and butterflies, insects and ants – like the one above. 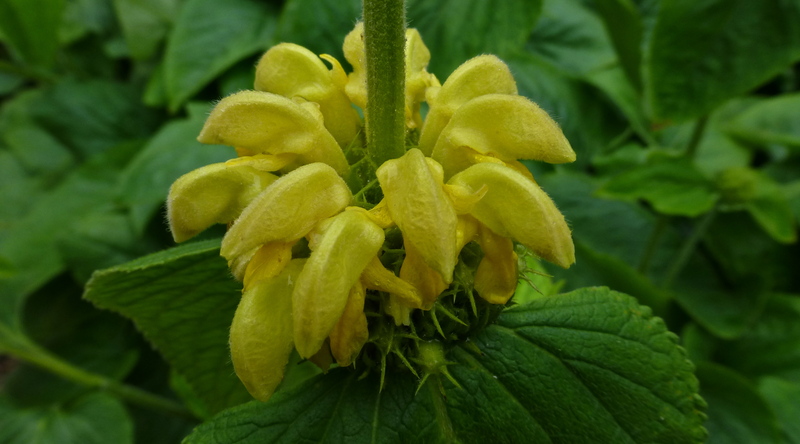 This group of Phlomis plants certainly ‘grabs’ attention. 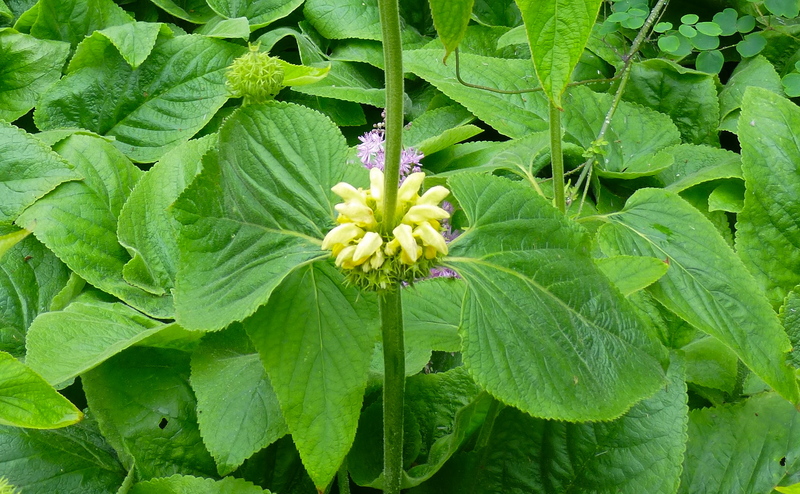 The tubular flowers, arranged in tiered whirls, are spaced out along stiff upright stems which rise above the mass of deep green foliage. 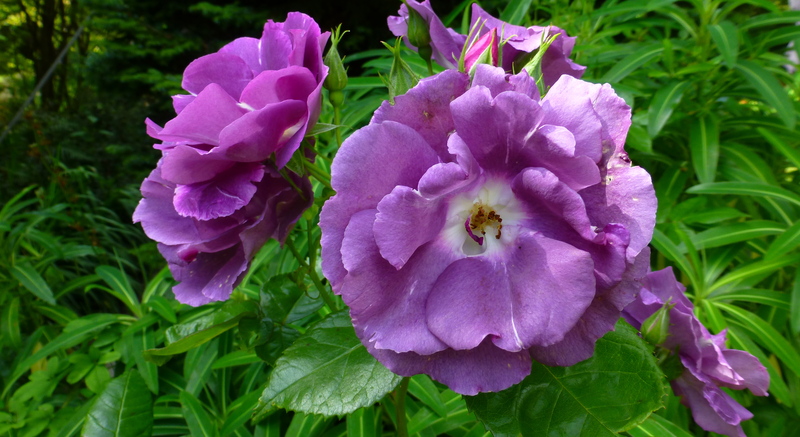 It certainly is a show stopper, accentuated by the softer leaved, pale mauve flowers in the background. 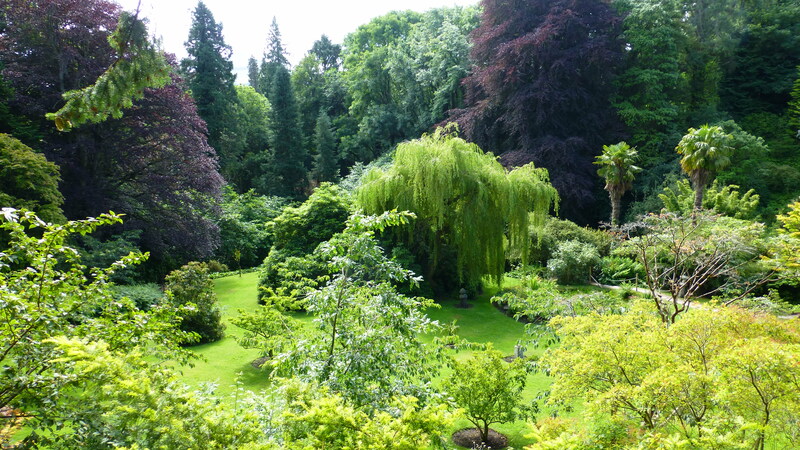 Further along, the garden was a vision of green set off by the variegated leaves on the right hand side and by that touch of red/orange in the background towards the left beyond the tree. 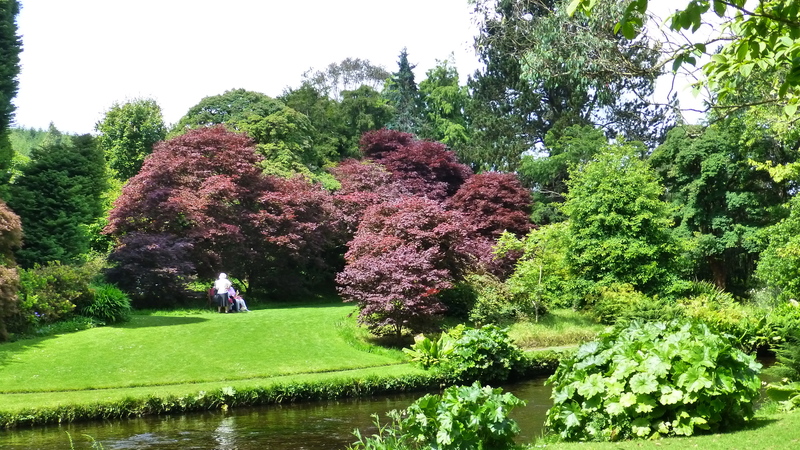 When I see this touch of red in a green ‘landscape’, I’m always reminded of that famous English artist, John Constable, who often used small brush strokes of red paint to direct the eye through the landscape and to emphasise the intensity of the greens and browns. It always works! 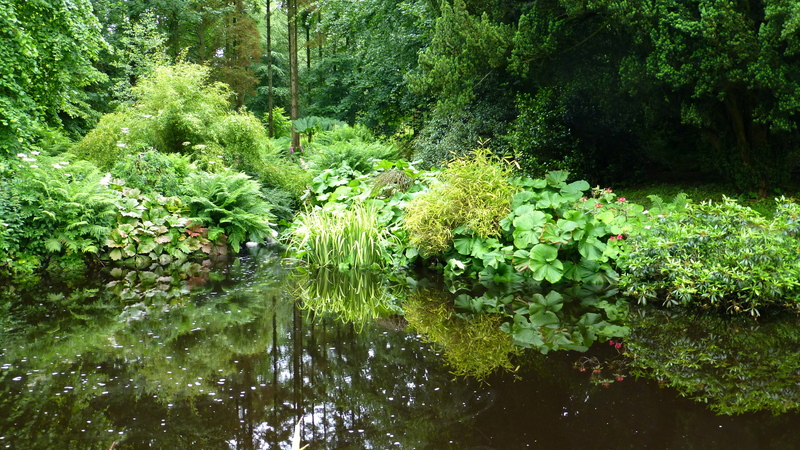 The plants in the small pond area are all green. Here the white urns are used to relieve the greens. 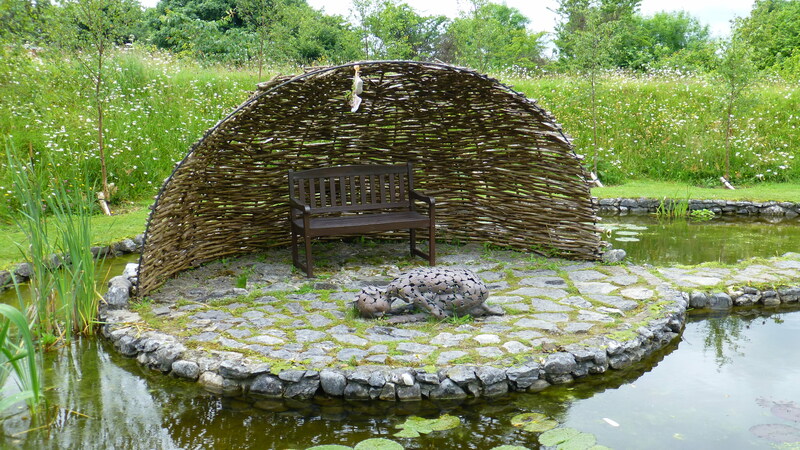 A skilful blend of the textures and shapes of ferns and grasses take the eye in a circular motion around the pond. 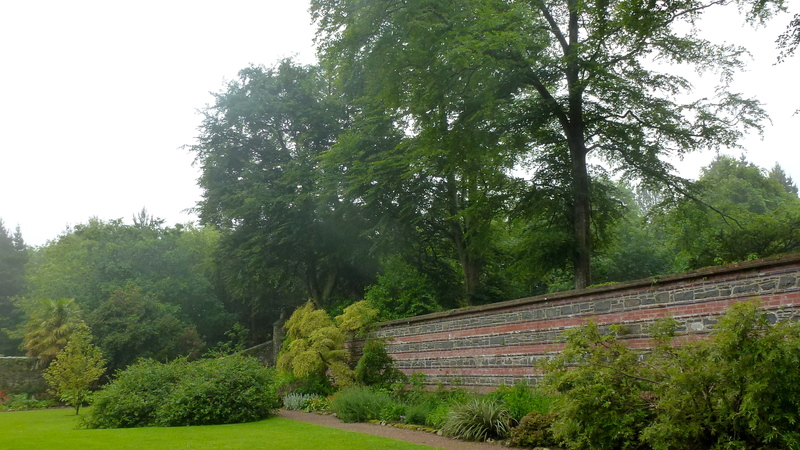 In the background, the old grey stone wall is softened by an espaliered tree. In the fore ground are the very different, softer, more rounded leaves of one of the lovely Alchemilla species, or Lady’s Mantle, growing over the edging rocks. 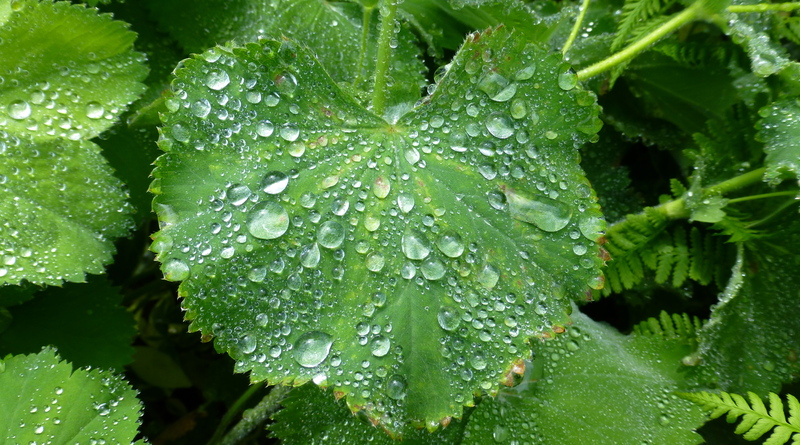 One of the benefits of ‘walking in the rain’ in a garden like this, is to enjoy the beauty of raindrops on Lady’s Mantle leaves. 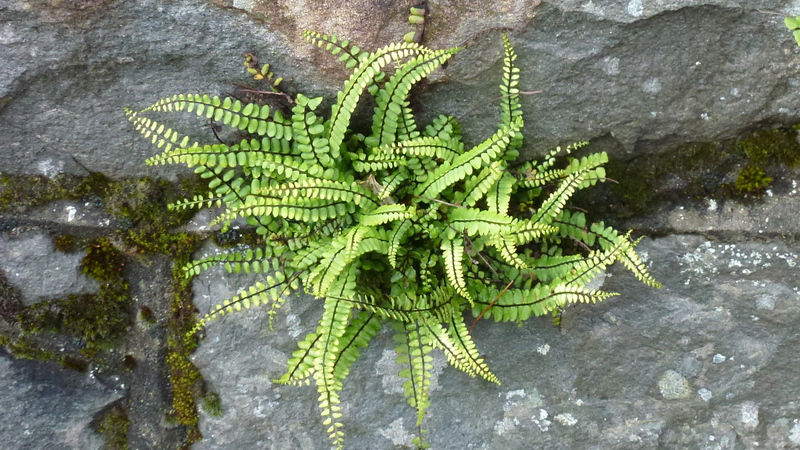 Maybe that’s why in rainy Ireland, this plant is so often used as rock covering and path edging in gardens! 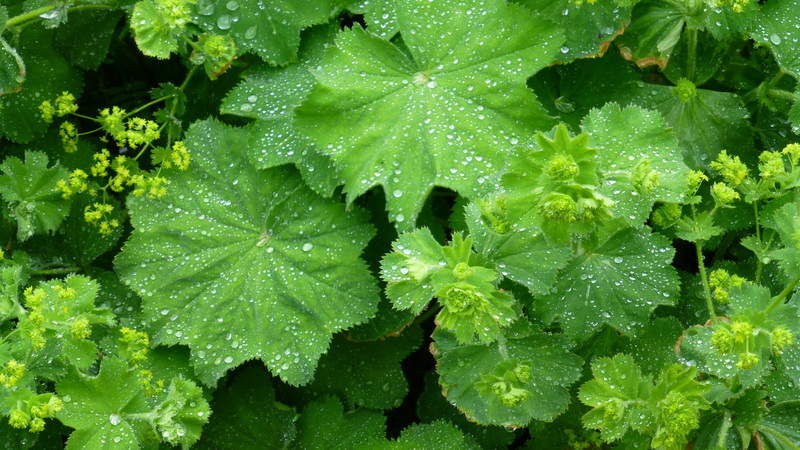 The origins of most species of Alchemilla is Europe, but not Ireland, with only one species being native to Antrim in Northern Ireland. 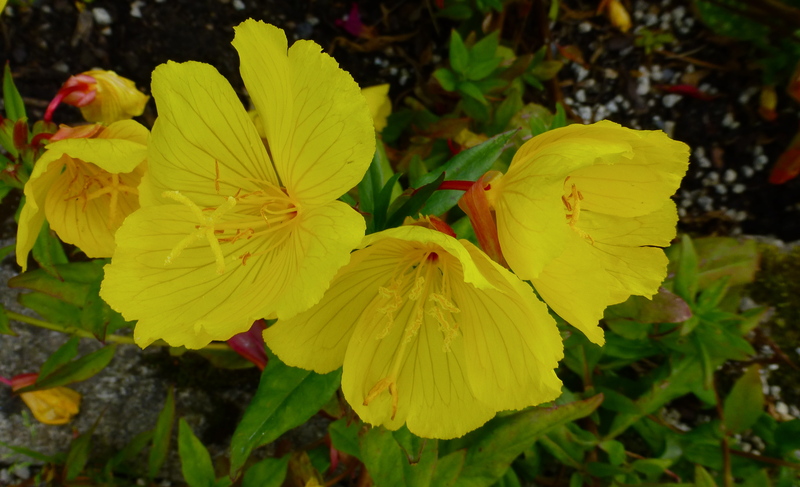 I delighted in this plant when I lived in Switzerland and was pleased to find it here – as an old friend. 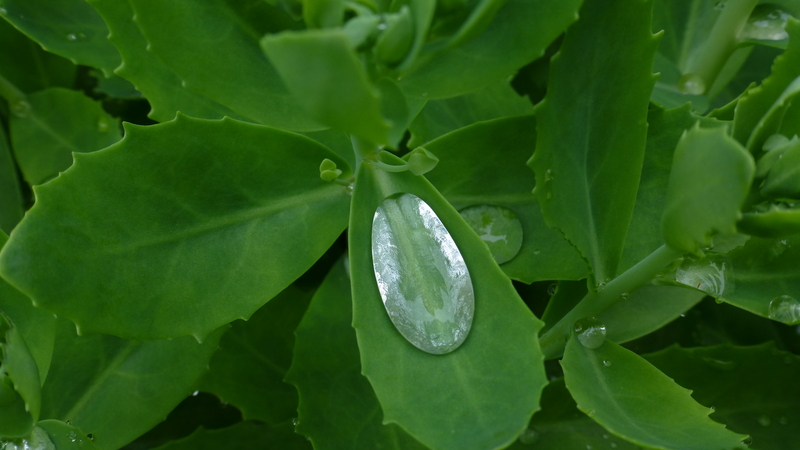 Several leaves in this area made perfect receptacles for jewel-like ‘crystals’ of rain. How perfect is this one? That dash of red amongst the greens in an earlier photo was this clump of Primula bulleyana , better known to most as Candelabra primula. 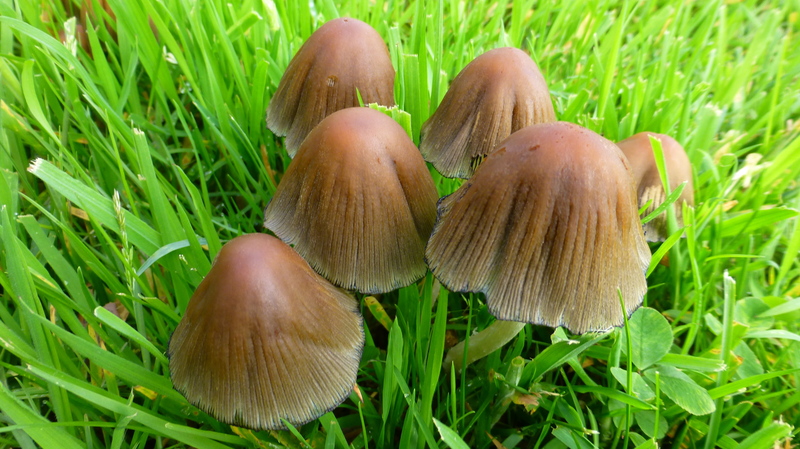 They originate in China and the Himalaya and enjoy woodlands, damp or even WET places. They had found a perfect home here! 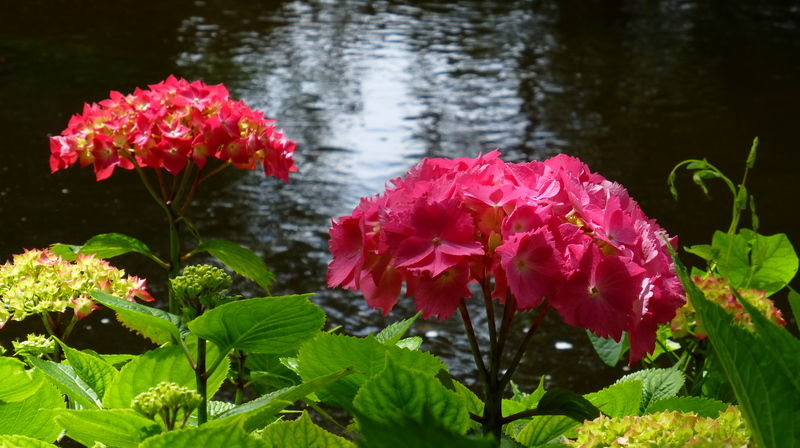 The softness of these flowers was in perfect contrast to the great, architectural leaves of Gunnera behind them. Most large leaved Gunnera, a genus named after the Norwegian botanist Johann Ernst Gunnerus, originate in South American countries like Brazil, Chile and Columbia. 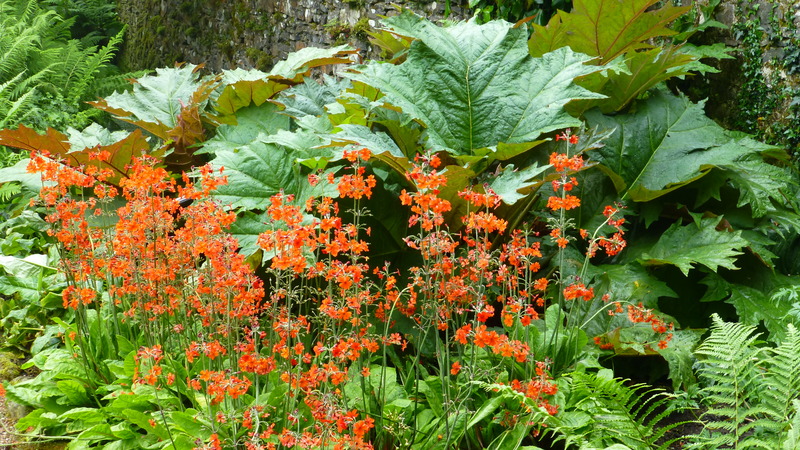 Gunnera is sometimes called ‘giant rhubarb’, although it’s not for the dessert plate! It also likes to live in damp conditions, so these two very different types of plants, from two different continents, two different hemispheres, live happily together in this ‘global’ garden. Another plant used to make a textural statement in this area is a Hosta, with leaves that also catch those rain drops. 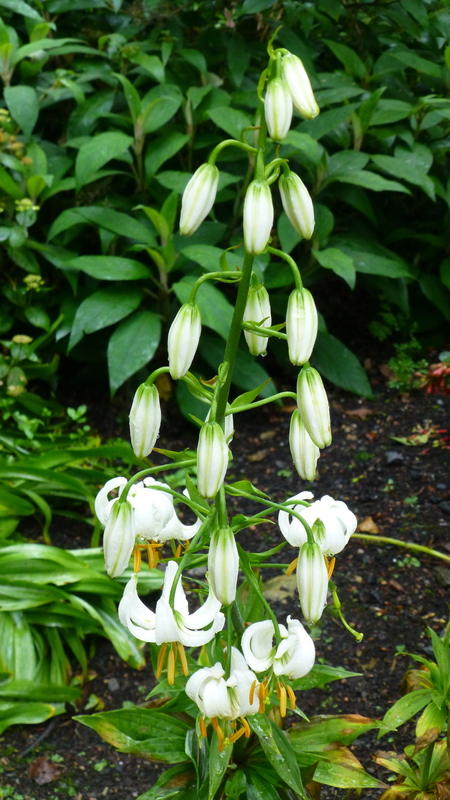 Hostas originate in China and Japan and were introduced to Europe in the mid 19thcentury. More recently, some species have been discovered on the Korean peninsula. 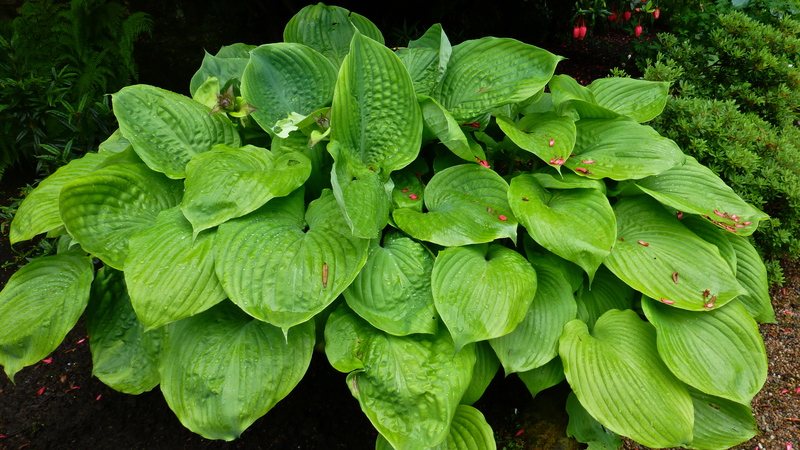 Although there are about 45 species of Hosta, it’s estimated that there are over 3,000 varieties available to gardeners because of hybridization among the many species. No wonder they are so popular with gardeners in so many parts of the world. The red on these leaves are the fallen petals from the tree above – another example of a touch of red highlighting green. 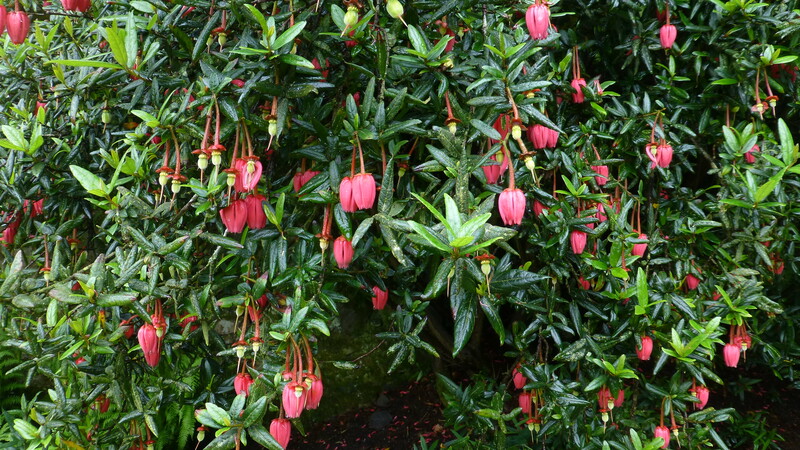 The tree in question is the delightful, Crinodendron hookerianum. 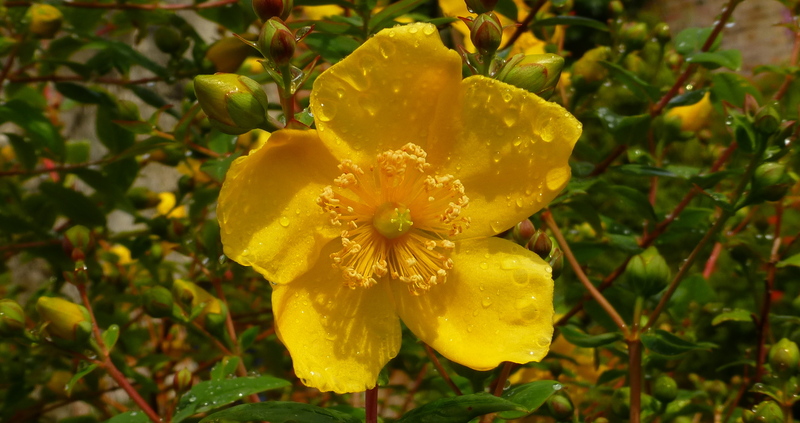 Its botanical name comes from the Greek: krinon meaning lily and dendron meaning tree. 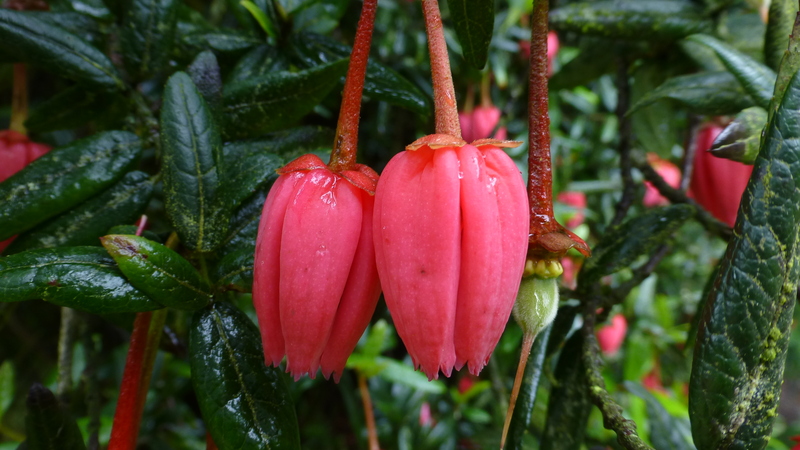 It’s common name is Chilean Lantern Tree and, yes, it is endemic to Chile. 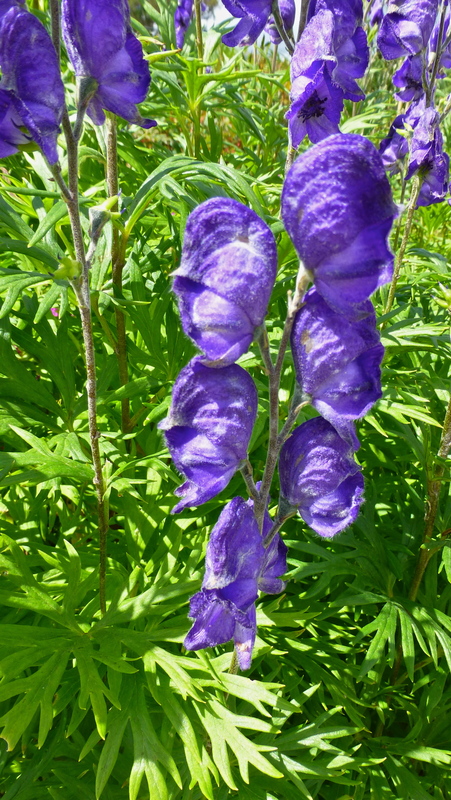 Botanically, the flowers are urceolate in shape – shaped like a pitcher or urn – though in this case upside down. And the shiny dark green leaves are alternate and described as llanceolate, long and narrow with a pointy tip – lance shaped. It’s not just the flowers that are fascinating but the dagger-like seed heads are interesting, too. It’s a difficult plant to photograph. To begin with the flowers are red – always a problem, and the rain makes the waxy petals and leaves even shiner, throwing back the light. 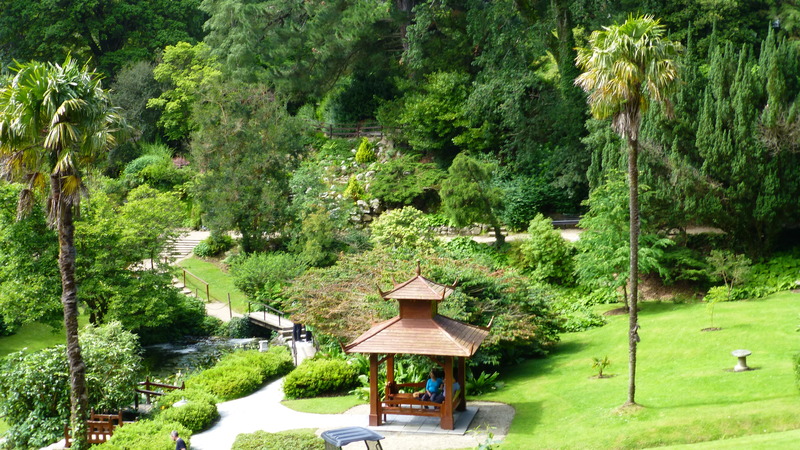 It’s another plant in this garden that is far from its original home – half a world away. 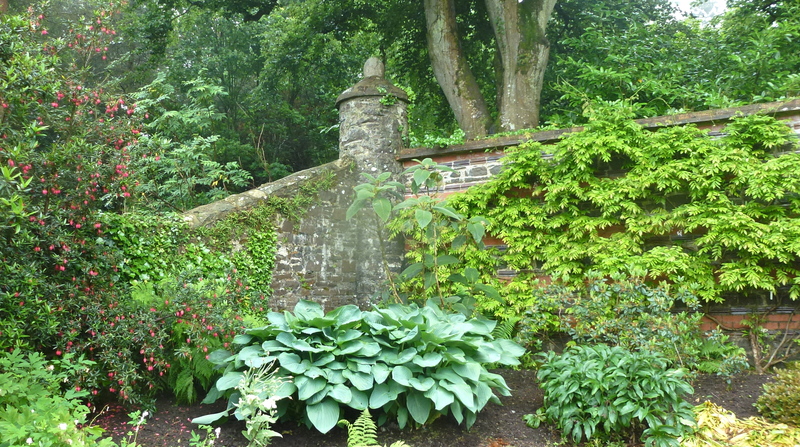 The Crinodendron (left) shelters in the corner of the garden where the old stone wall meets a newer stone and brick wall. Beyond the wall is a glimpse of the woods. 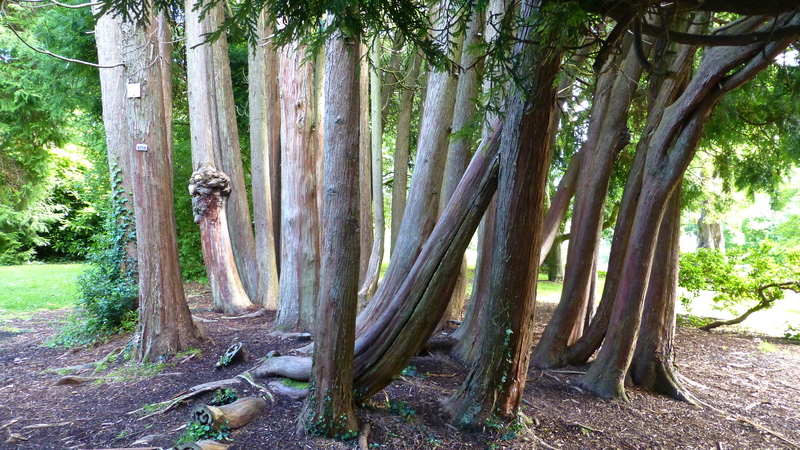 Those trees not only provide a delightful background to this garden, but, and very importantly, they provide shelter for the tender plants in this garden from the worst of the weather. Turk’s cap lilies always make a statement in a garden. 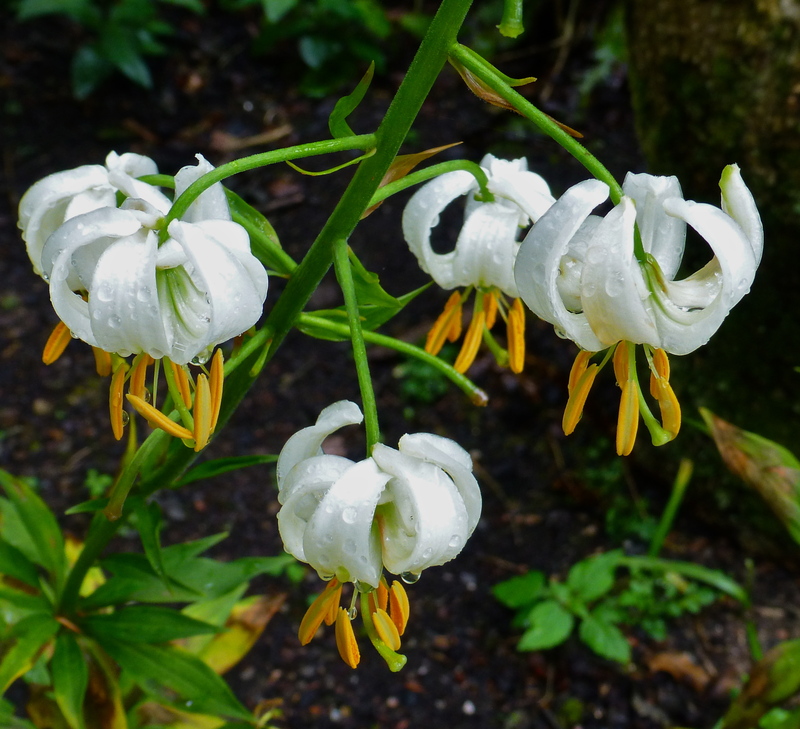 These white ones are Lilium Martagon var. Alba. The Martagon lily is common in Europe especially in the Alps where it’s generally found in meadows up to an elevation of 2100 m (7000 ft.). There are several white forms in cultivation, like L. martagon var. 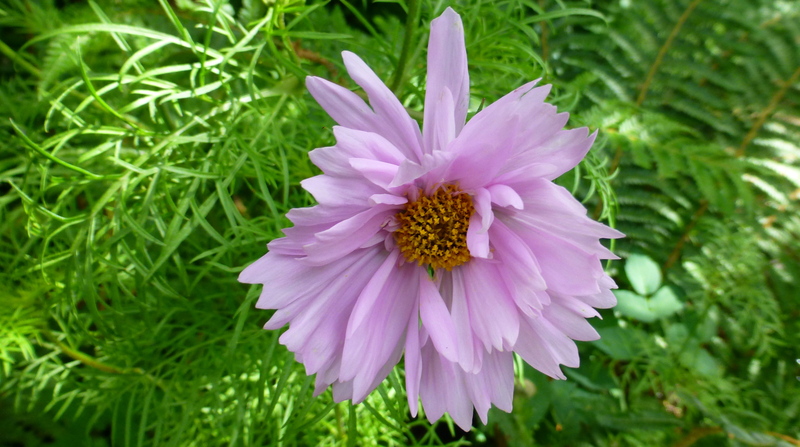 Alba, which has been grown as a garden plant since the 16th century. 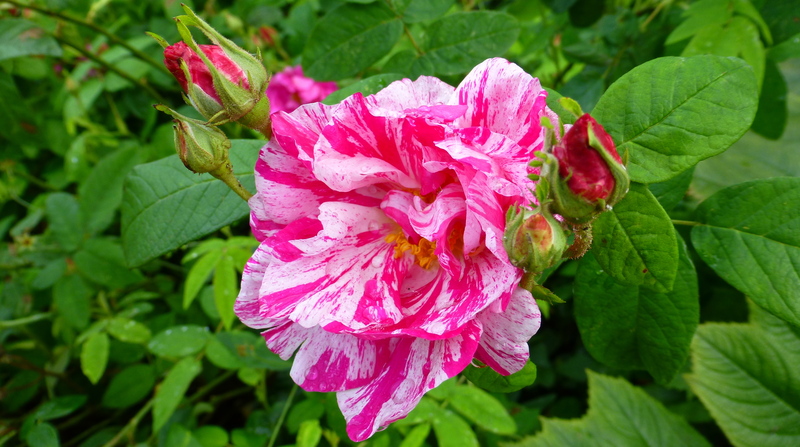 It received a First Class Certificate from the Royal Horticultural Society as long ago as 1889. 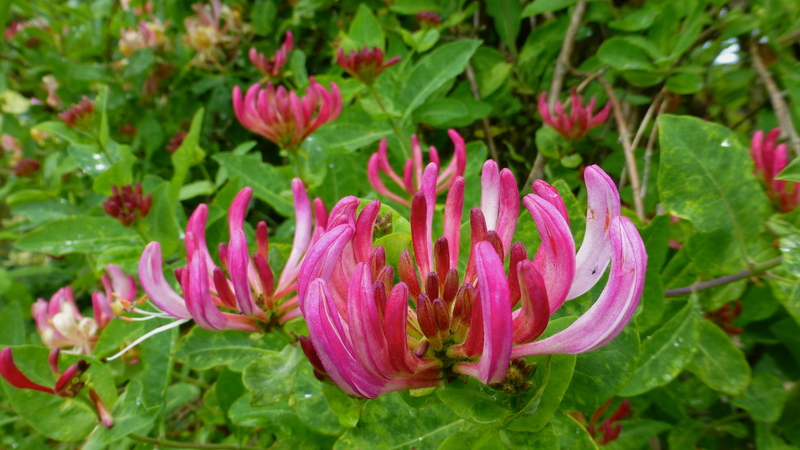 It’s a very stately plant with up to twenty flowers on stems that are strong enough to withstand wind. 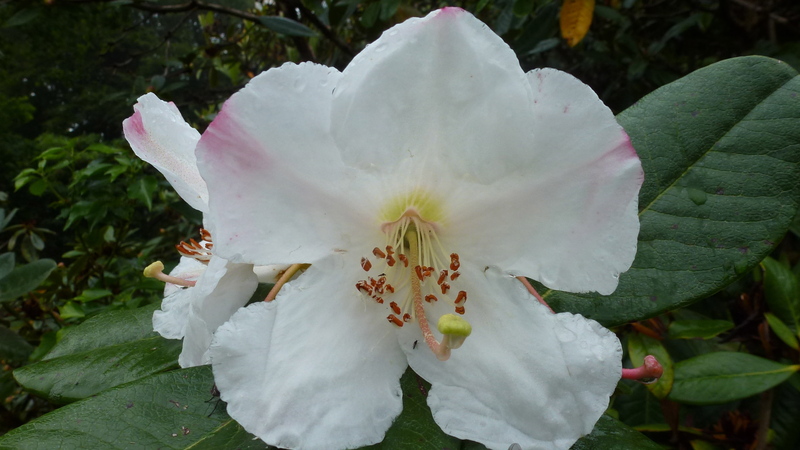 The clear ivory white flowers with their perianth segments rolled backwards are complemented by the orange anthers. 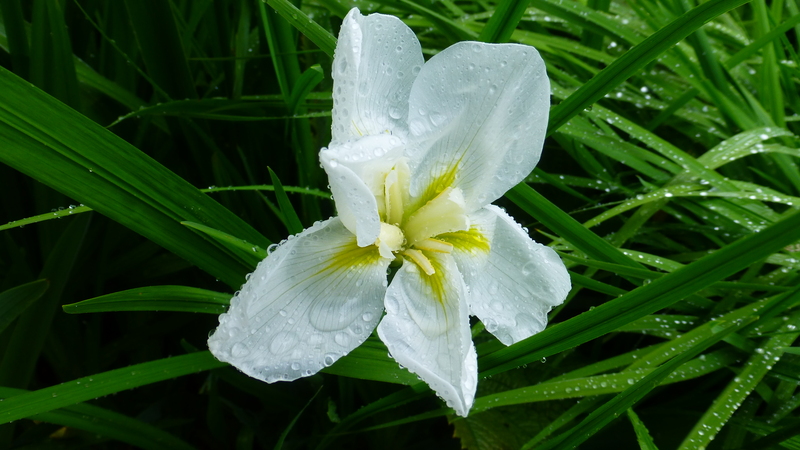 Many of the other lilies had been spoiled by the rain – but not these beauties. 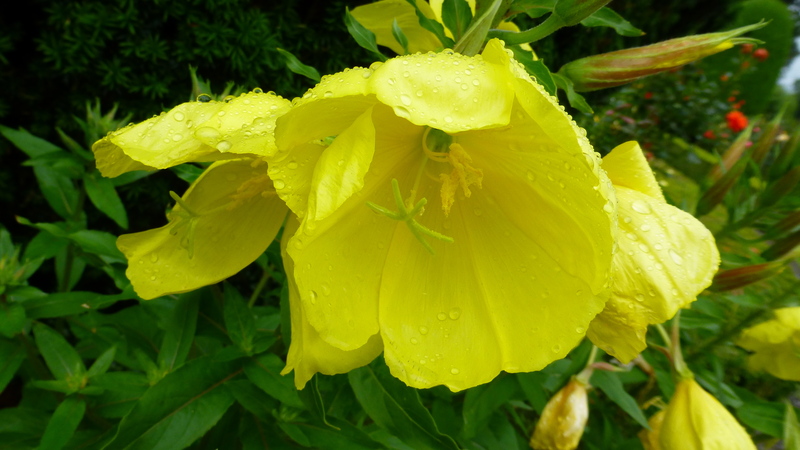 They were enhanced by the rain drops. 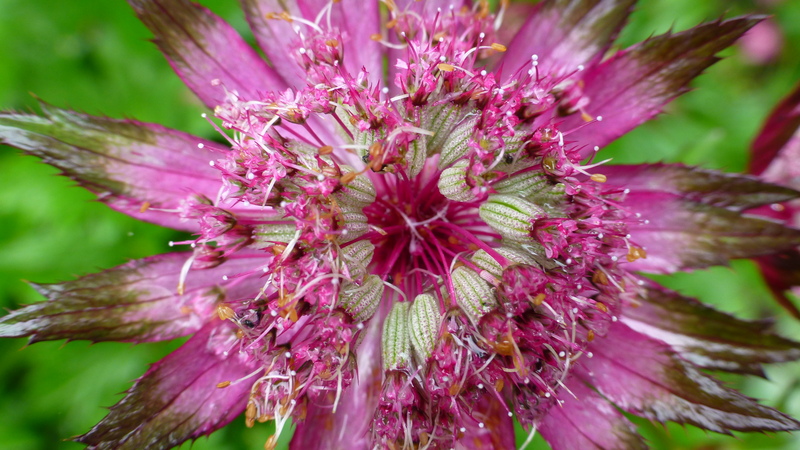 Another plant to catch the eye in this part of the garden was Astrantia, an herbaceous plant native to central, eastern and southern Europe and the Caucasus. 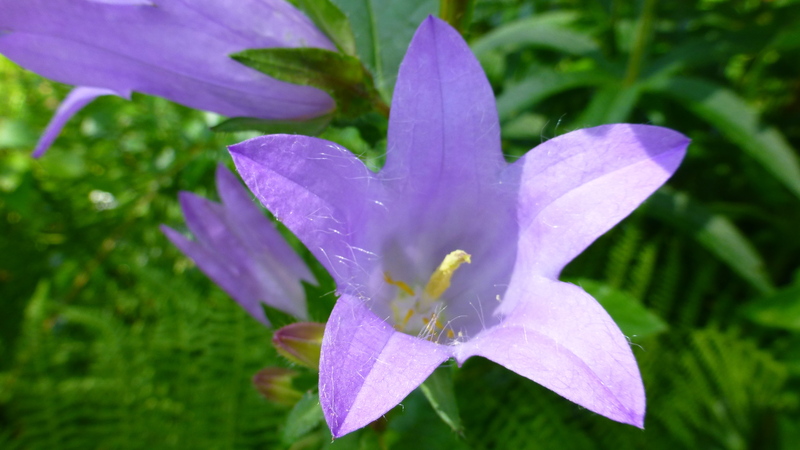 The name comes from the Greek word for star – an obvious reference to the flower. 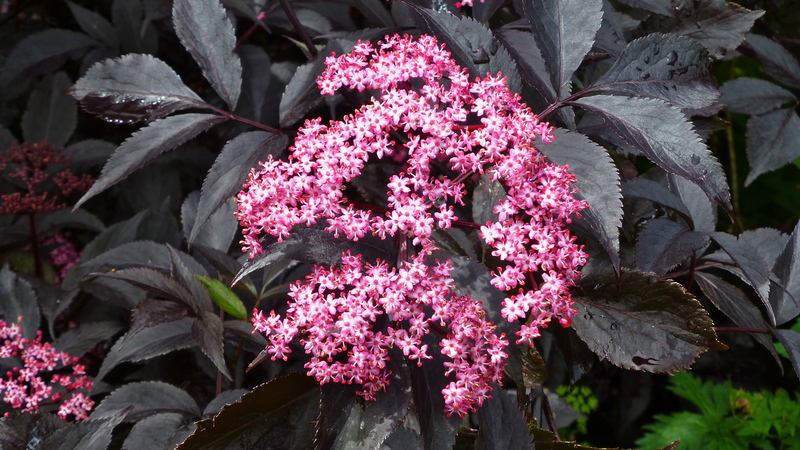 Their common name is Great Masterwart – not to be confused with Masterwart, Peucedanum ostruthium. It is this sort of confusing common naming of plants that makes it so important to refer to their botanical names. 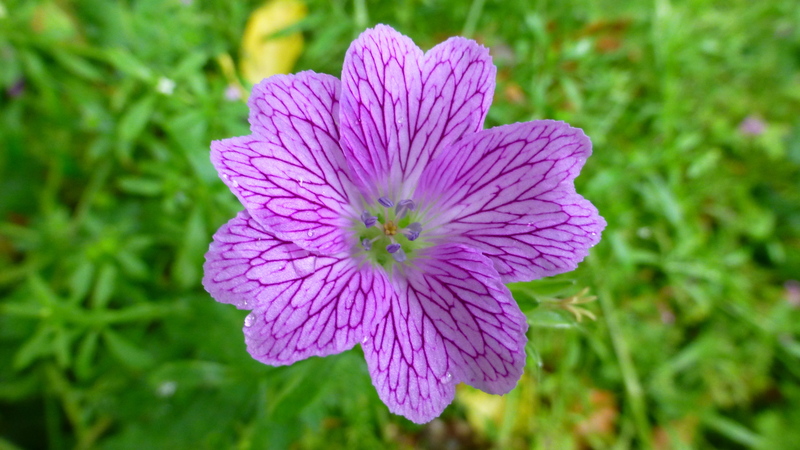 This beautiful flower, in close up, shows just how complicated a seemingly simple flower can be! 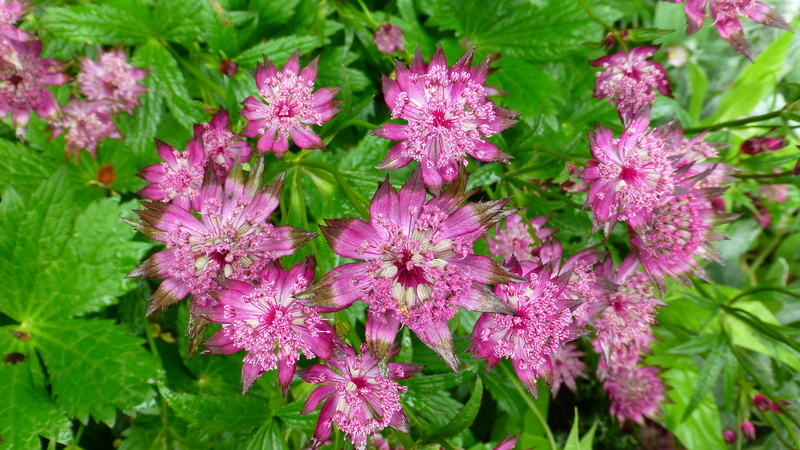 We were to see Astrantia used in many gardens. 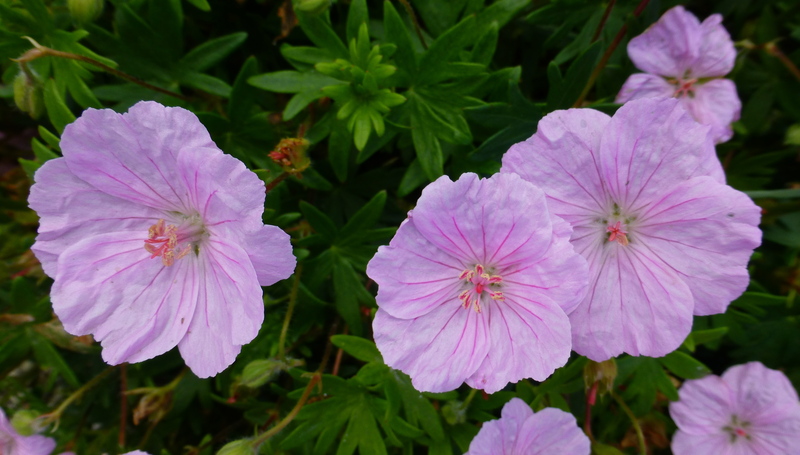 It’s a compact plant with many flowers that works well in boarders. 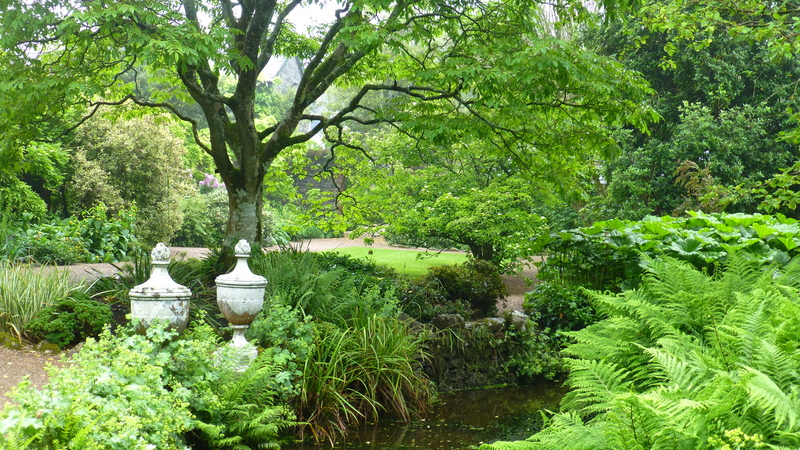 It was delightful to spend time in this peaceful garden. 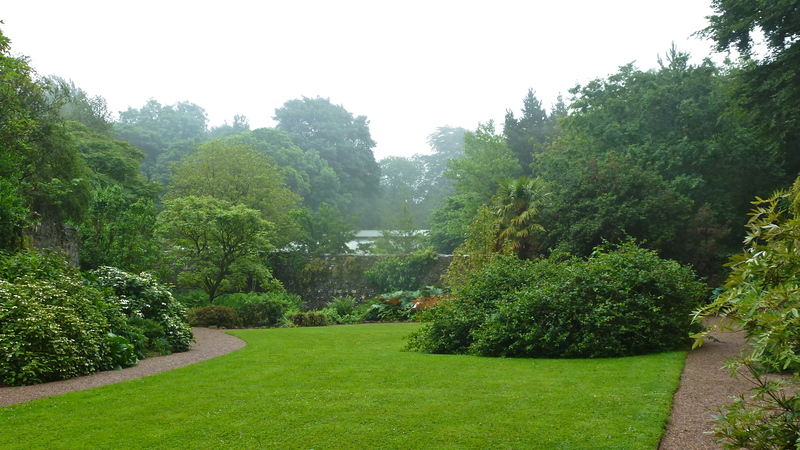 We had it all to ourselves – maybe a plus for a rainy day! 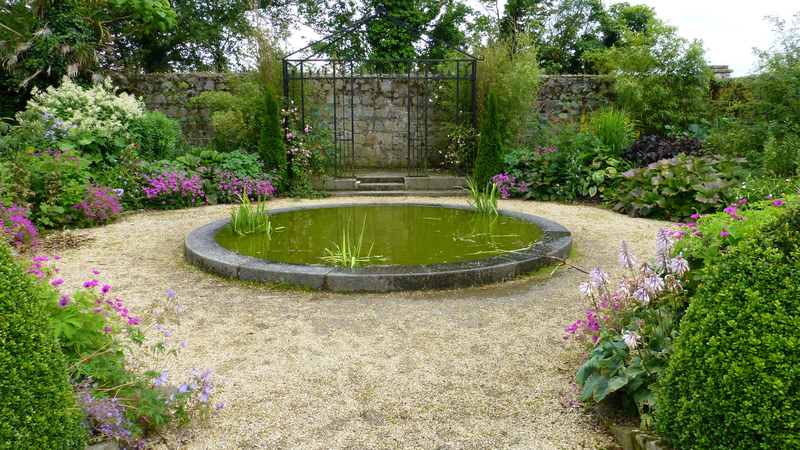 But we still had the larger walled garden to explore, so it was time to wander back by the pond and find the arch that would lead us into the main garden. And the plants we found in that garden will be the subject of my next journal. 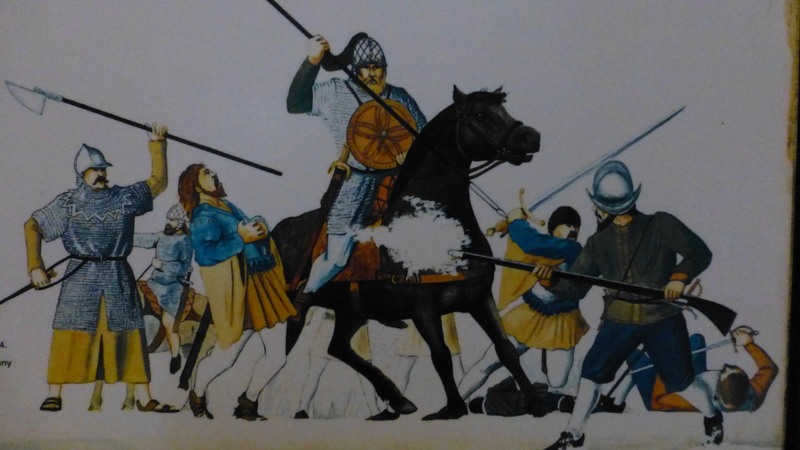 Rowallane is just south of Saintfield on the Belfast to Downpatrick Road. It’s a National Trust Garden.